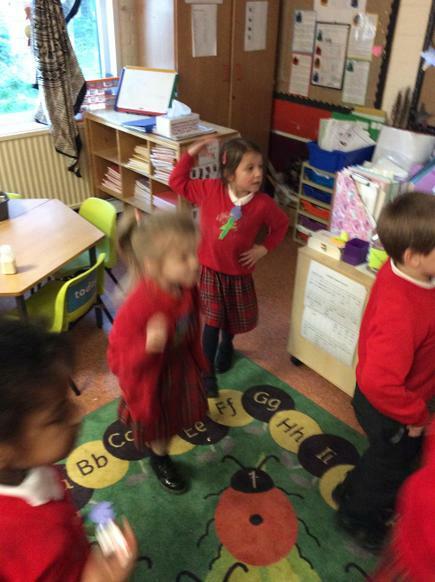 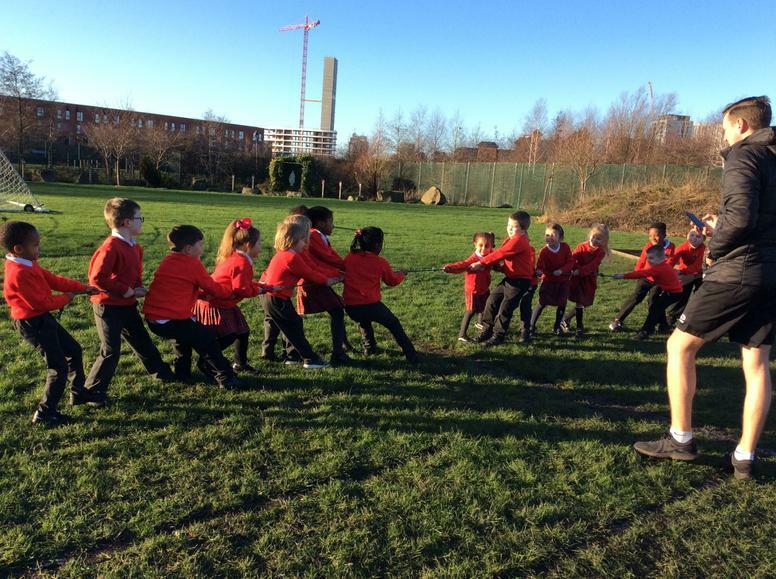 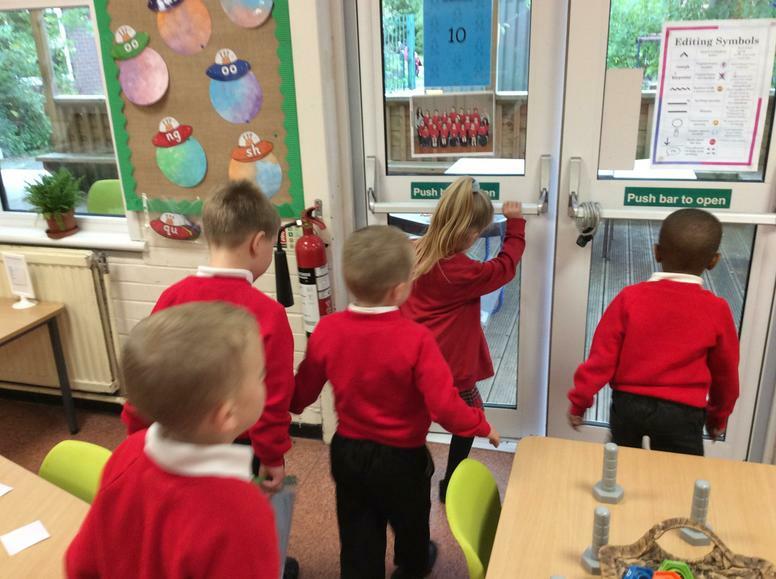 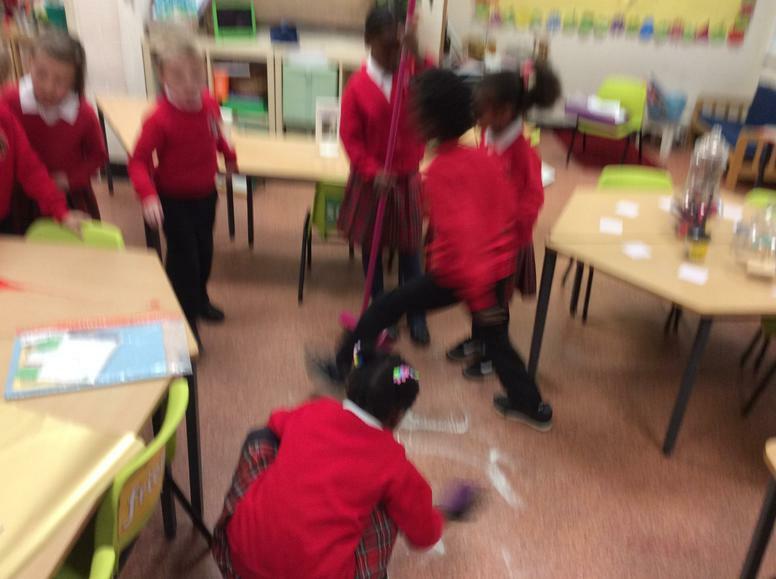 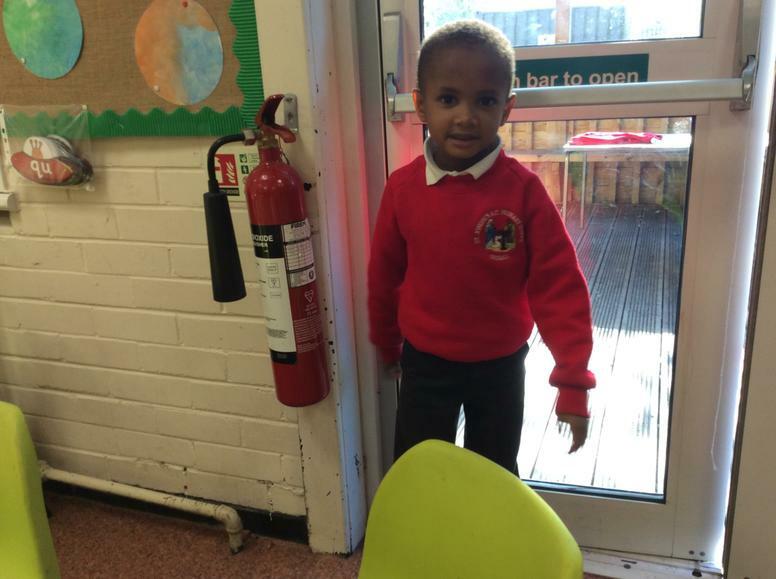 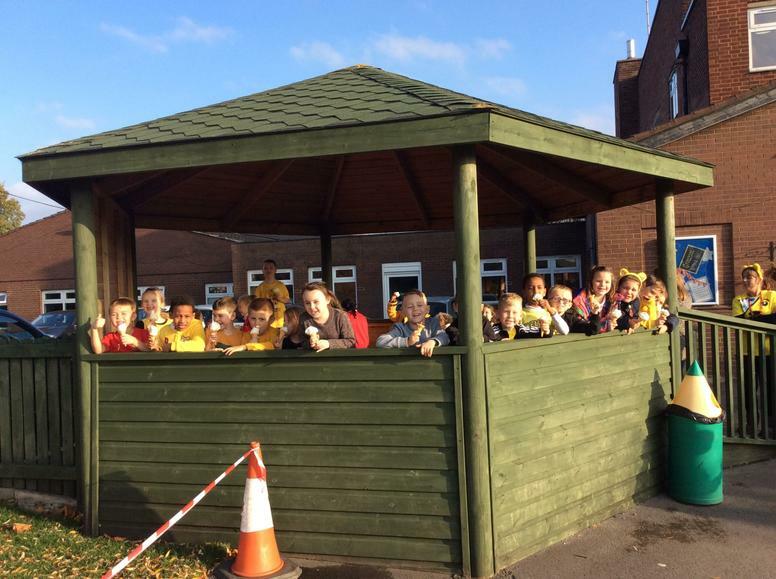 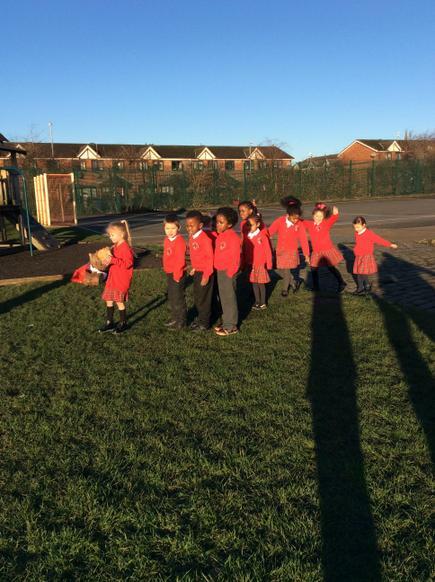 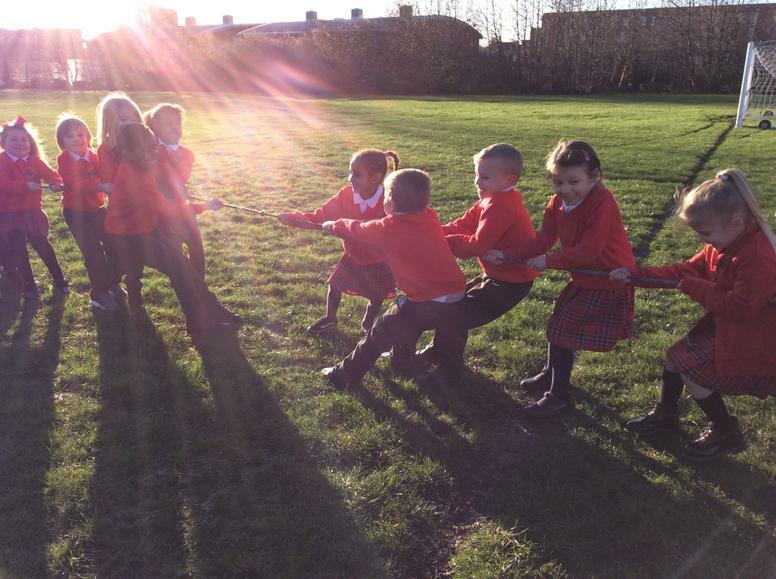 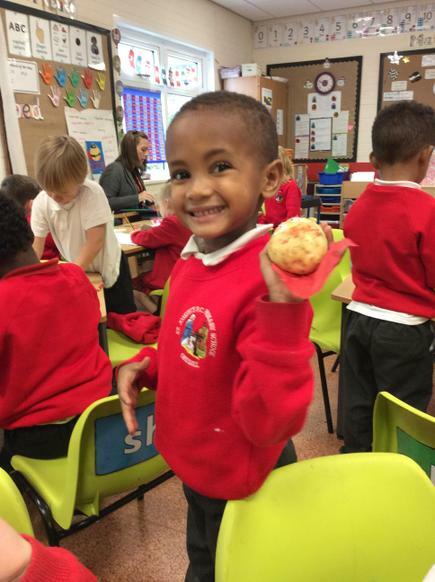 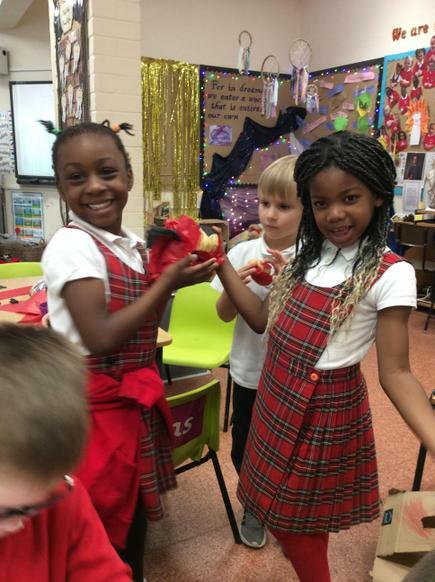 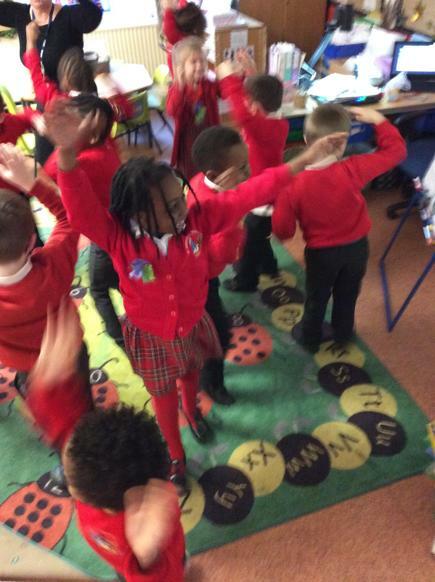 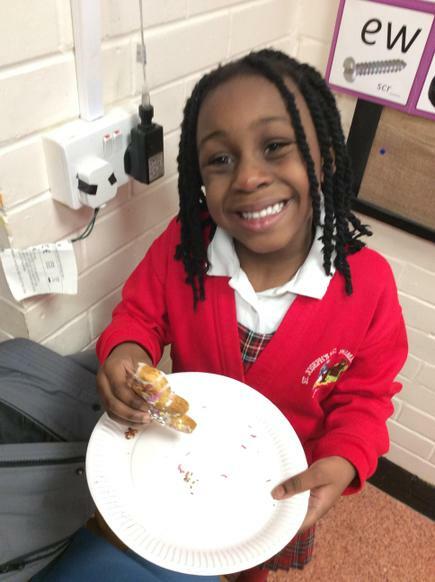 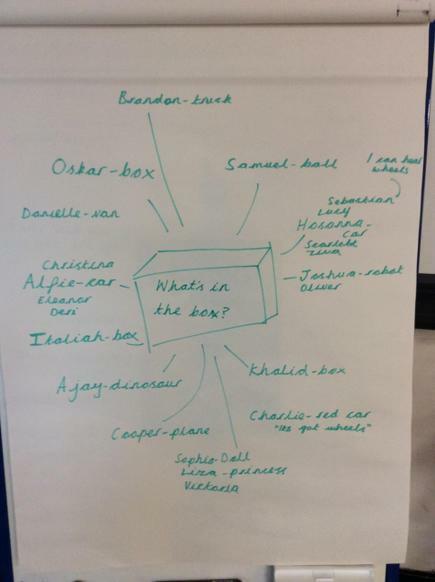 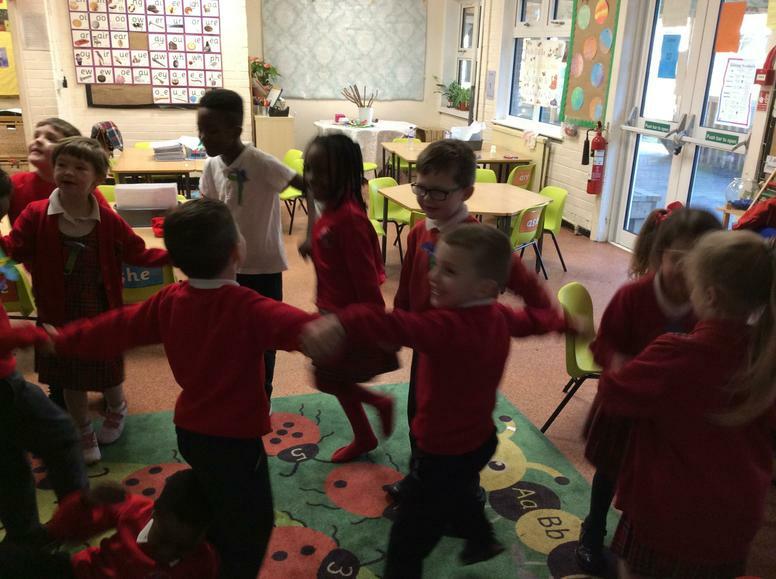 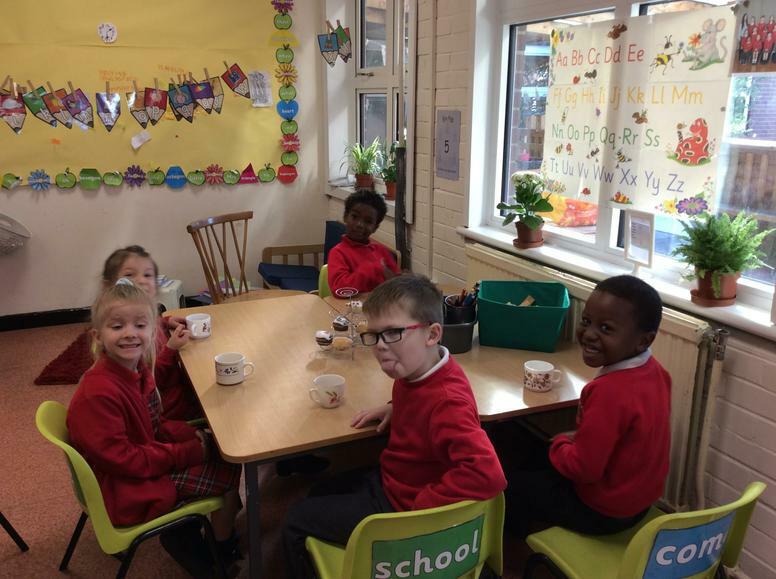 Welcome to Year 1's class page! 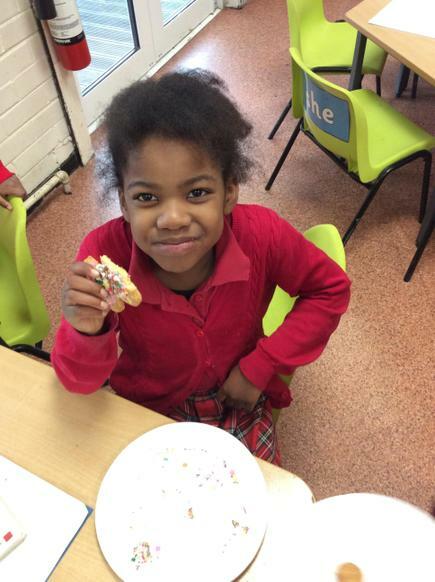 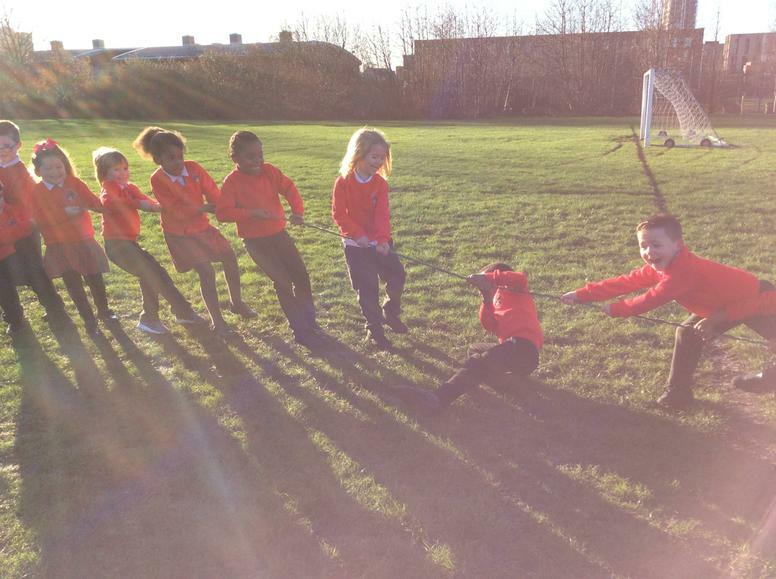 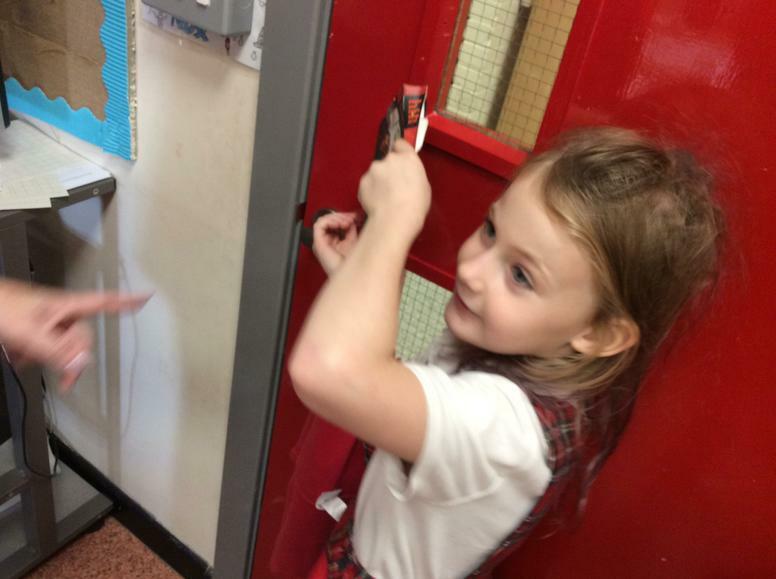 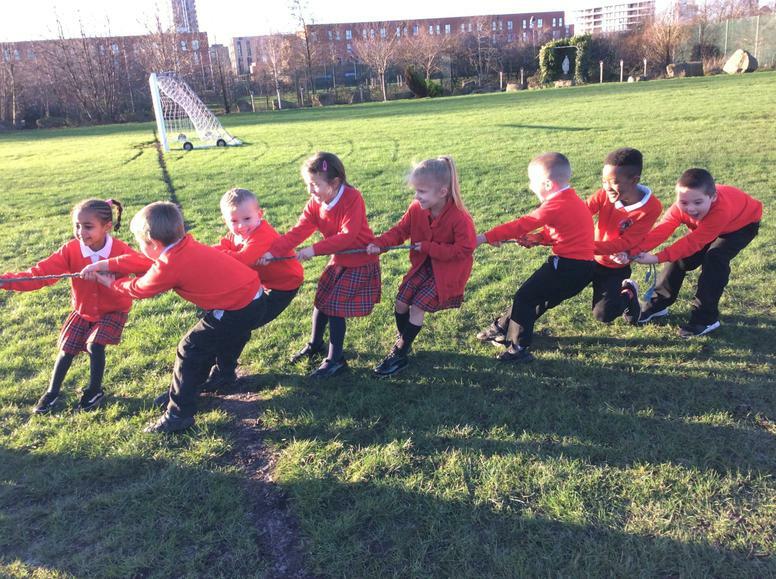 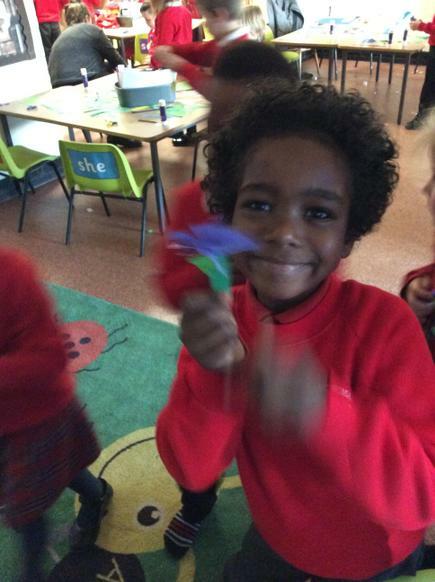 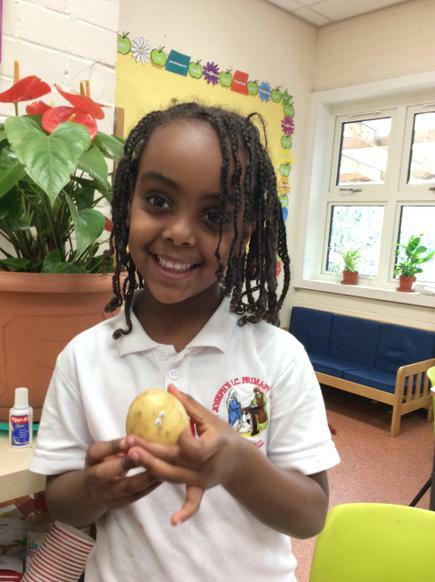 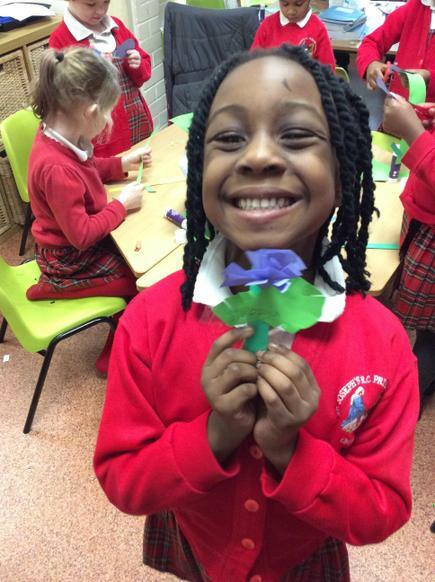 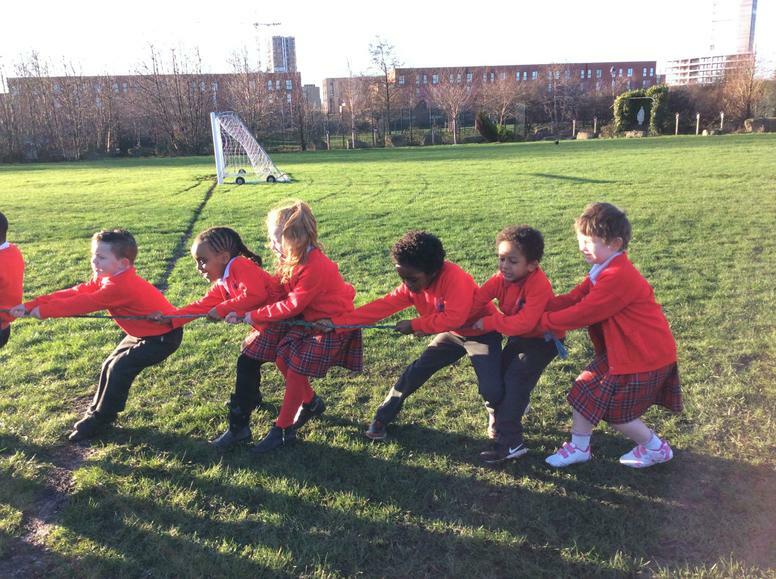 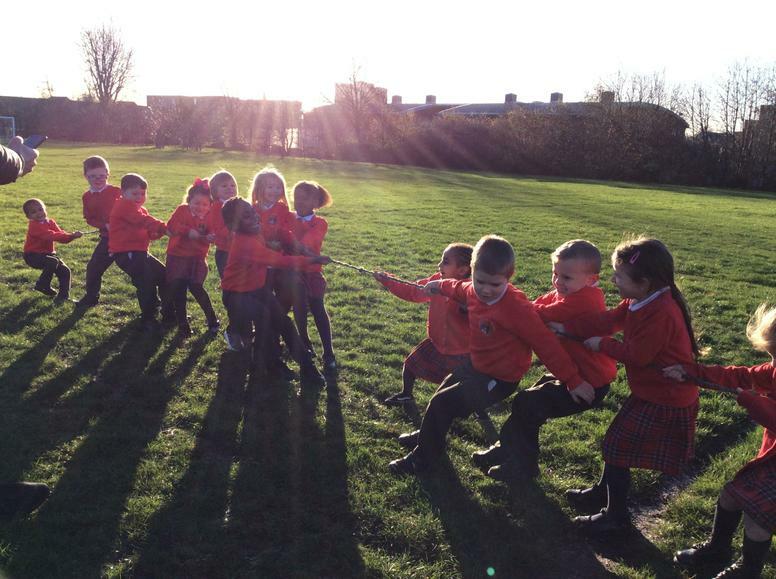 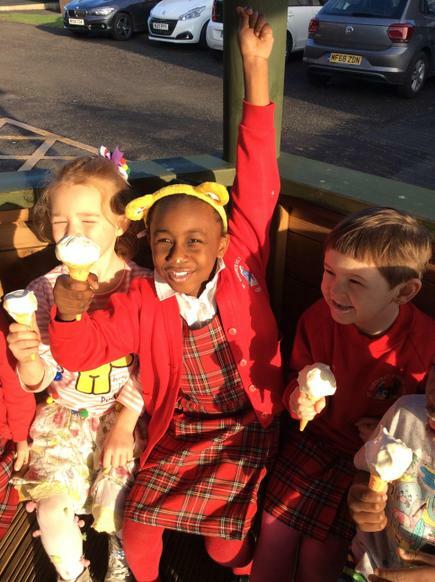 Here at St. Joseph's we aim to 'have life and have it to the full', we will be making lots of fun memories this year. 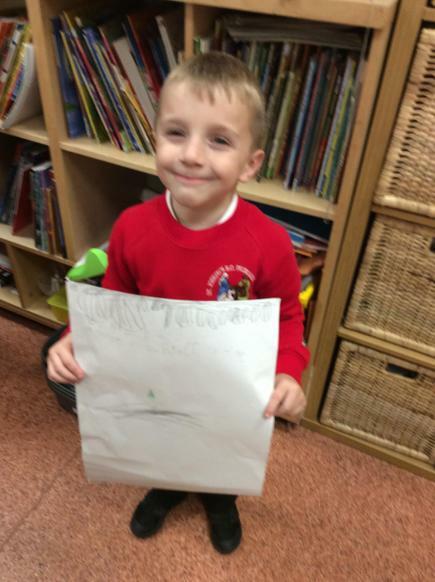 This page will be filled with class events and information, exciting activities we are doing in class and around school as well our star of the week children. 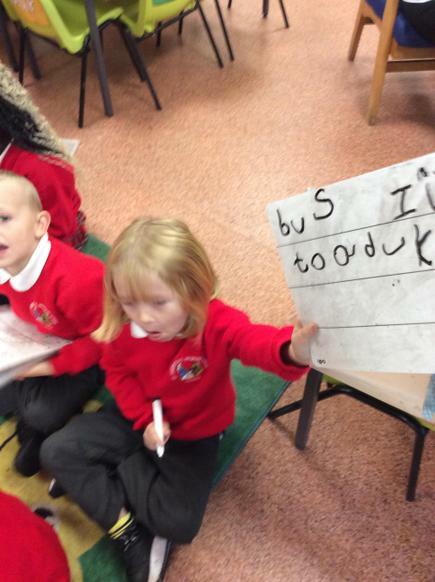 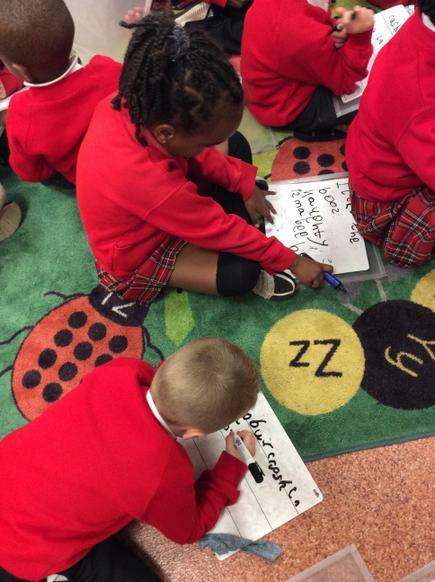 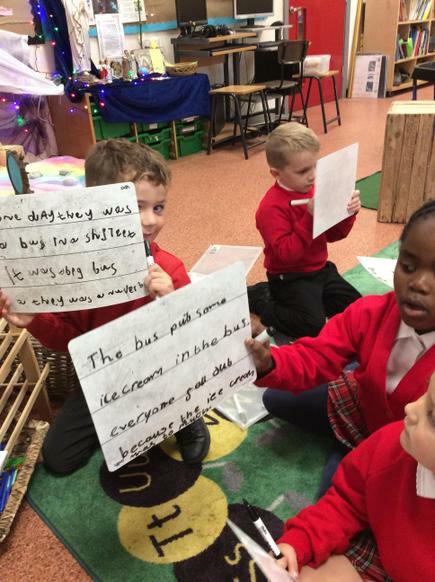 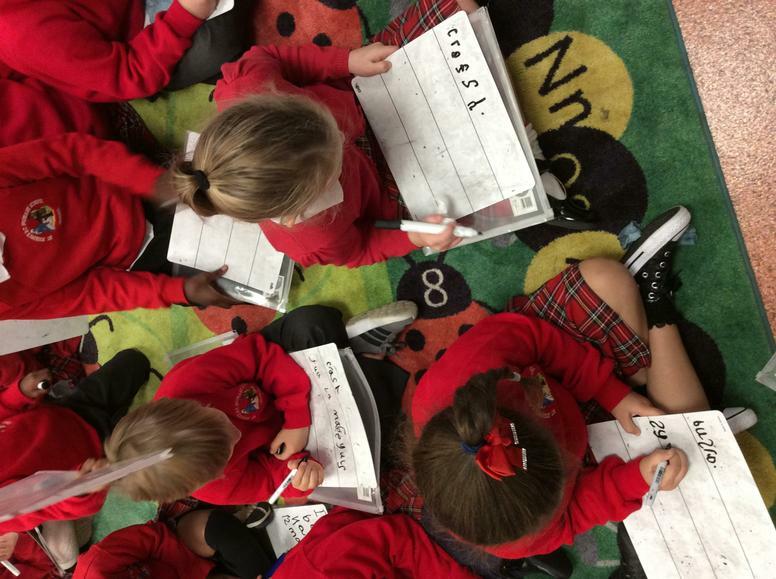 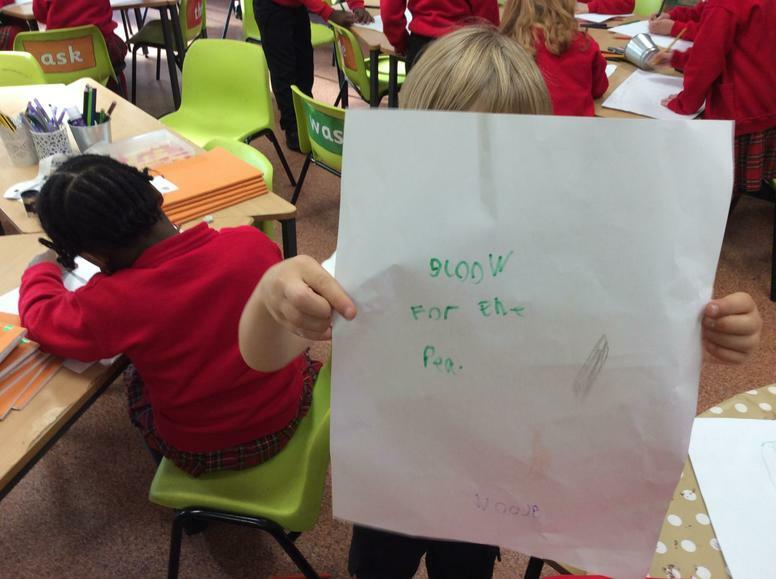 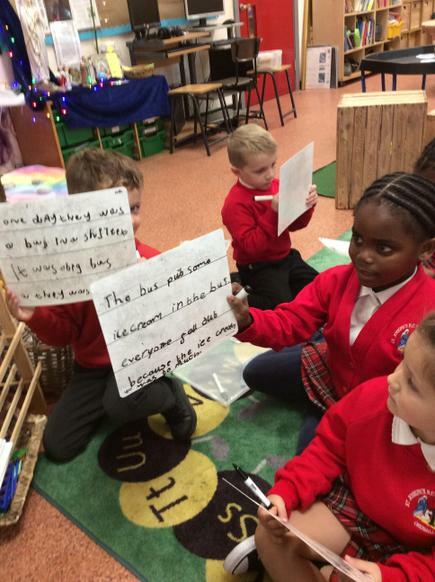 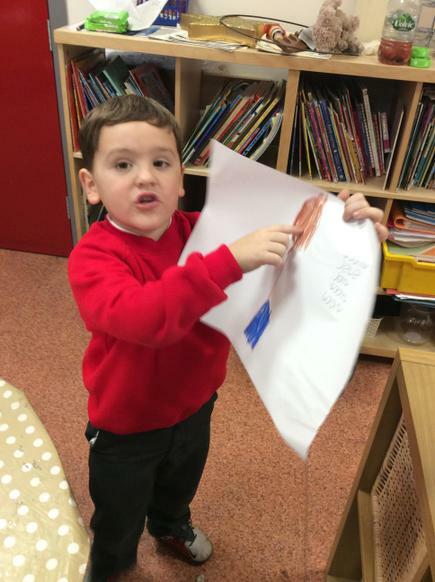 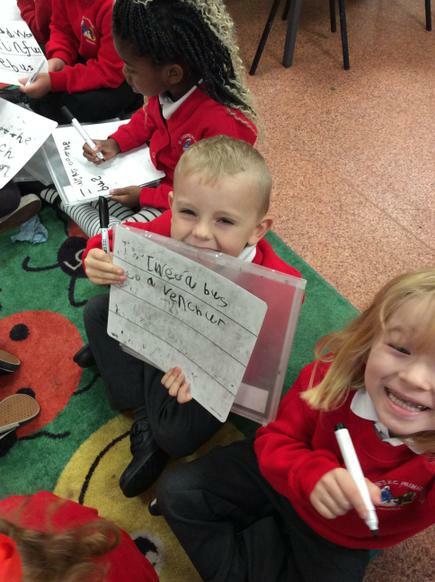 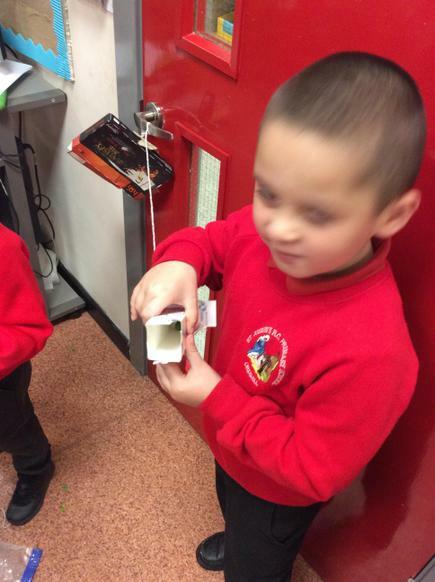 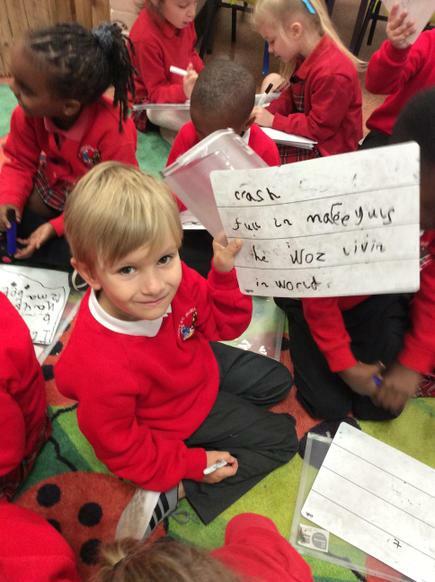 The children have been learning phonics in both Nursery and Reception to help them read words. 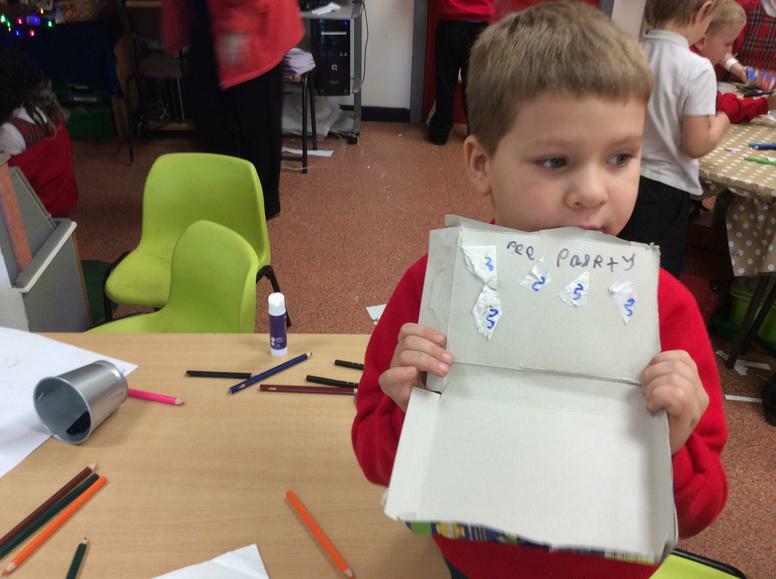 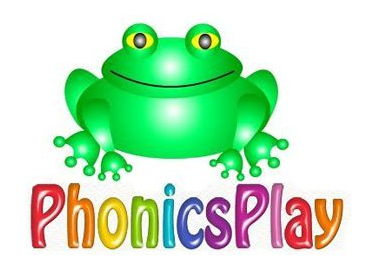 Phonics teaches children to be able to listen carefully and identify the sounds that make up each word. 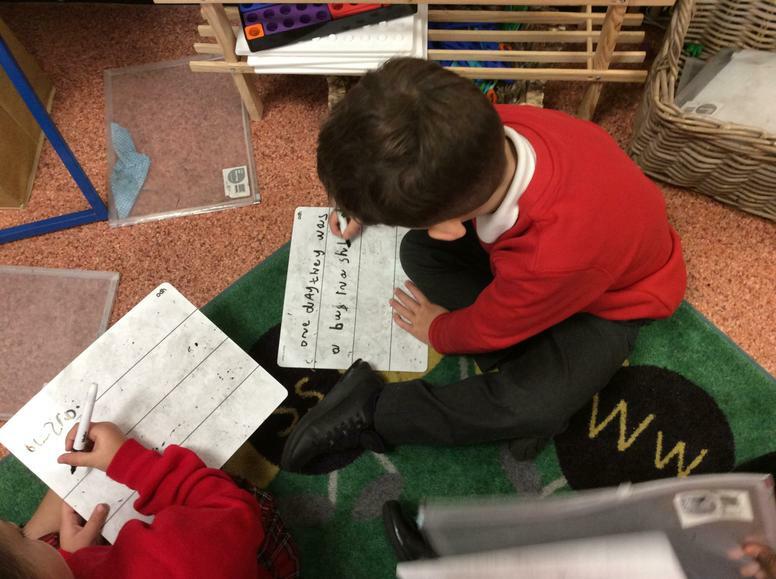 In year 1, all children in the country will take part in a phonics screening check in June. 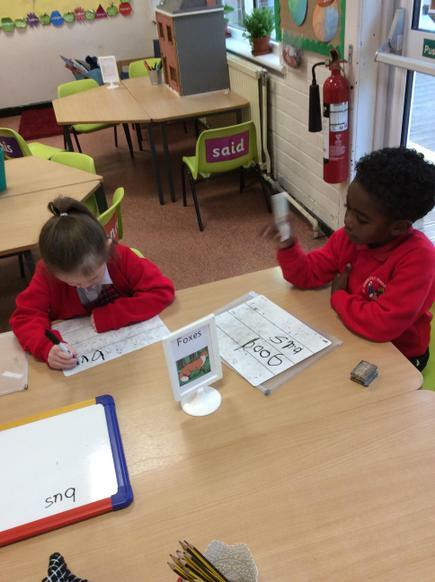 Over the course of the year, they will be learning a lot of new sounds, but these sounds need to be learnt both in the context of real words and nonsense words.The children will be asked to use their phonic knowledge to read 20 real words and 20 nonsense words (alien words). 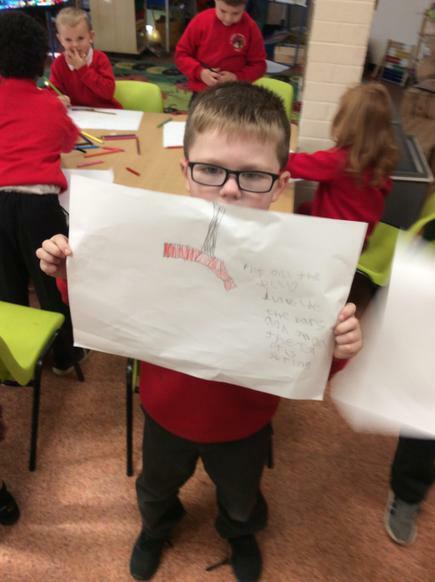 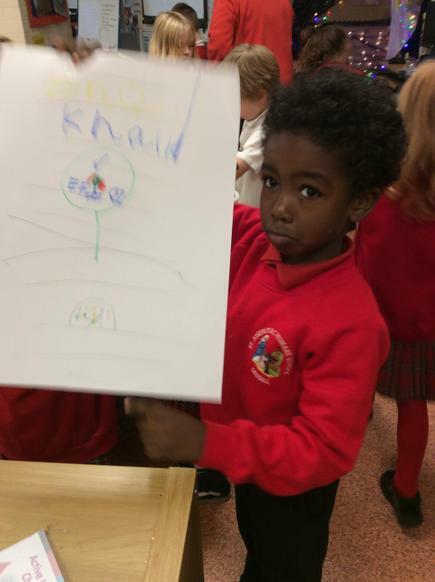 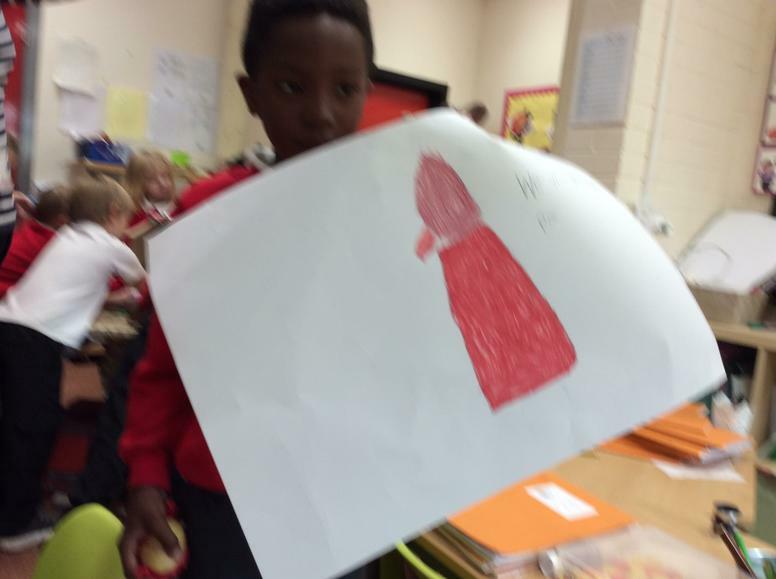 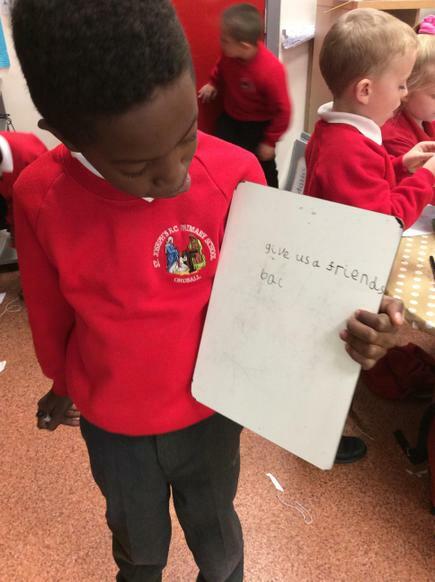 The children will know when a word is a nonsense word as there will be a picture of an alien next to the word - we say this word is the aliens name and this is why it does not make sense to us. 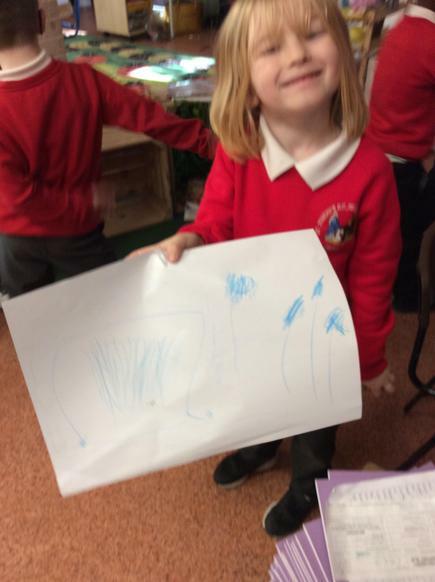 Today we have been writing letters on the laptops to Beegus parents letting them know where she is. 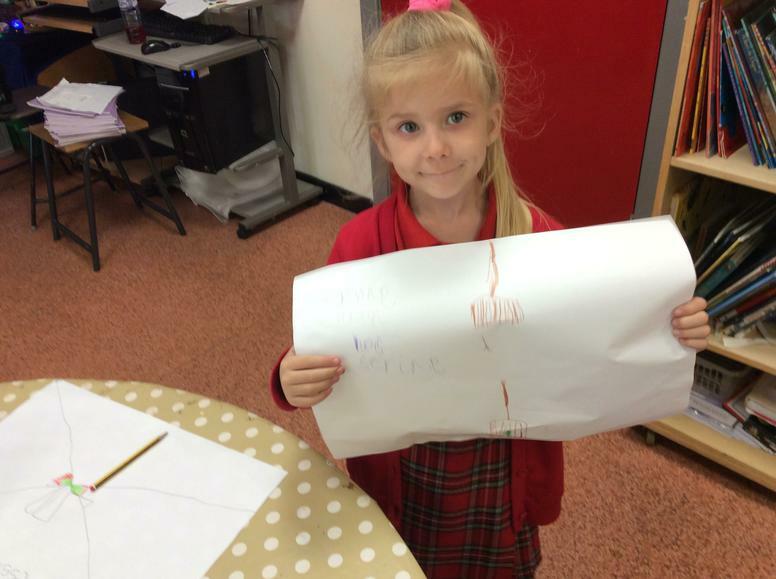 The children worked very well together on the computers and even managed to include capital letters and full stops. 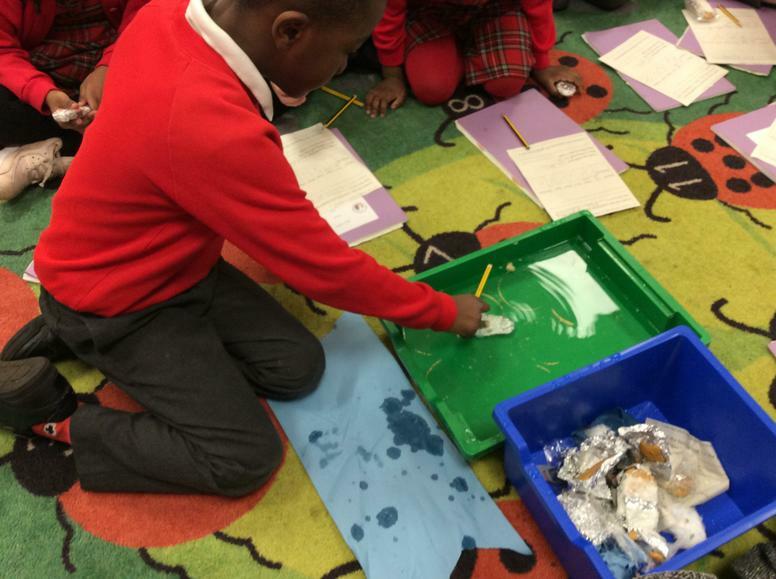 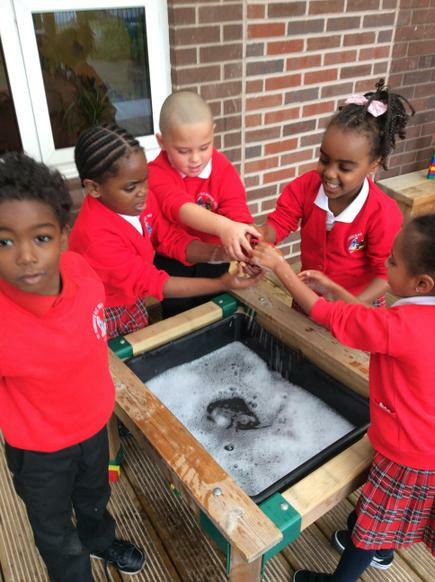 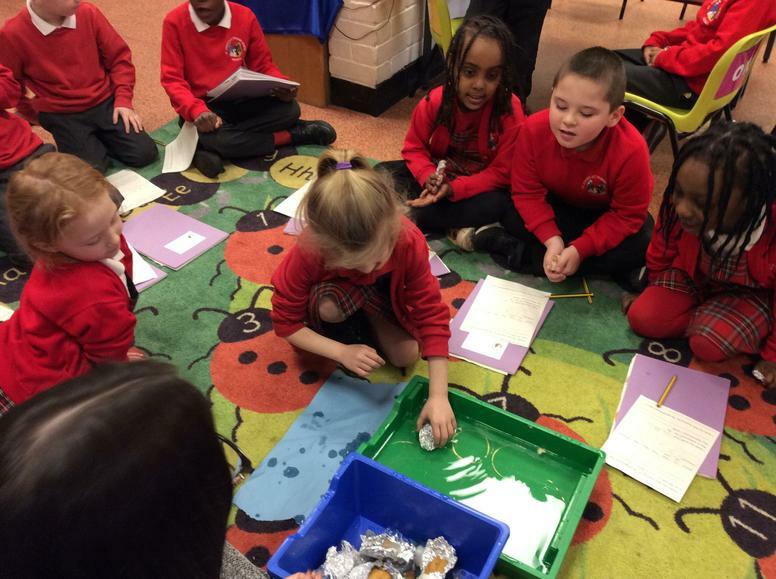 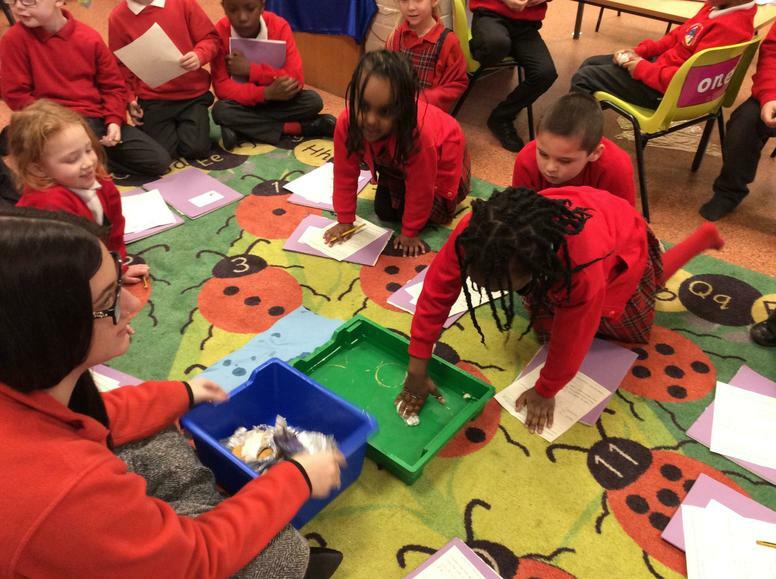 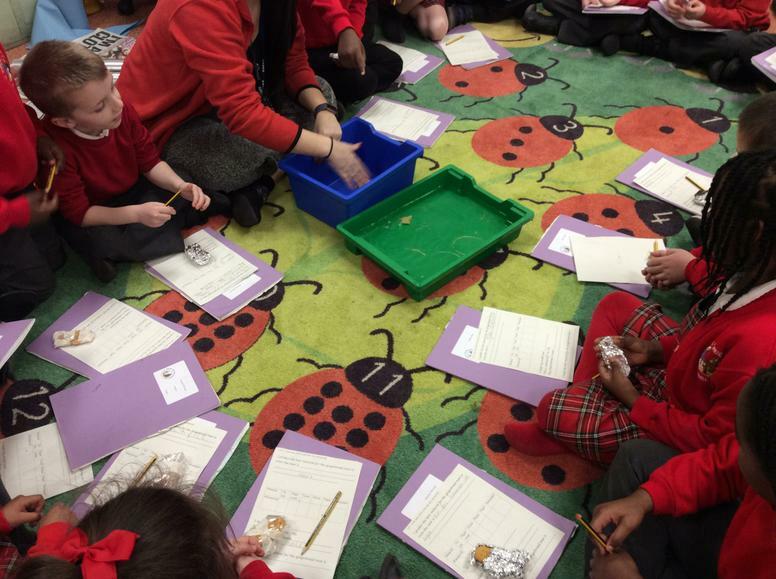 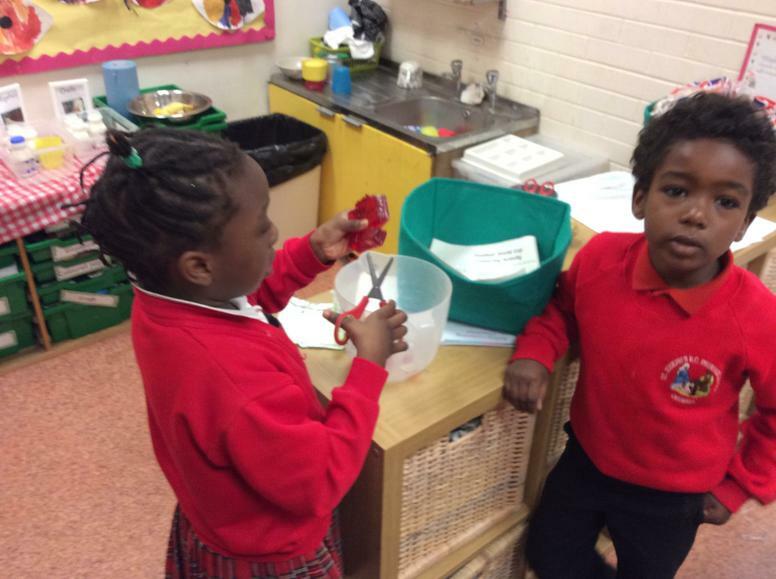 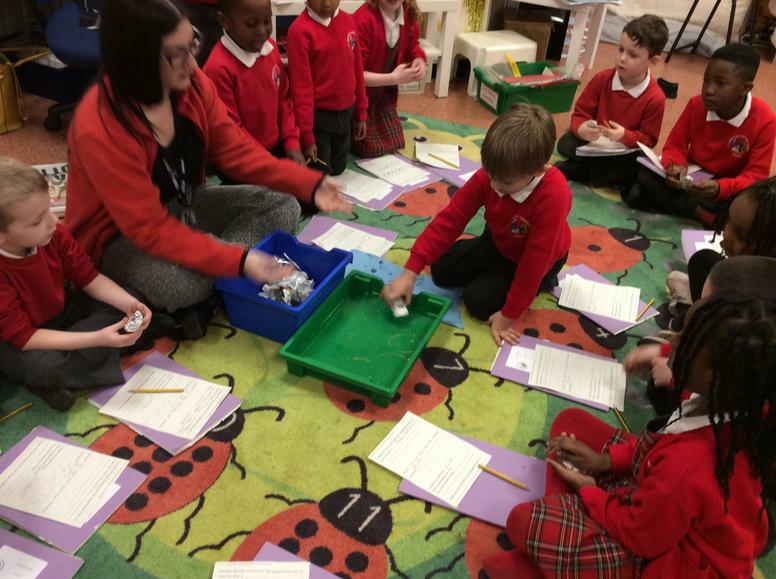 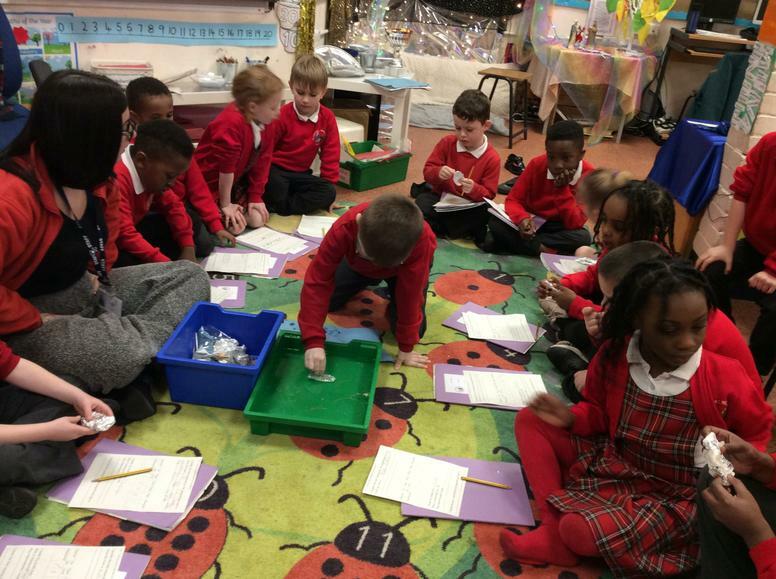 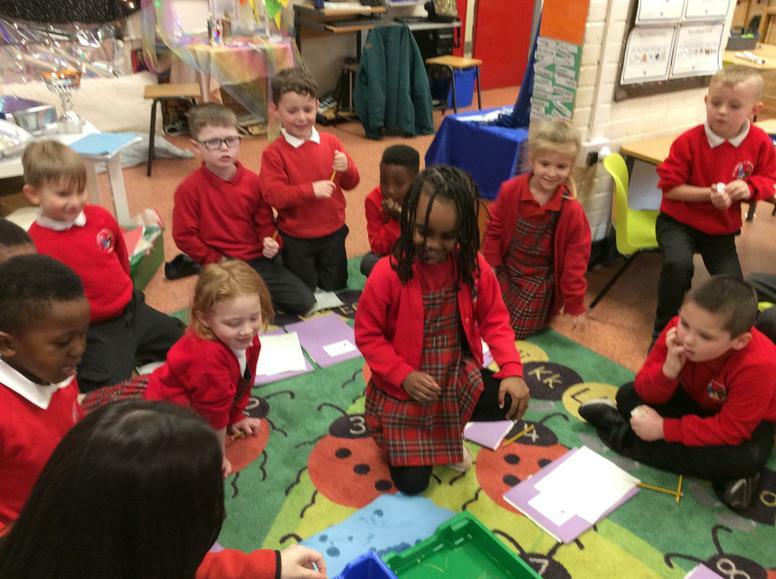 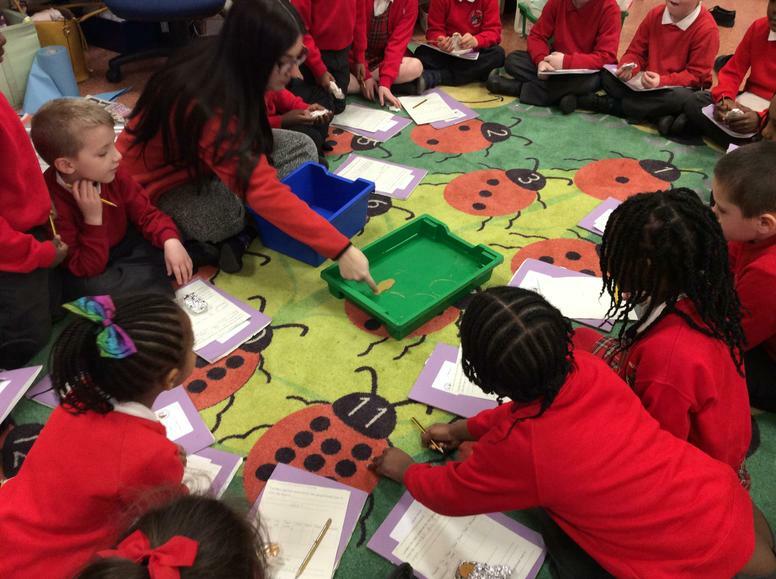 Science was exciting this week, we were looking st the best materials to help the gingerbread man cross the river without getting wet! 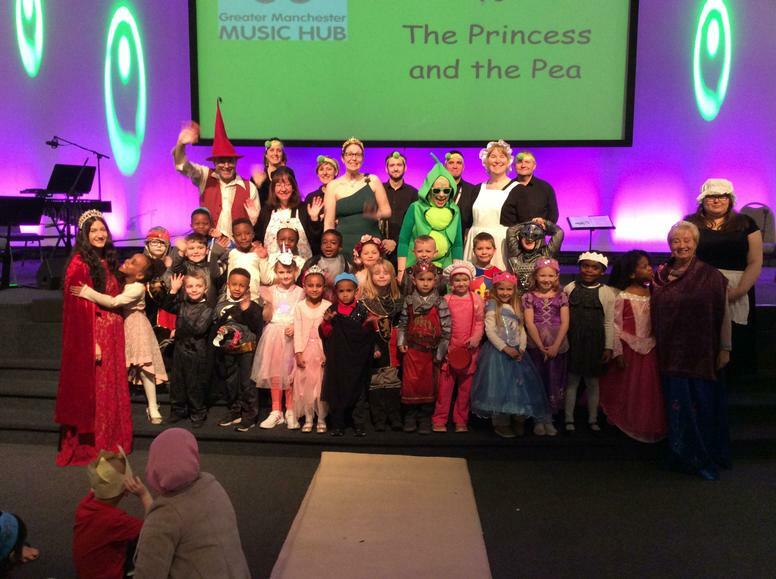 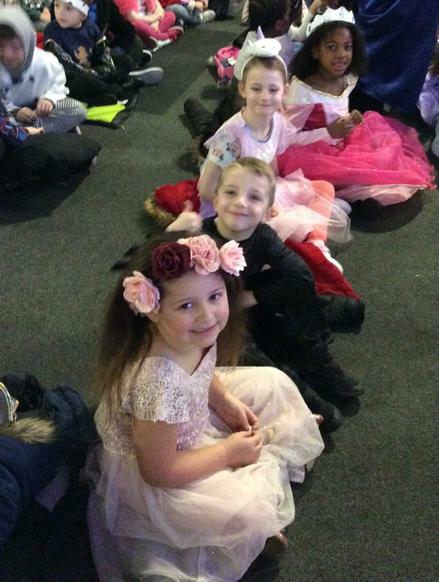 We had a great time when we went and joined in with a performance of The Princess and the Pea. 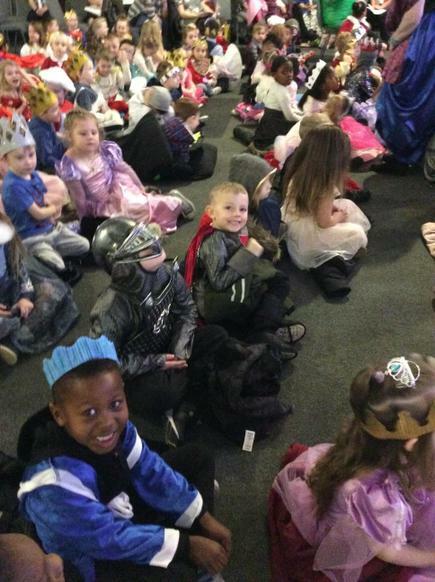 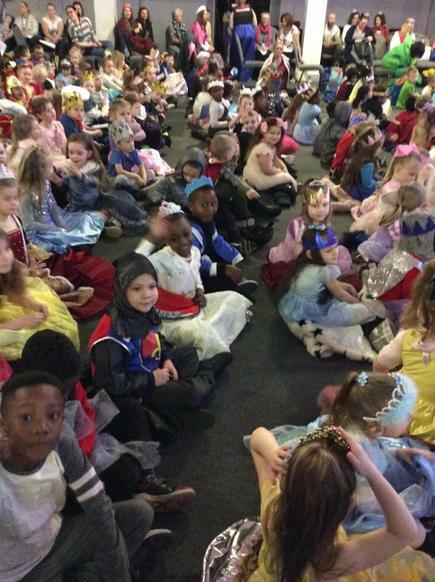 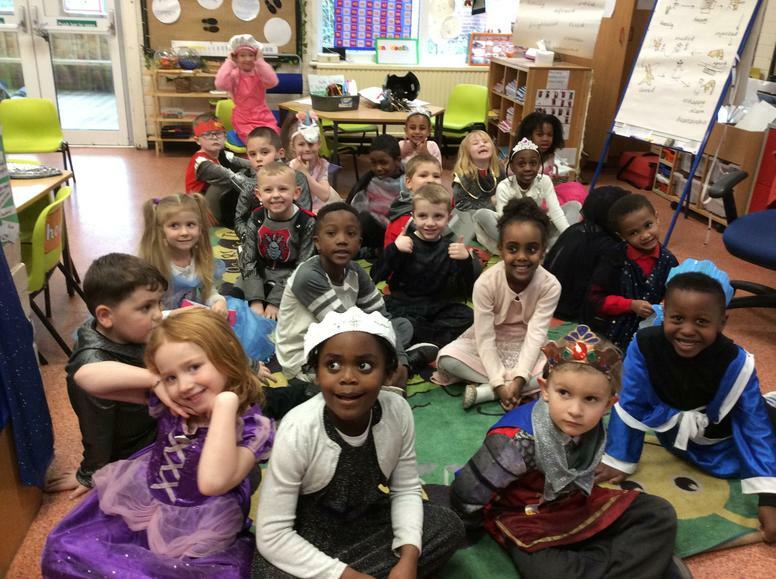 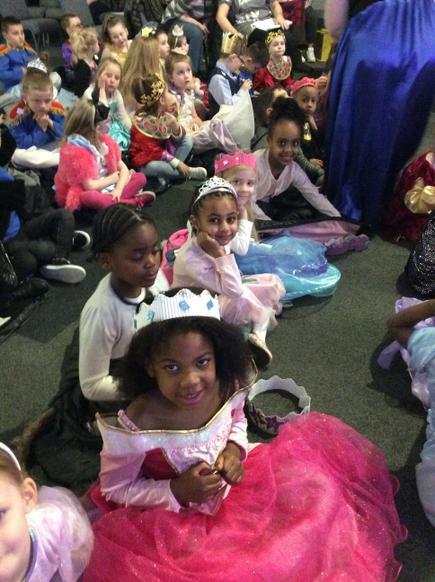 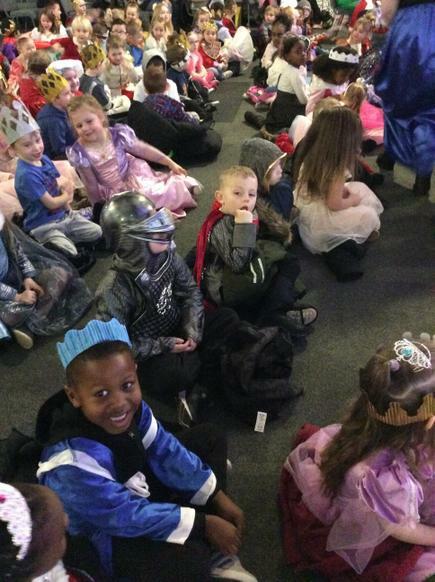 We all dressed up as characters from the story and did some fantastic singing! 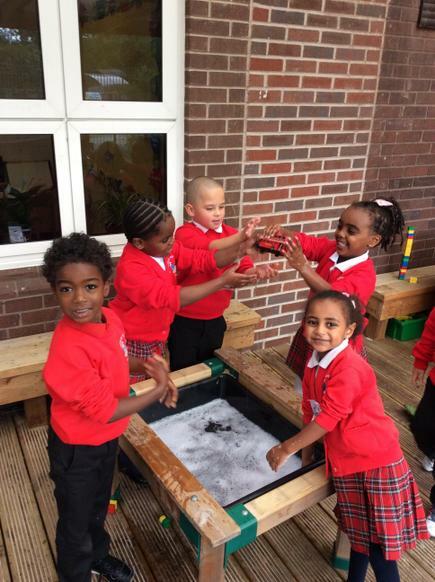 We had such fun in the snow today! 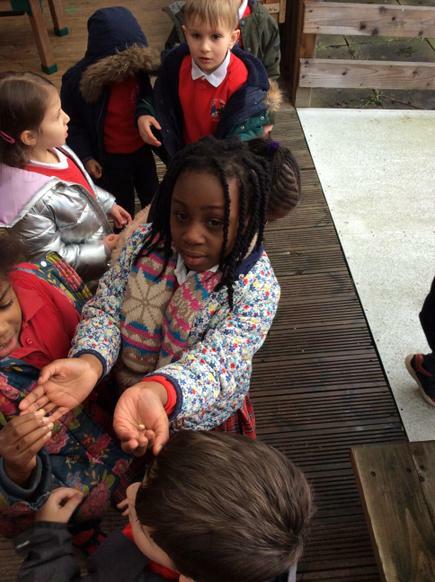 Lots of cold hands and excited squeals! 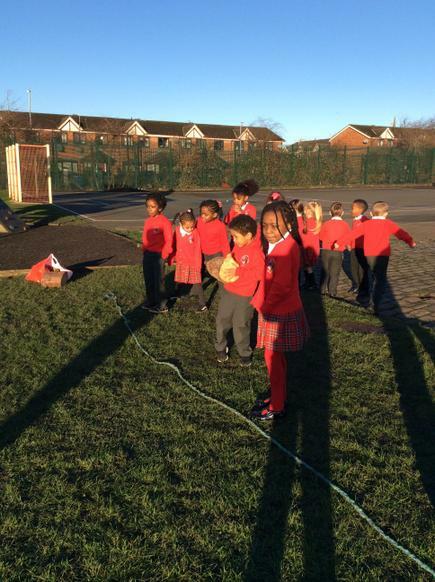 Some snowballs were almost as big as we are! 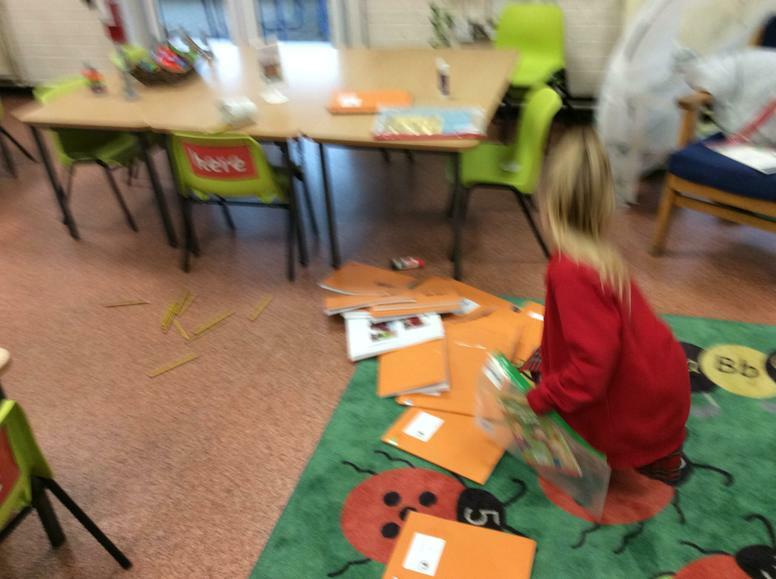 What chaos! 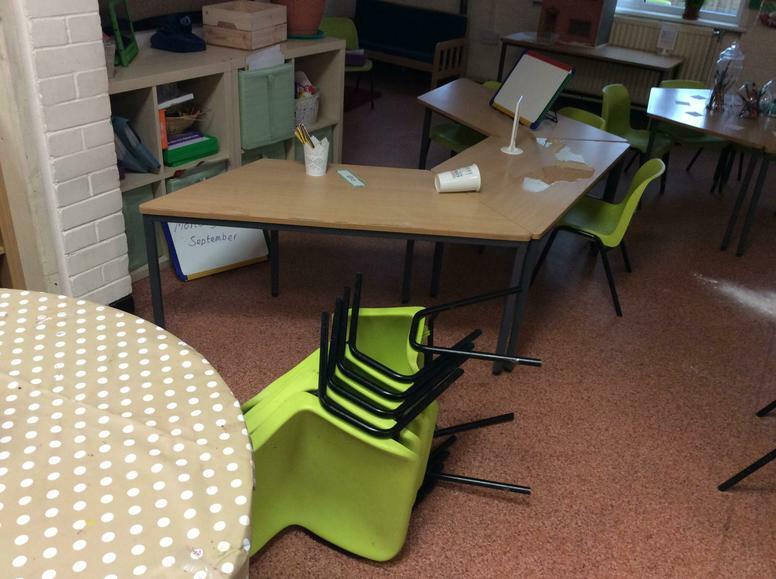 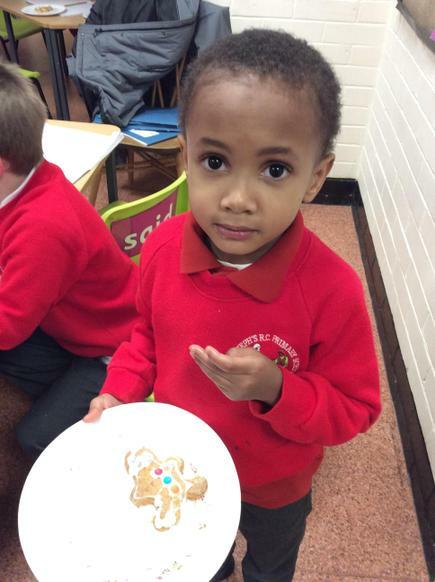 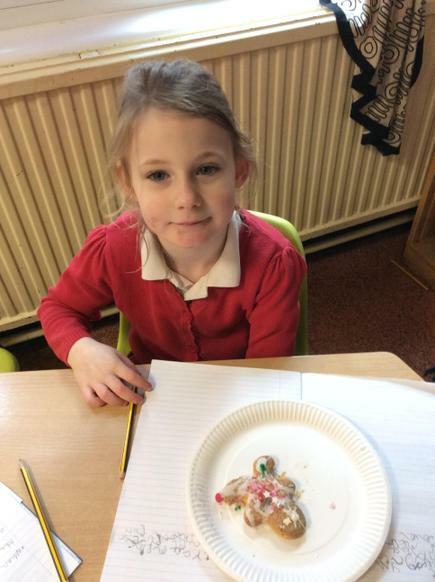 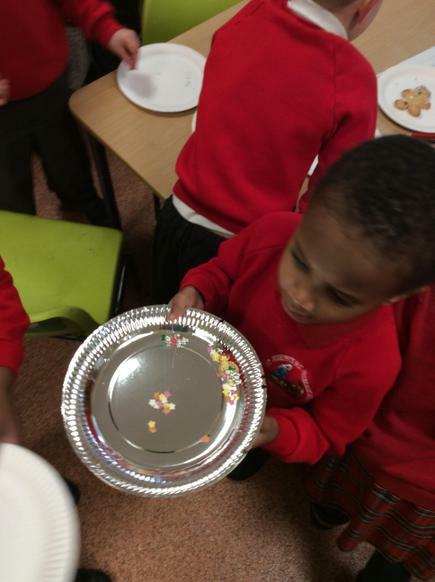 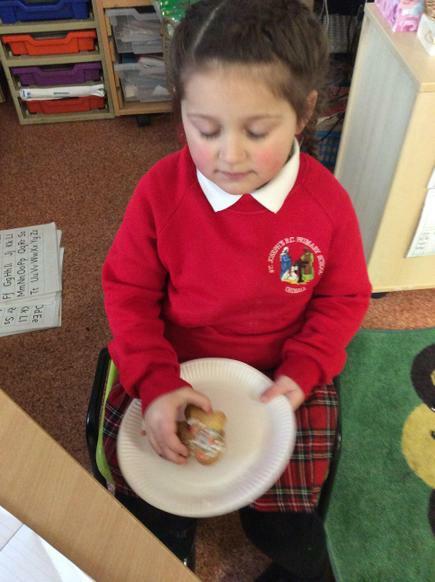 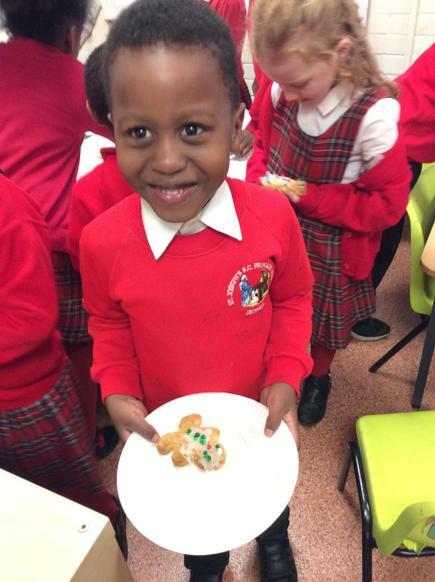 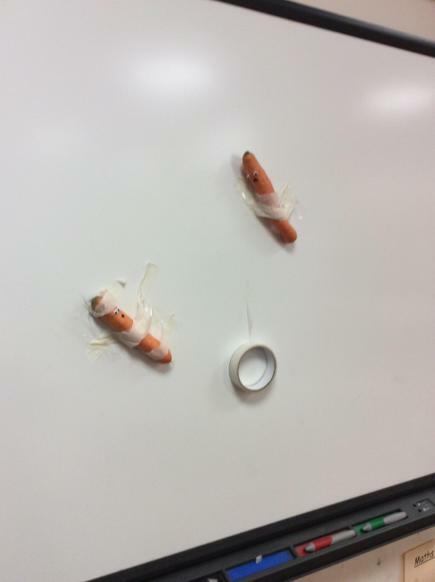 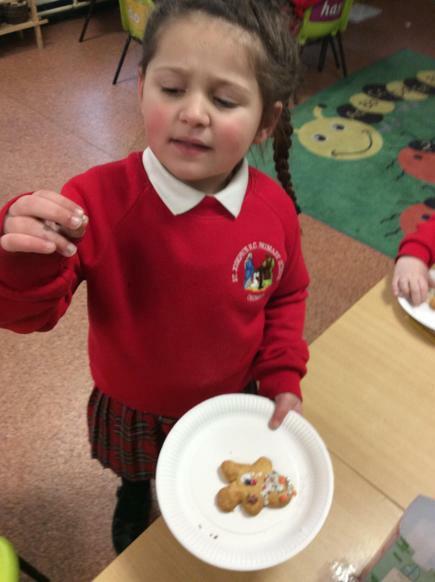 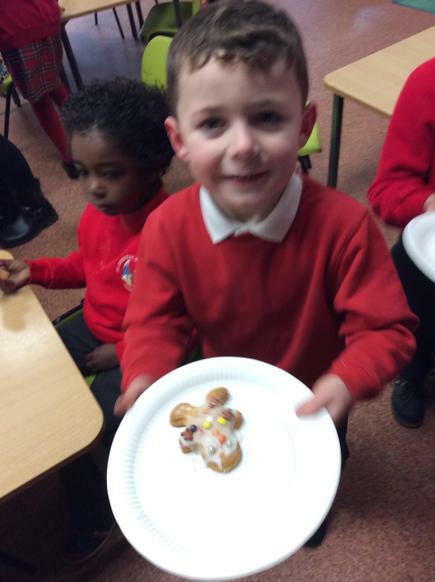 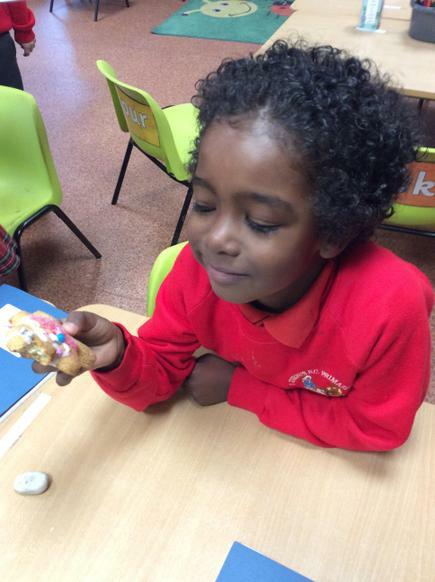 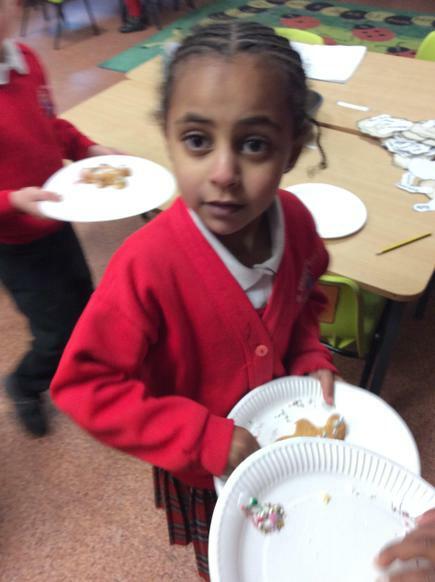 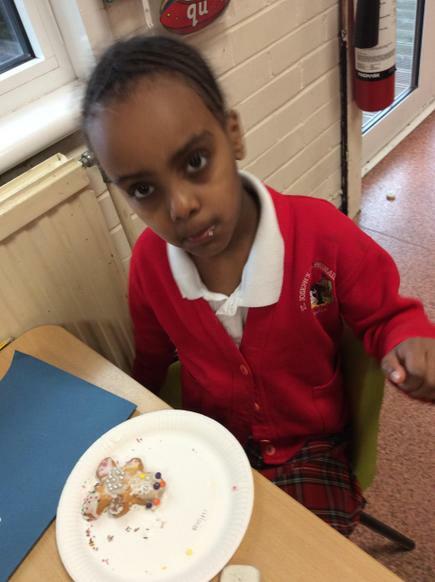 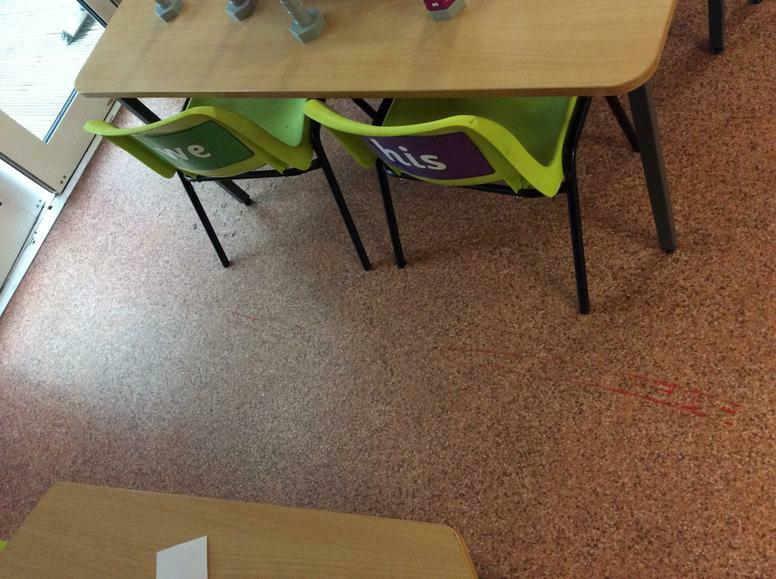 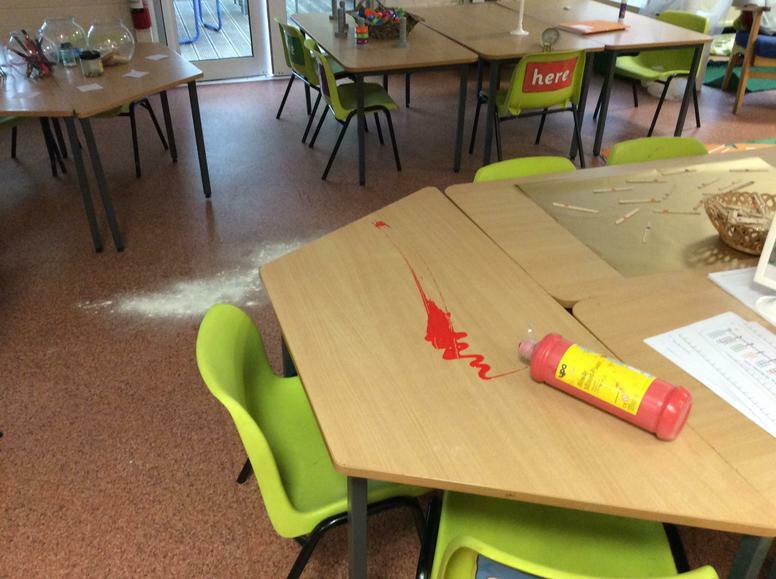 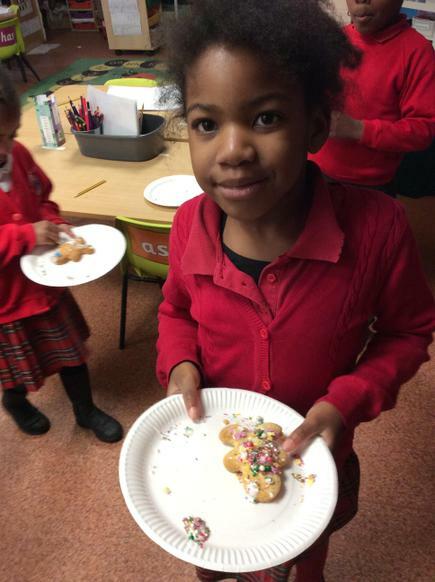 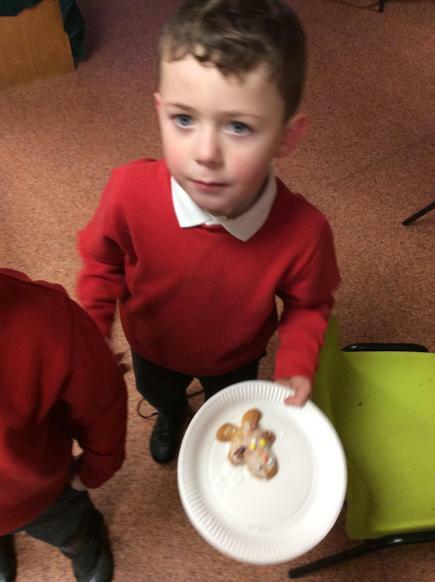 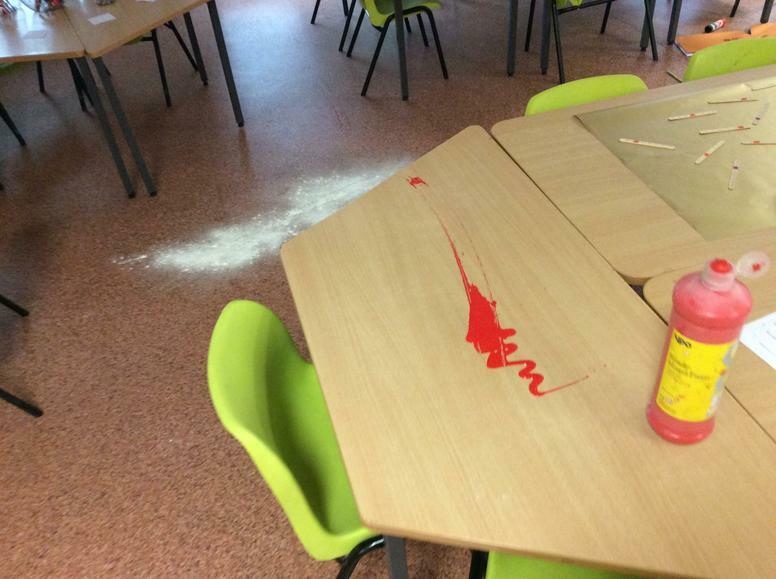 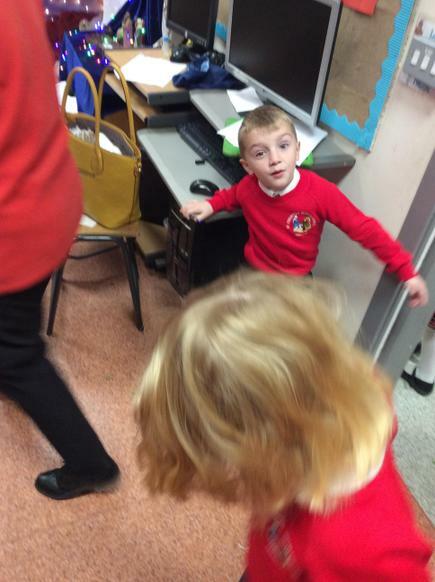 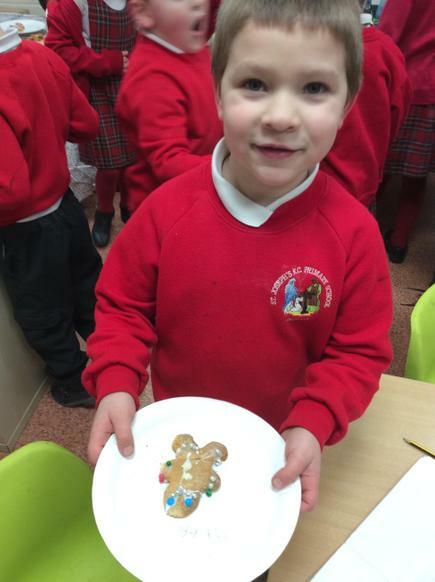 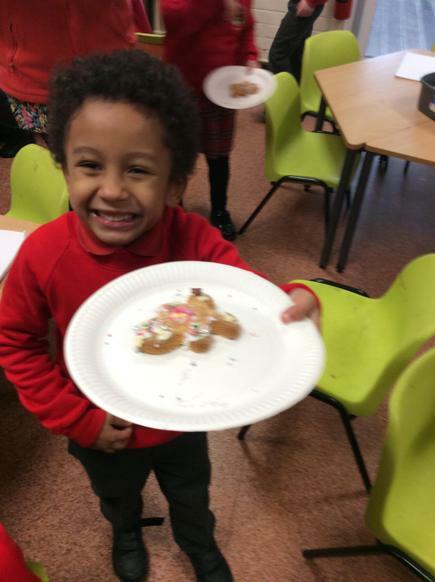 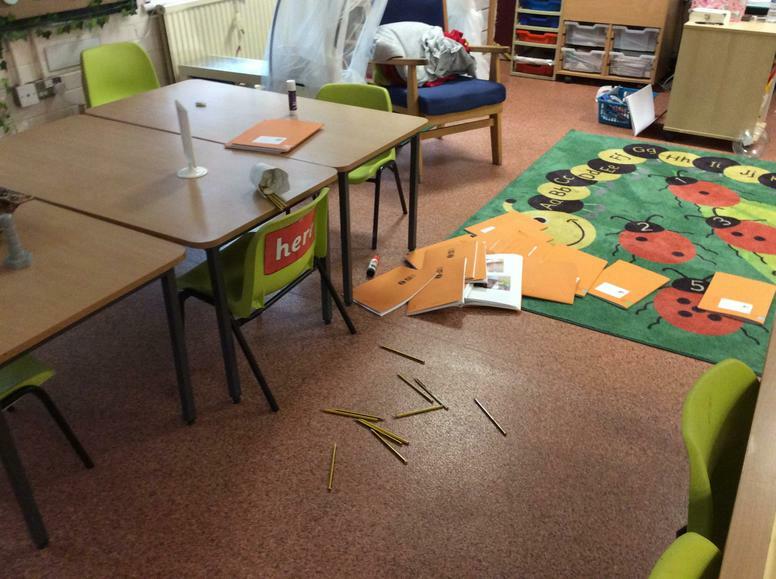 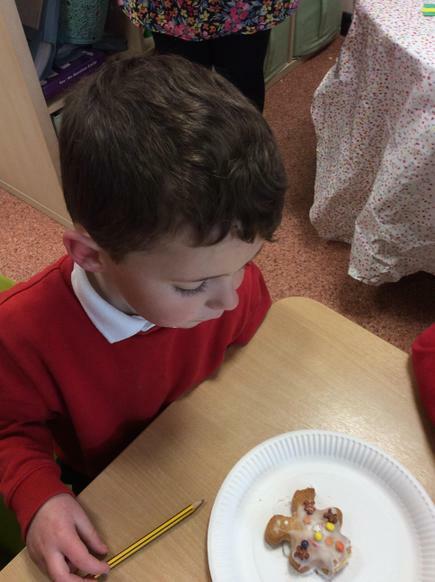 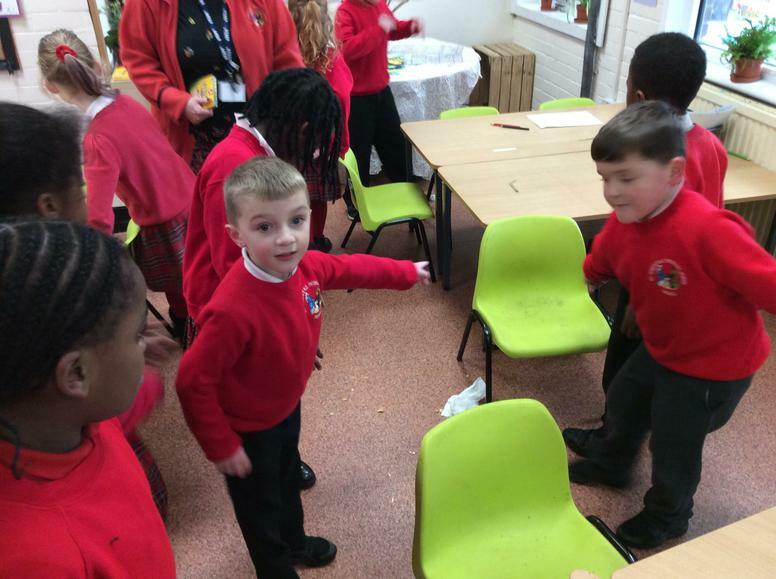 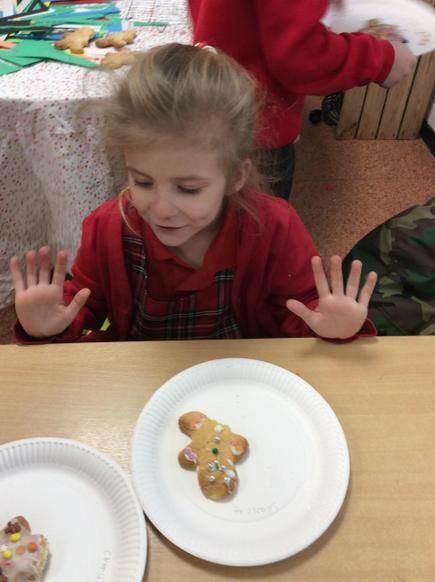 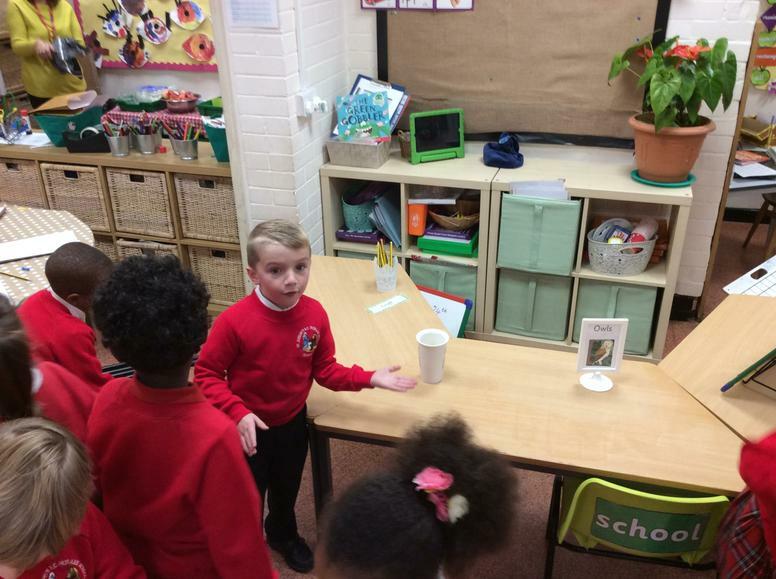 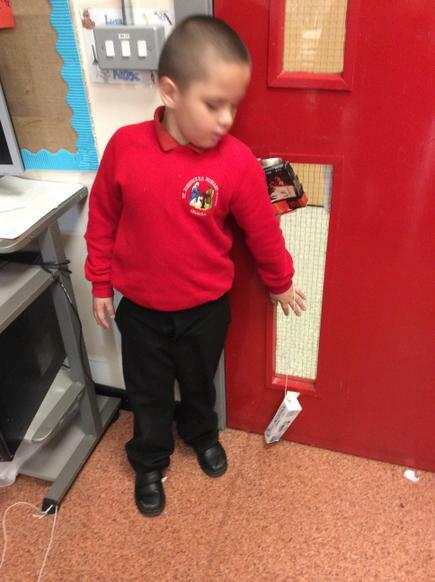 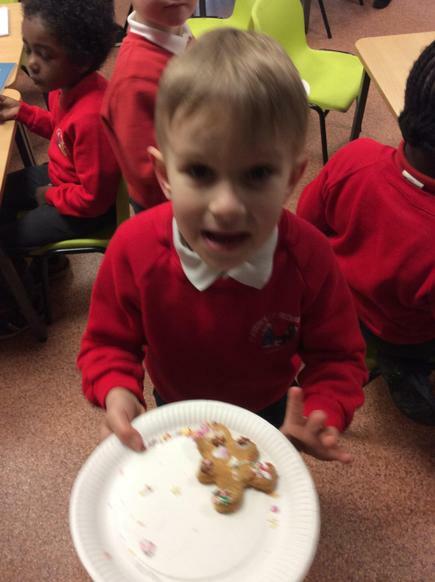 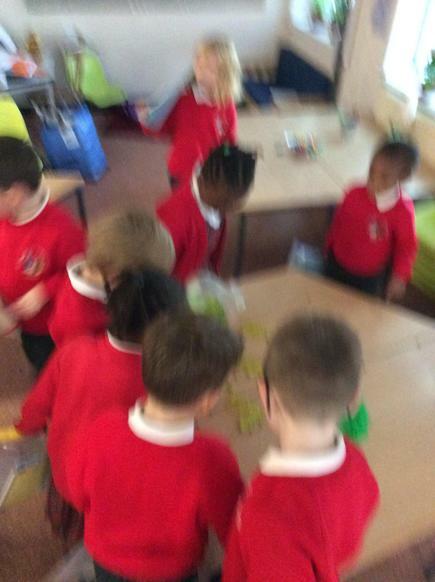 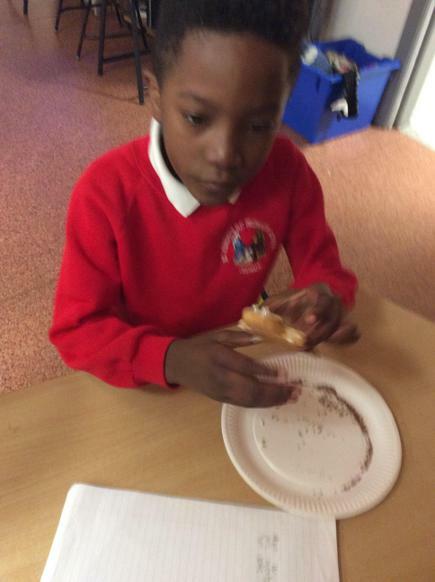 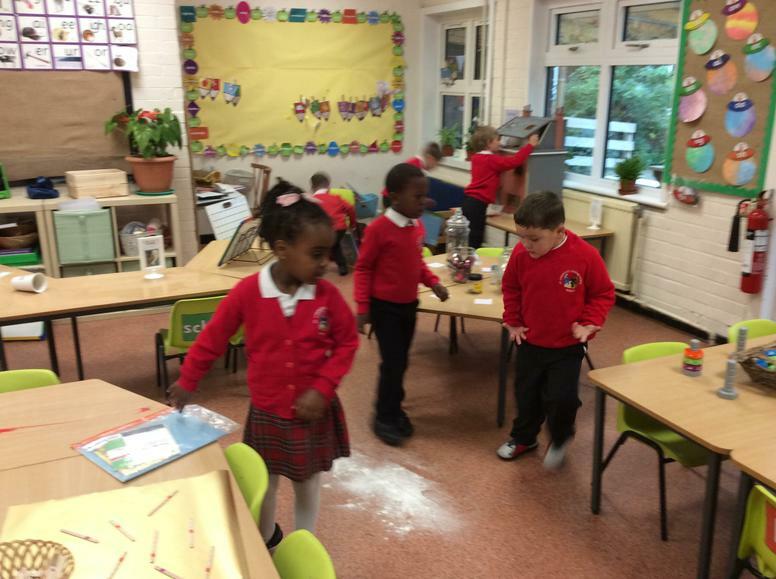 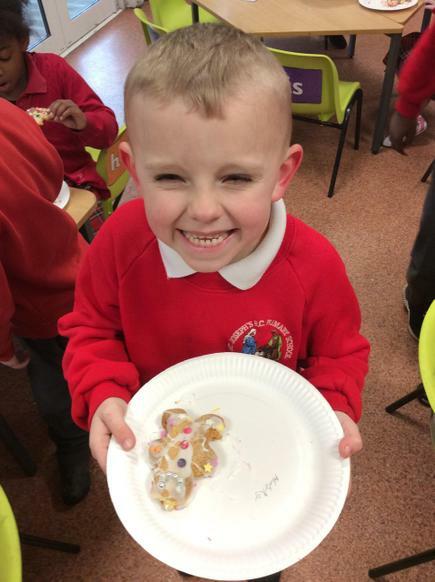 We came into class after lunch to find that the gingerbread men we had made in the morning had ran away! 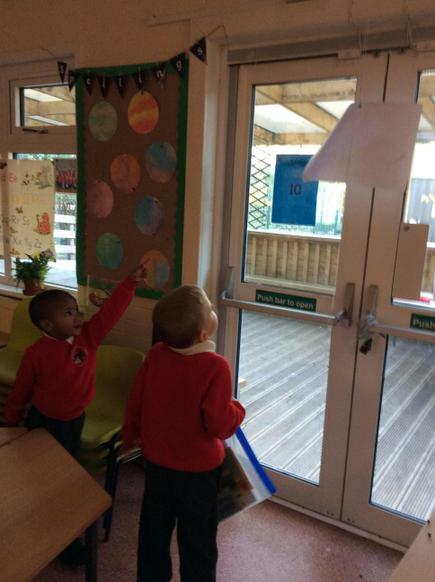 We searched for clues and saw a video of them all running away on the camera. 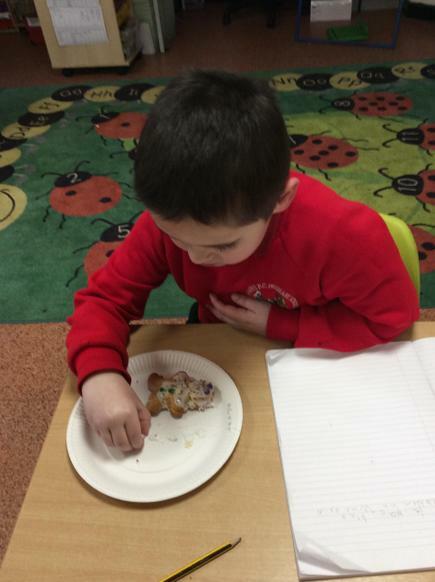 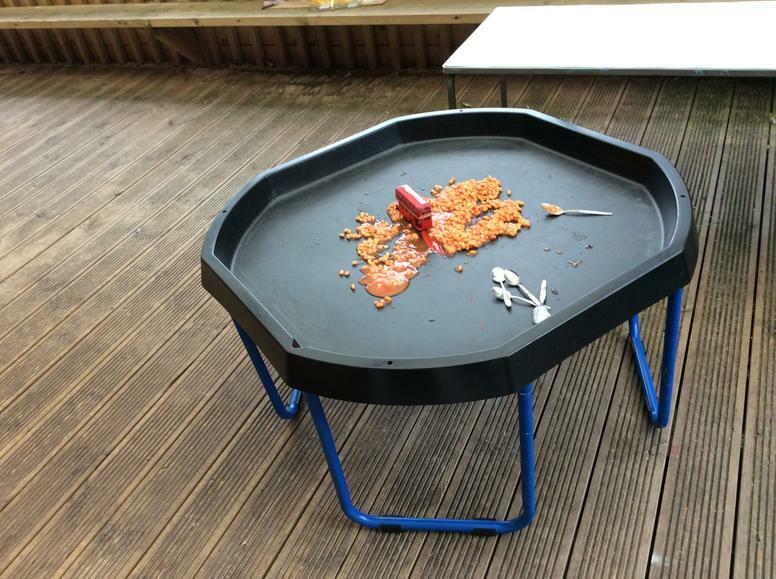 We gave up looking and luckily after playtime they had returned and they were yummy! 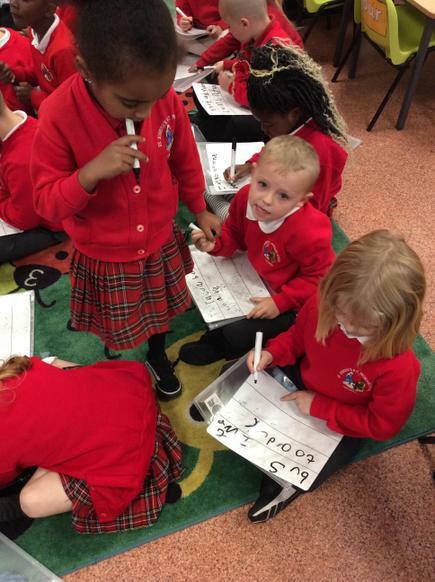 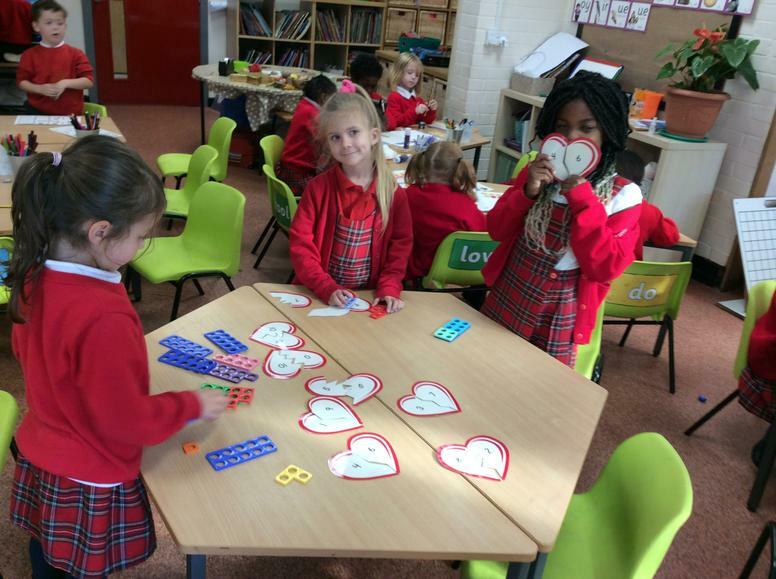 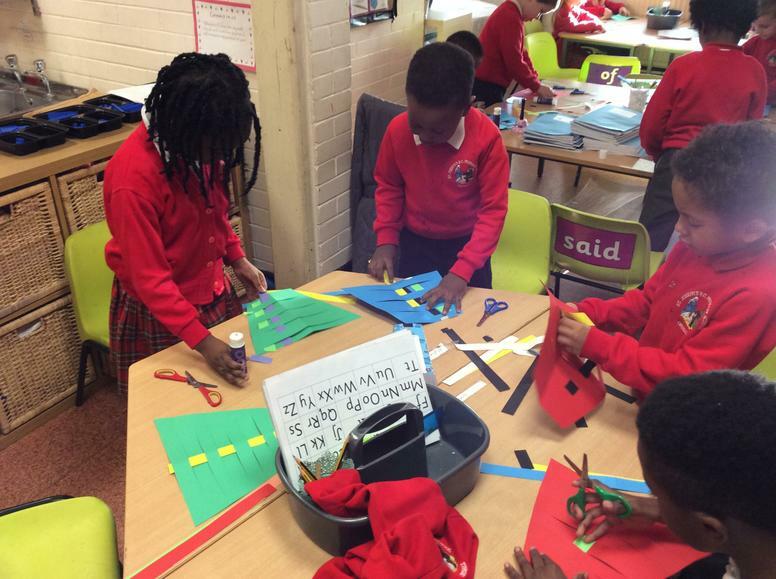 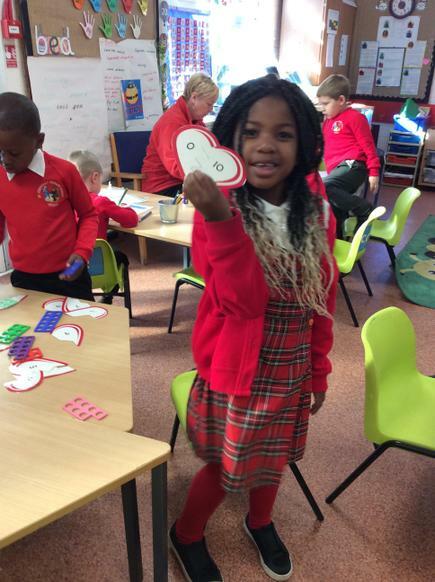 In maths we have been working hard learning number bonds to 20. 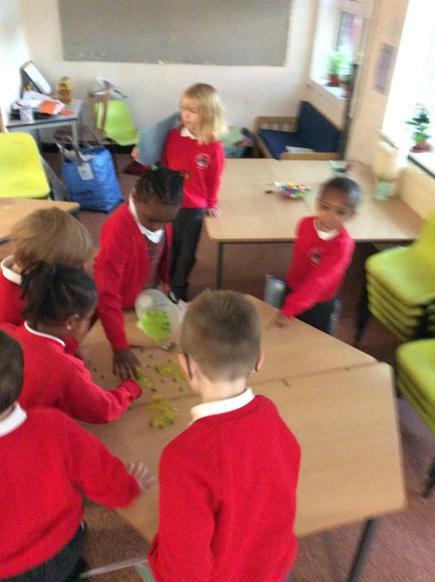 We used counters and part whole models to help us. 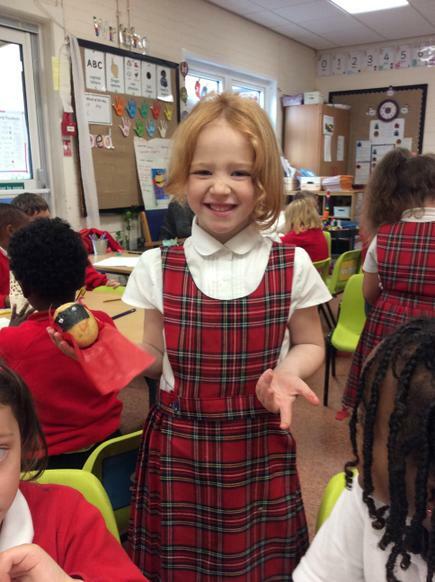 Scottish Day! 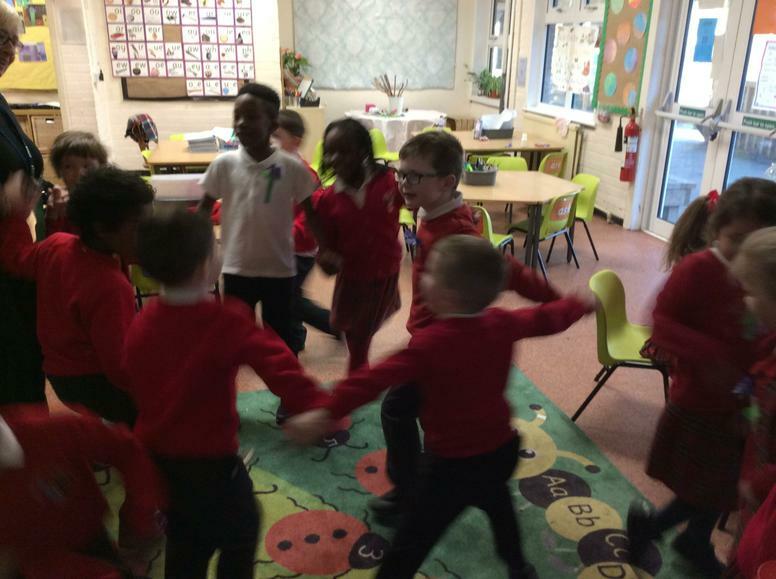 We started off the day taking part in the Highland games, ate shortbread for lunch and we made kilts in the afternoon and had a go and some Scottish dancing! 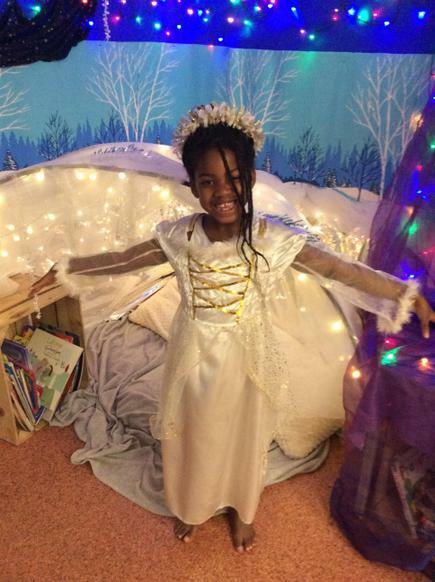 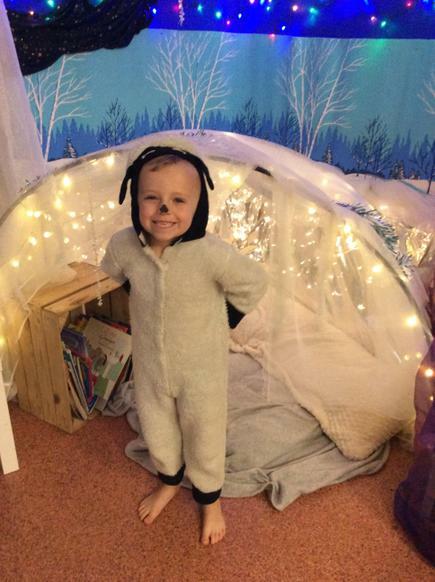 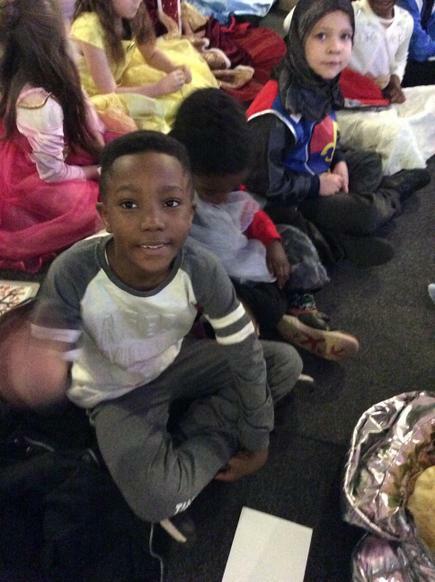 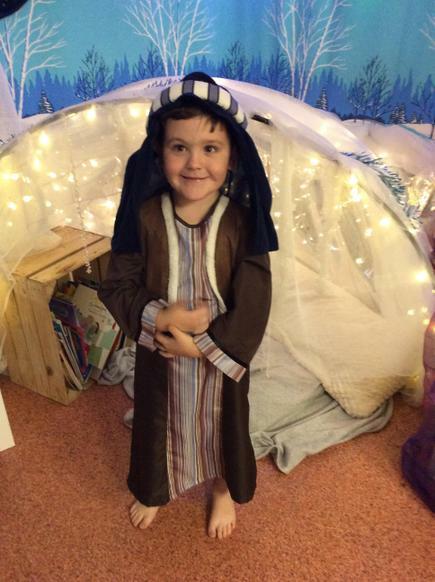 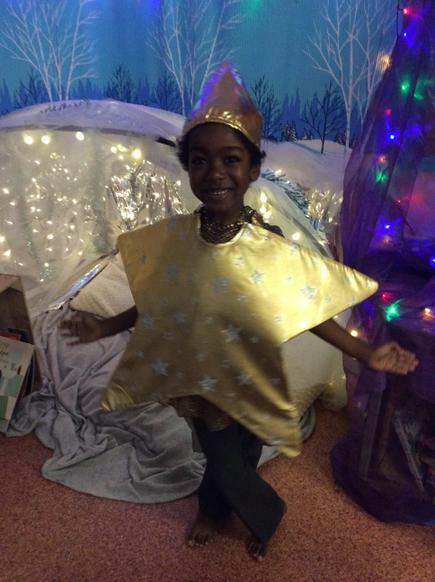 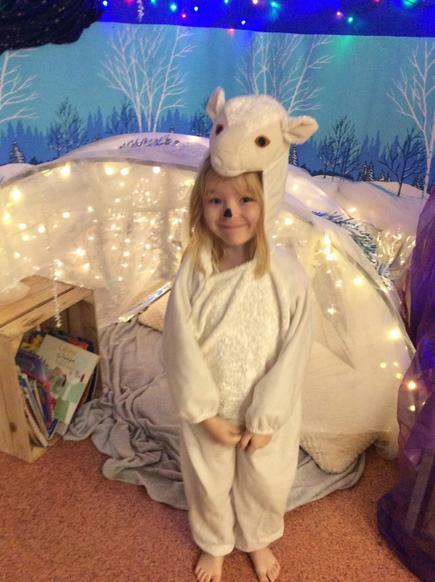 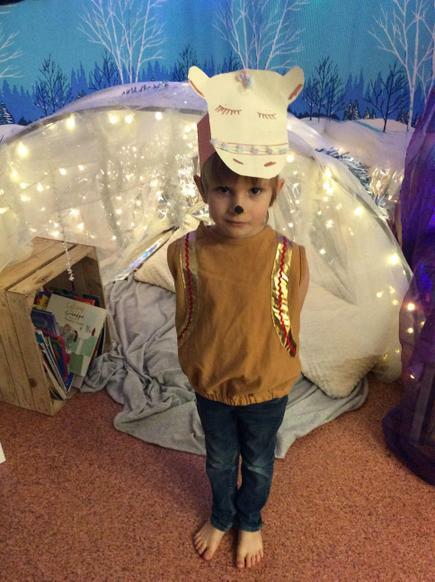 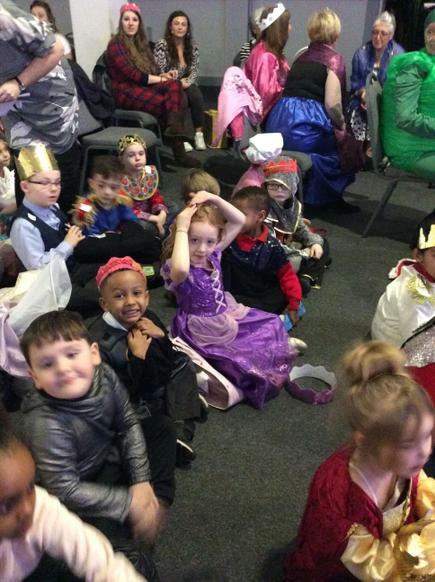 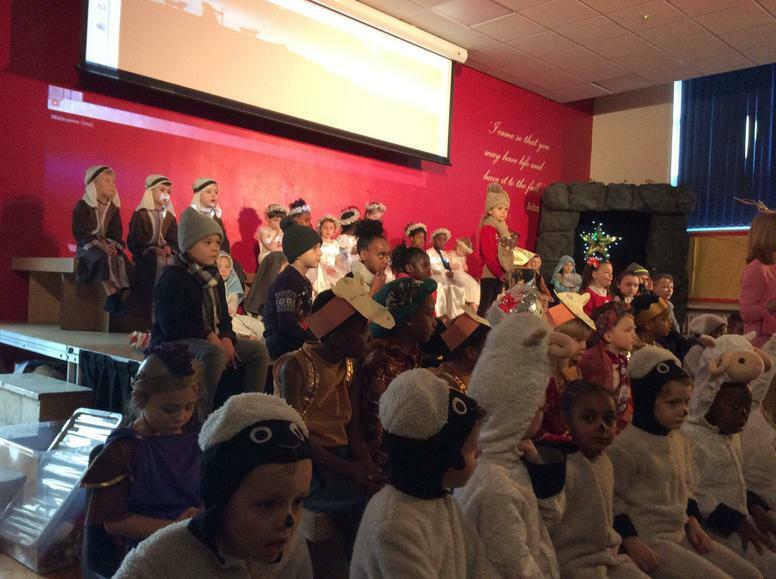 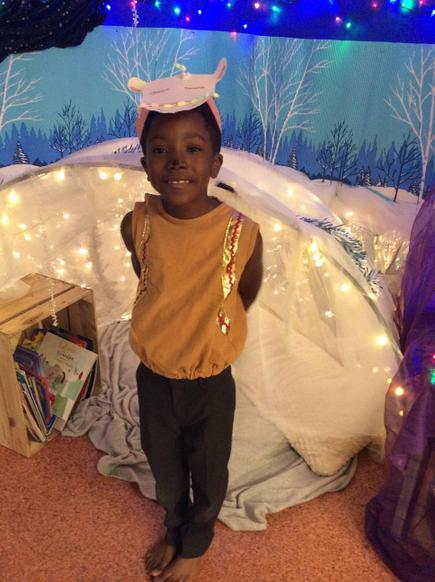 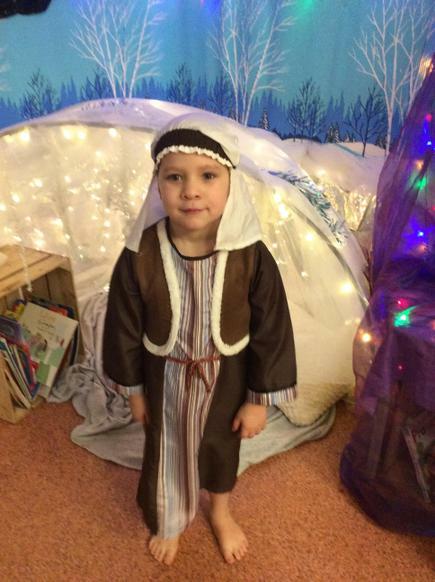 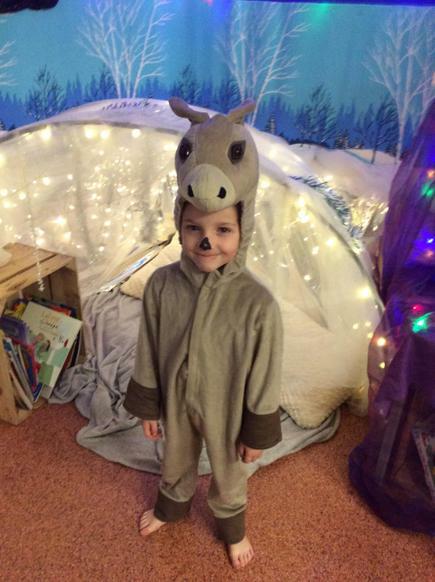 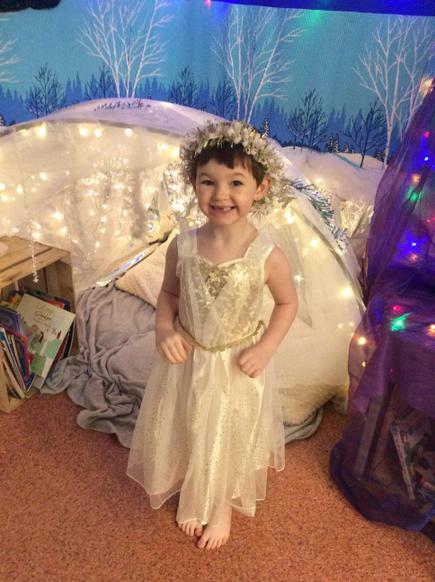 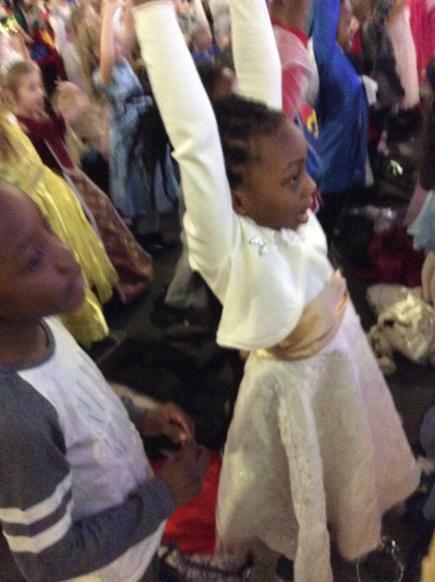 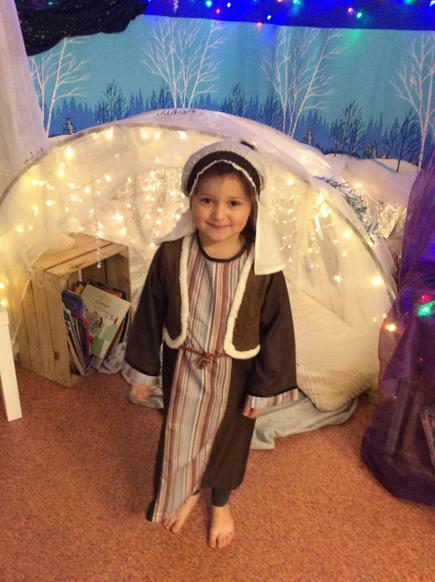 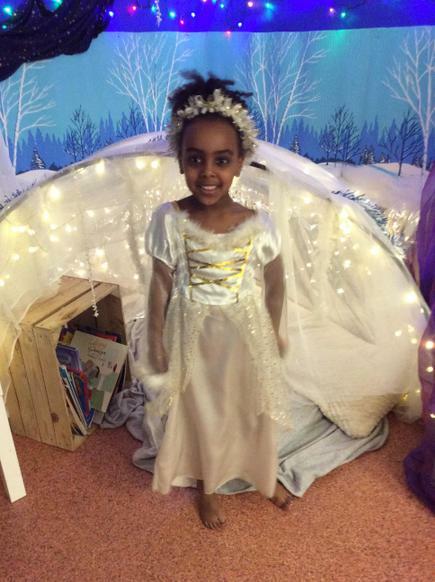 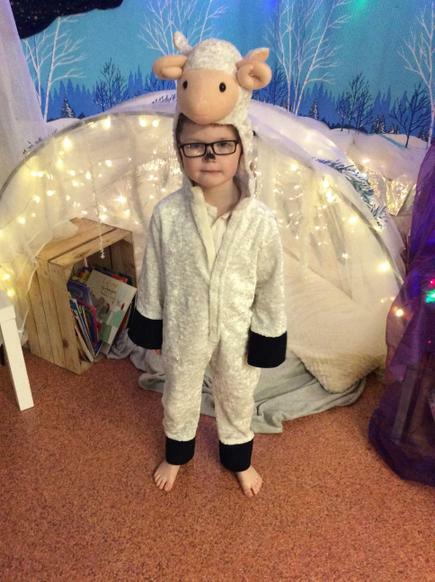 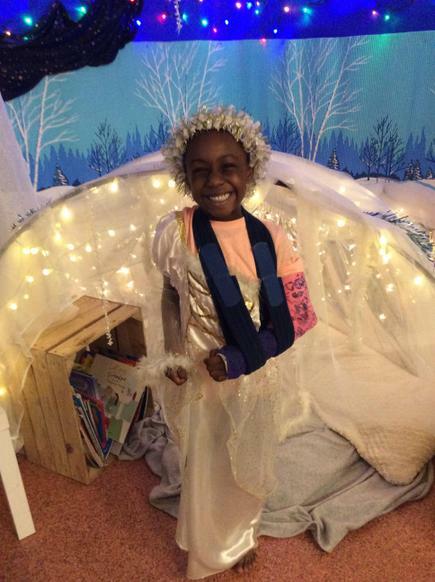 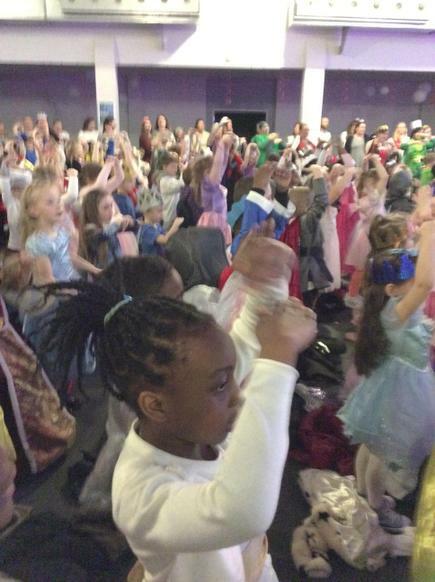 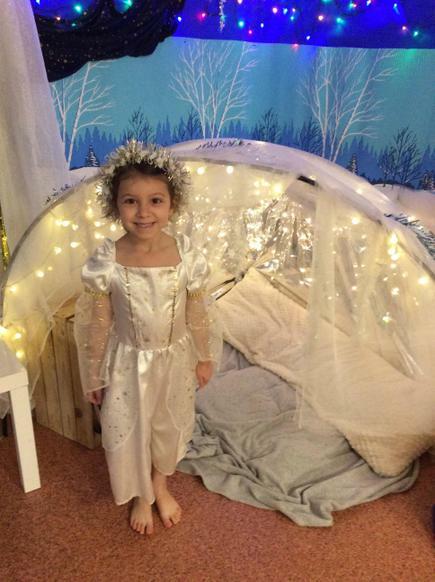 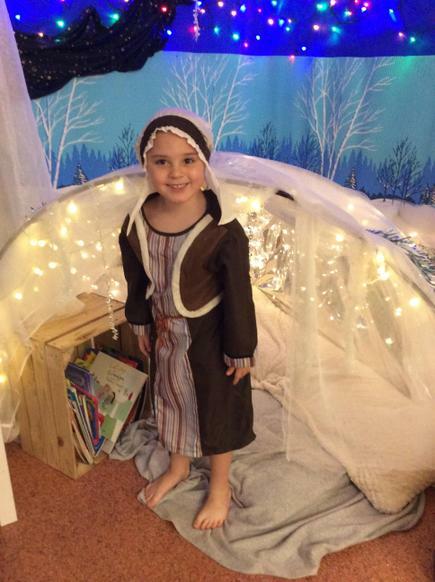 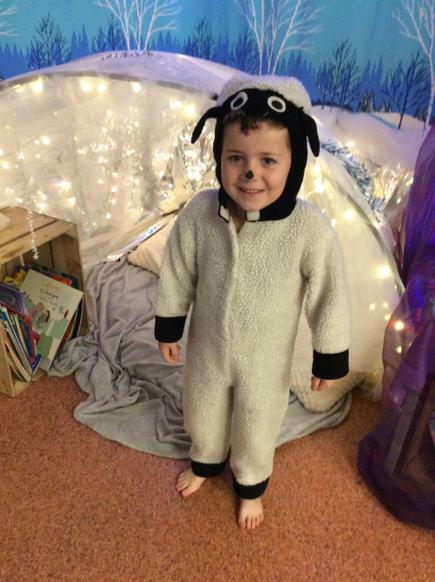 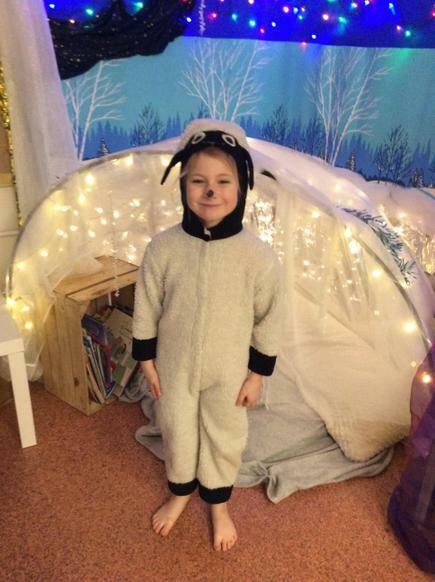 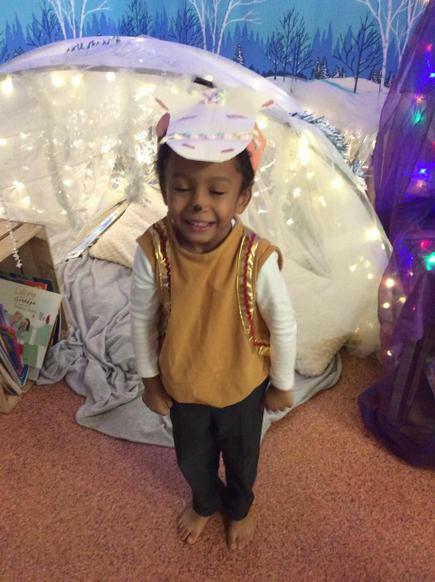 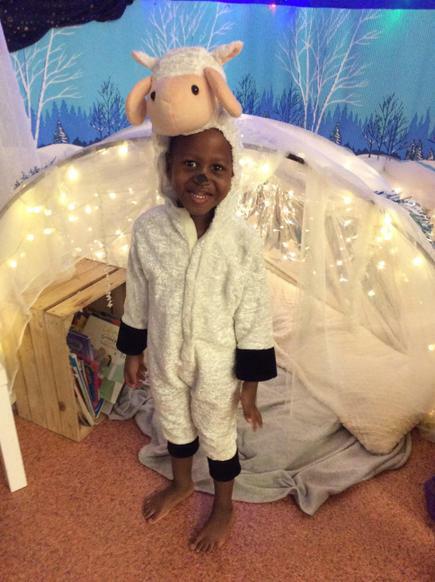 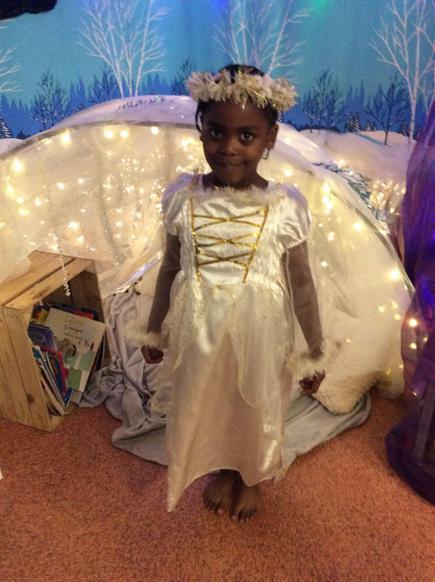 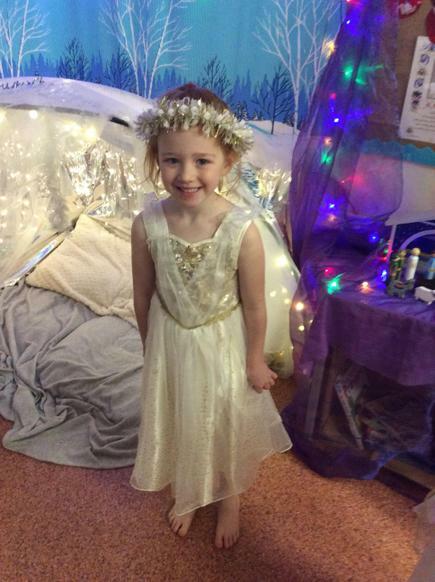 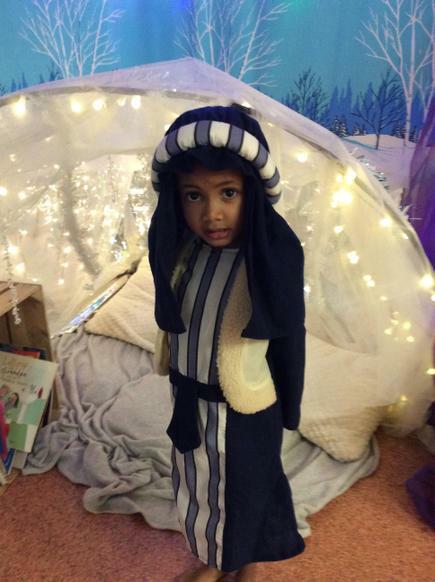 The children performed spectacularly in our Christmas Nativity and looked fantastic in their costumes! 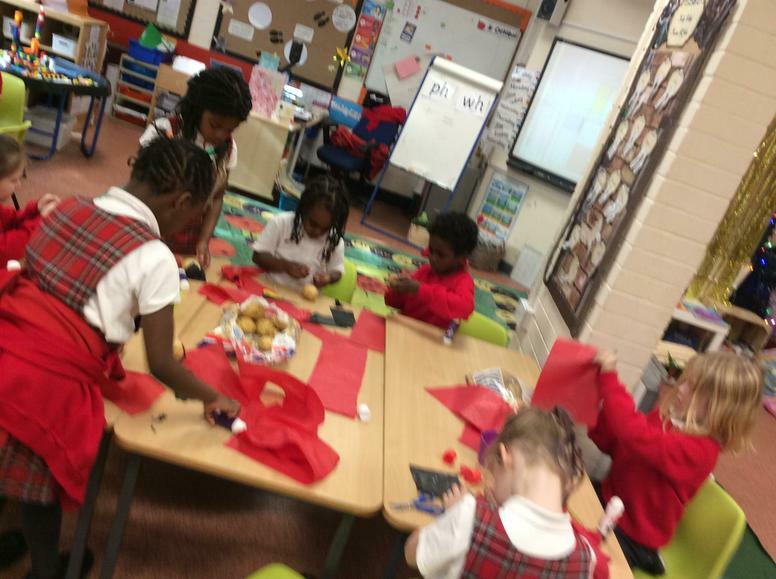 The children made their own Advent wreaths after discussing how we use them and how the different parts are represented. 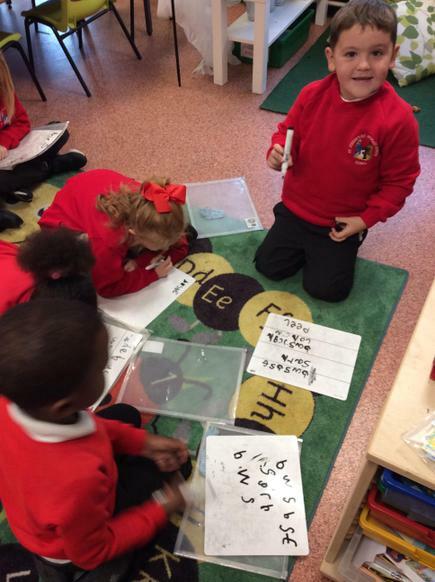 we have been working hard in maths this week, looking at the value of teen numbers and partitioning numbers using the numicon and base ten. 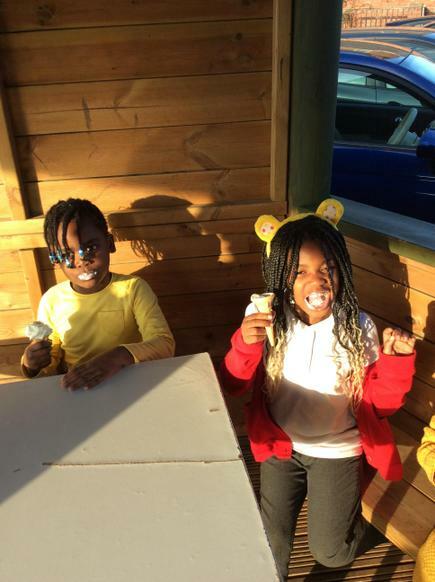 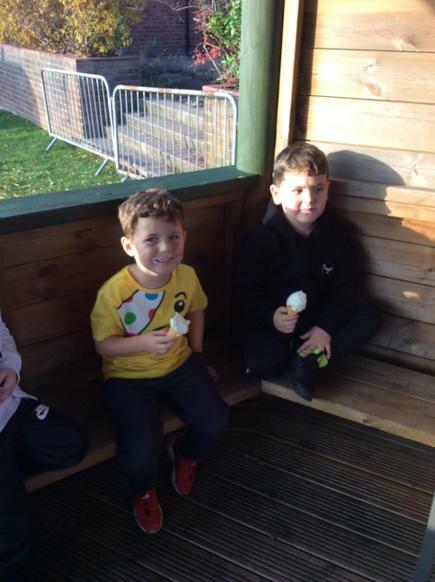 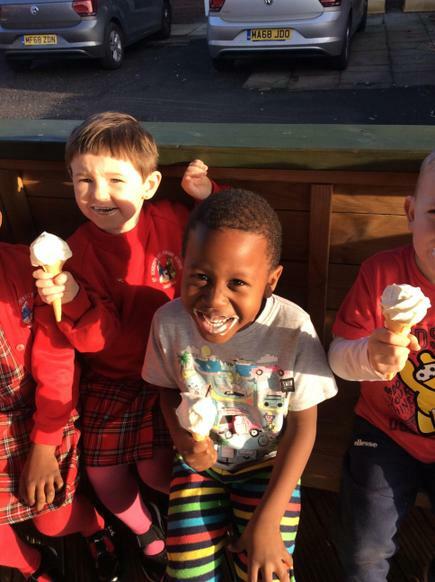 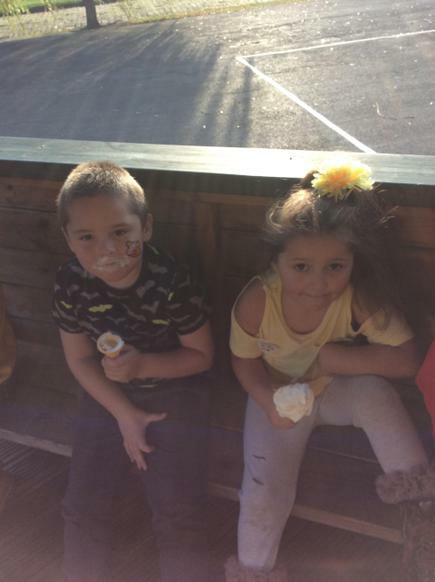 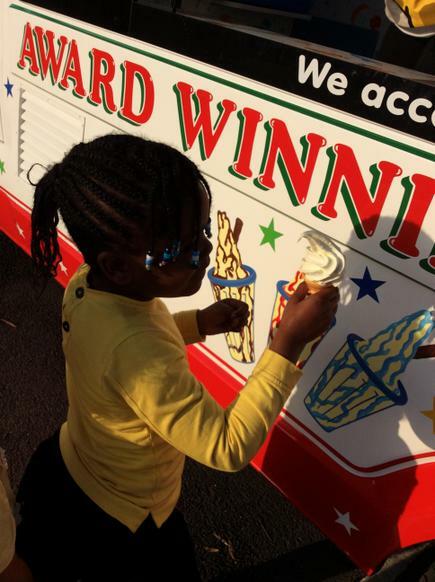 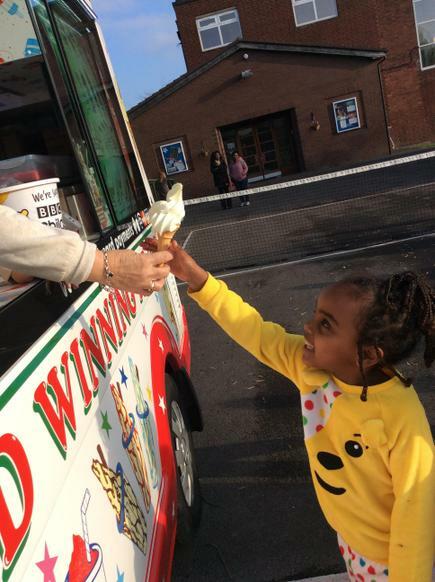 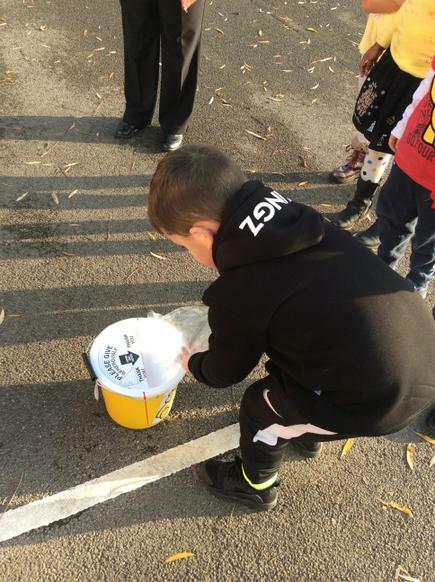 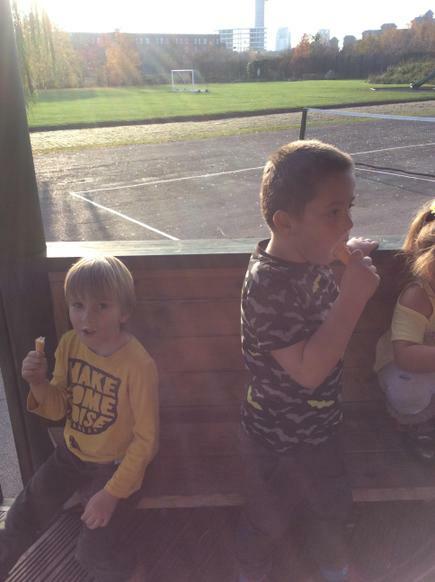 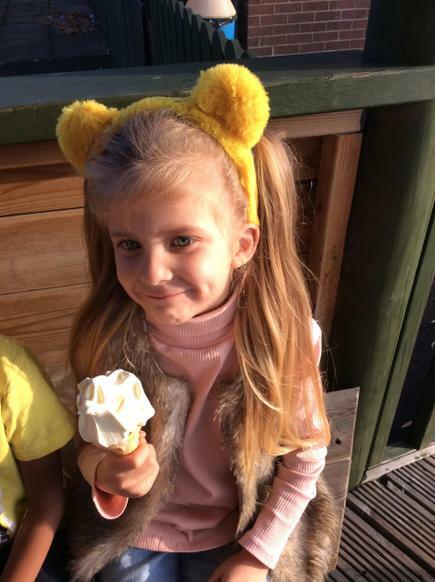 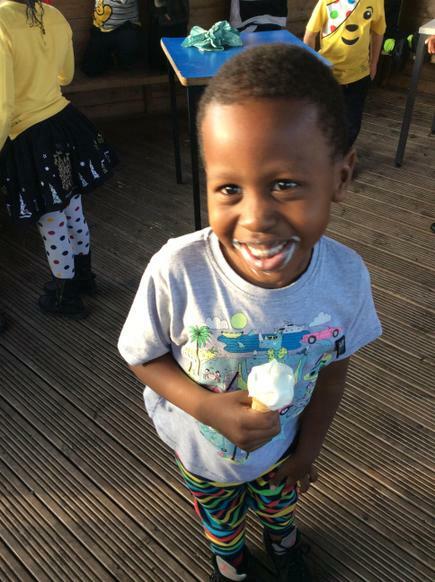 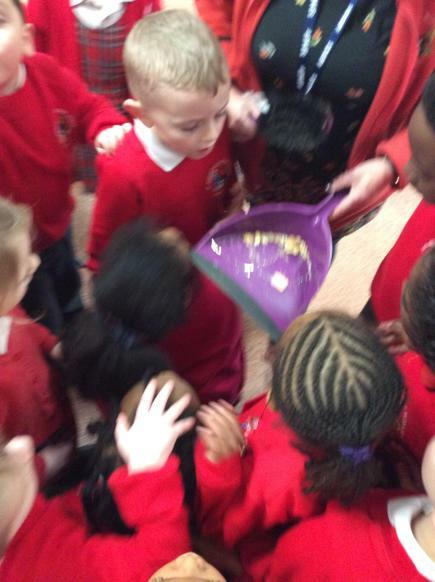 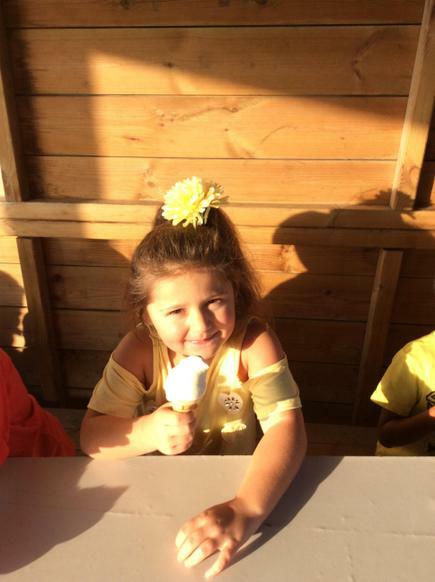 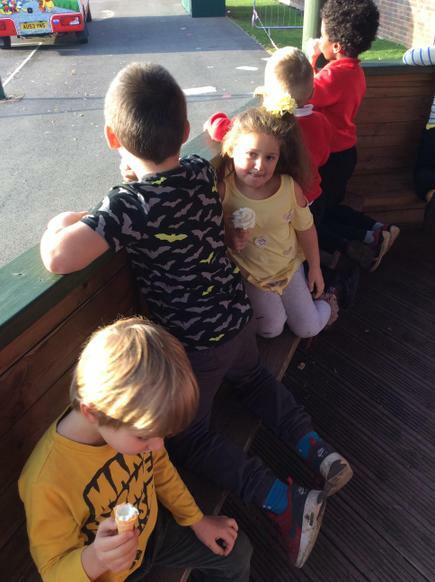 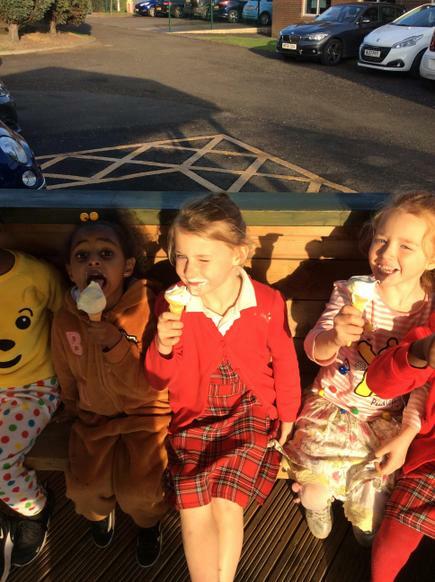 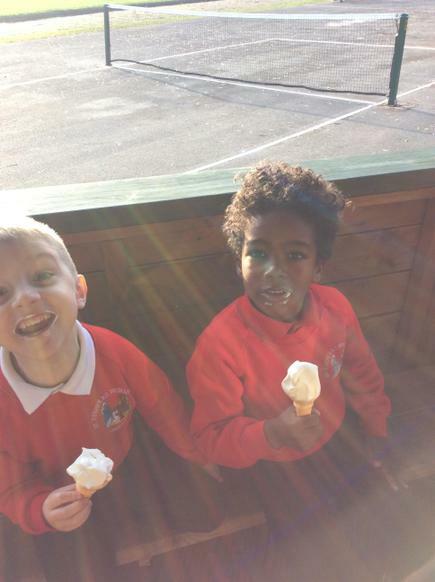 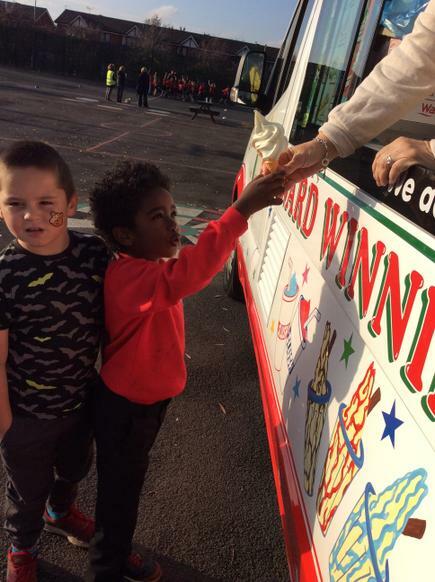 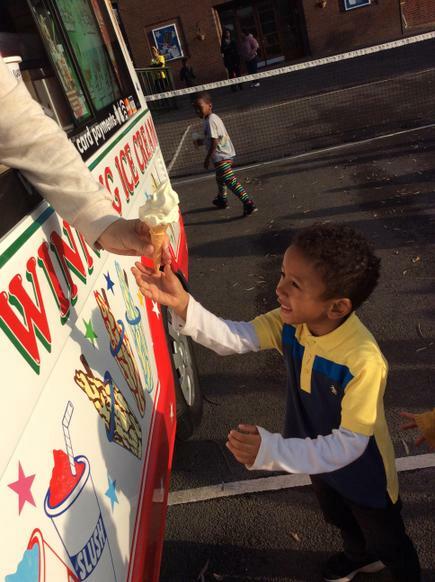 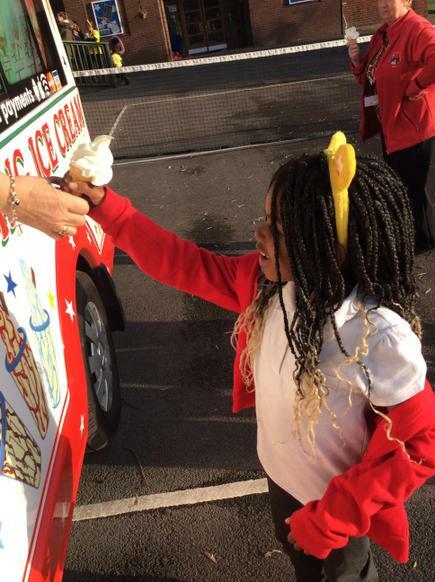 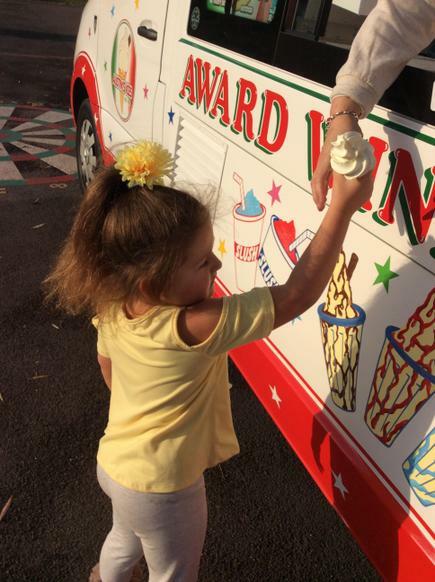 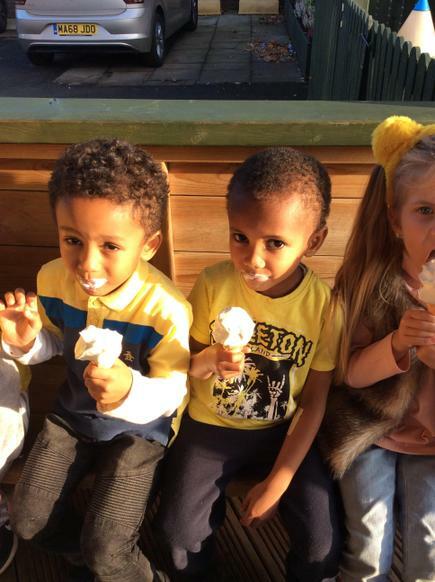 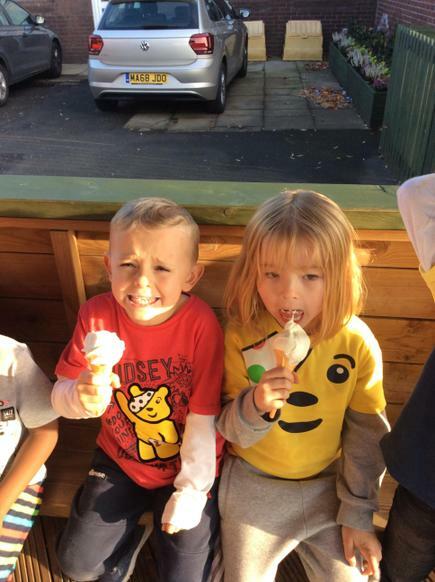 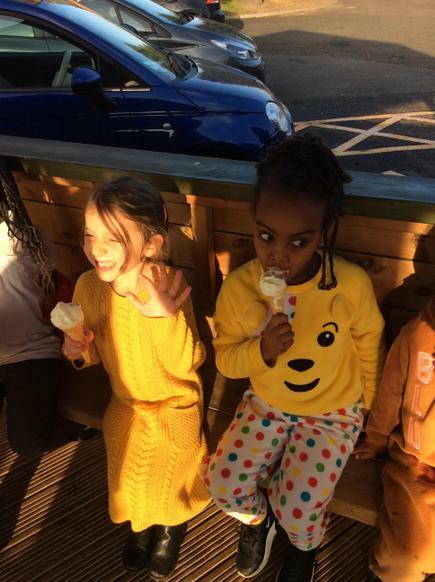 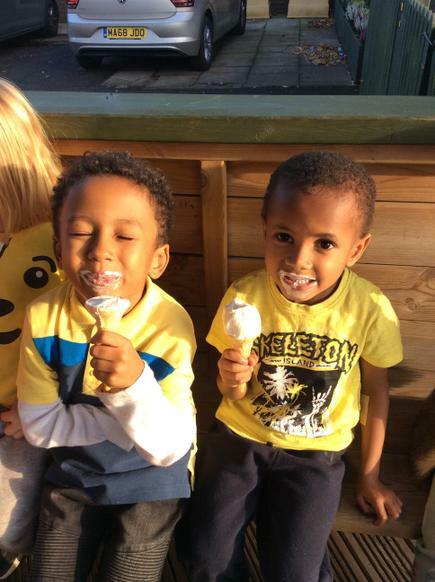 The children love their ice cream from Austin and we had a lovely day raising money for a Children in Need! 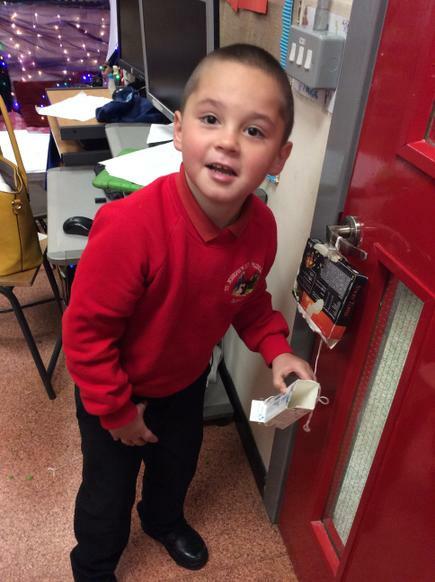 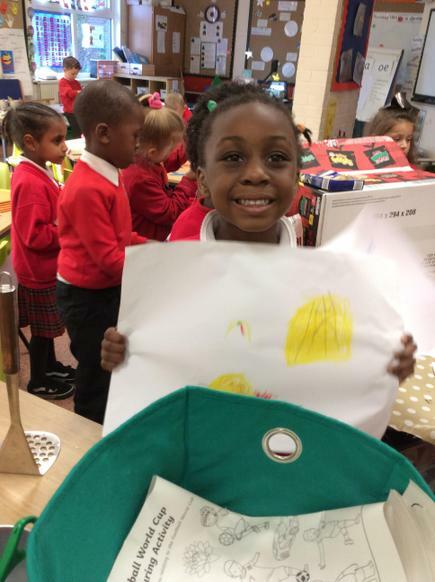 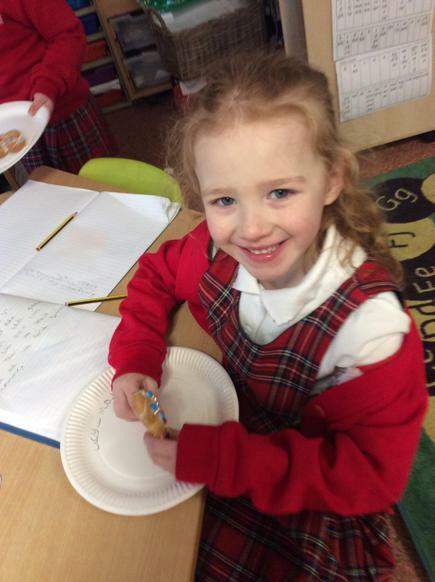 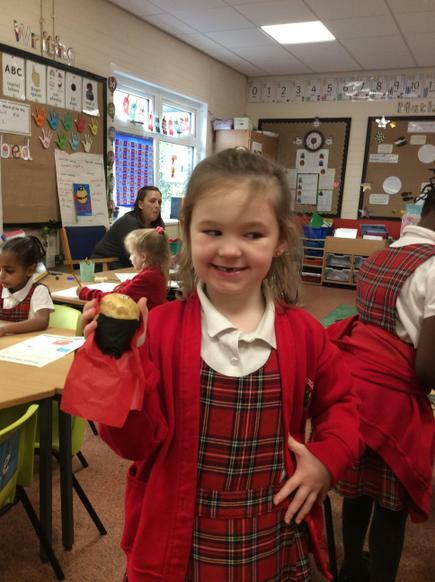 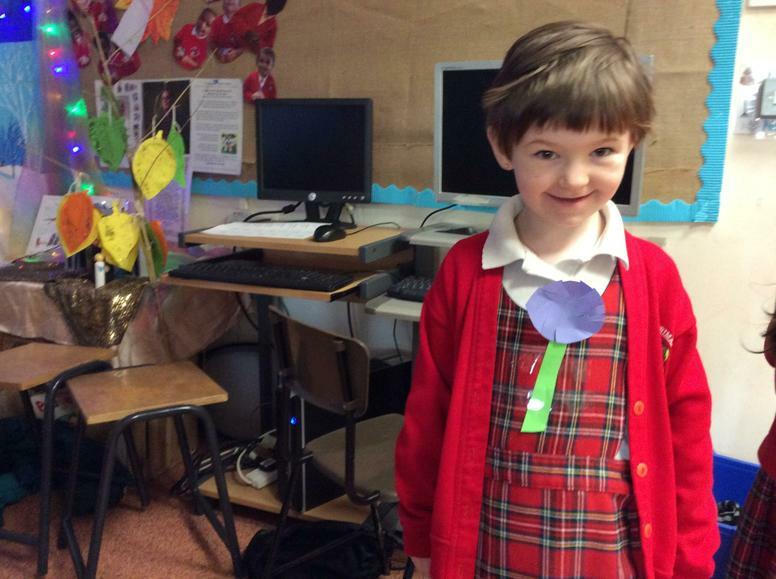 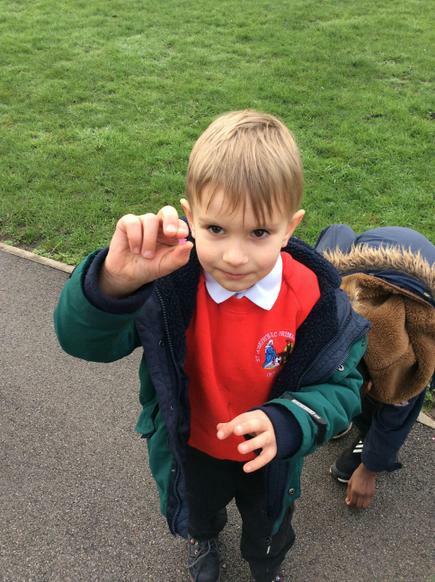 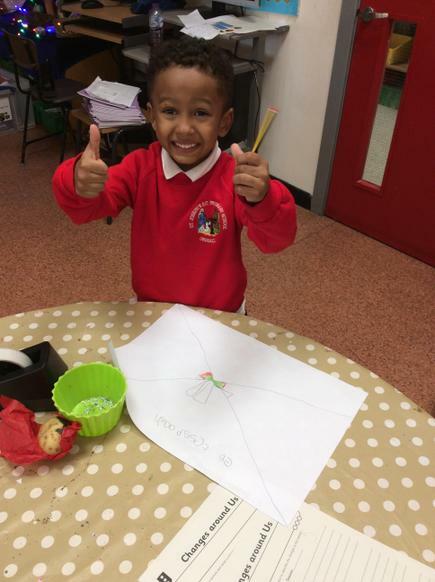 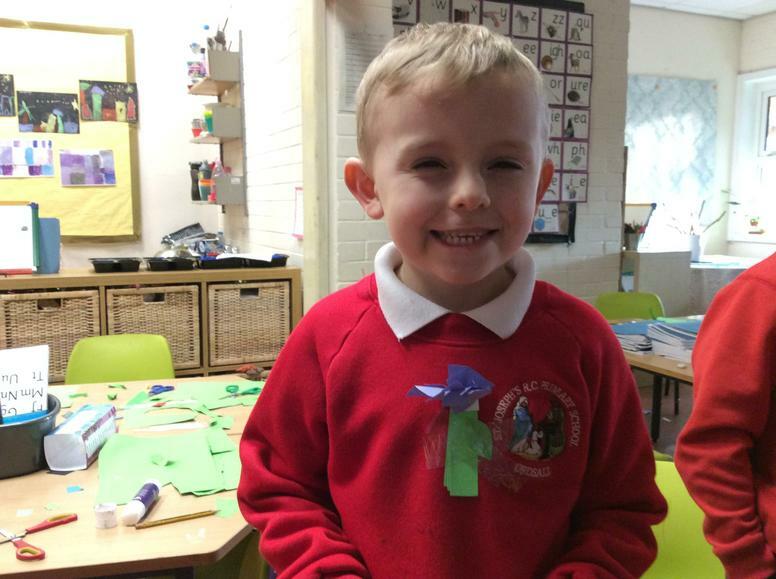 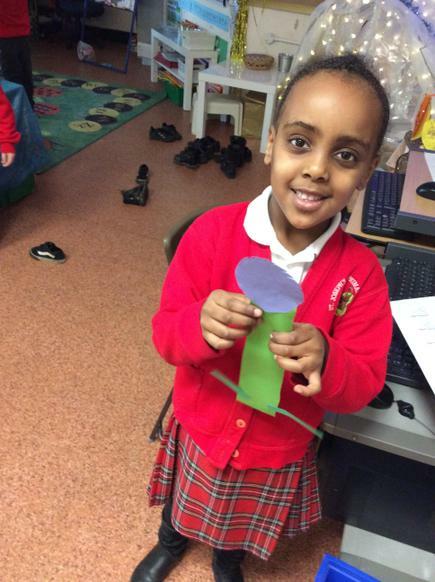 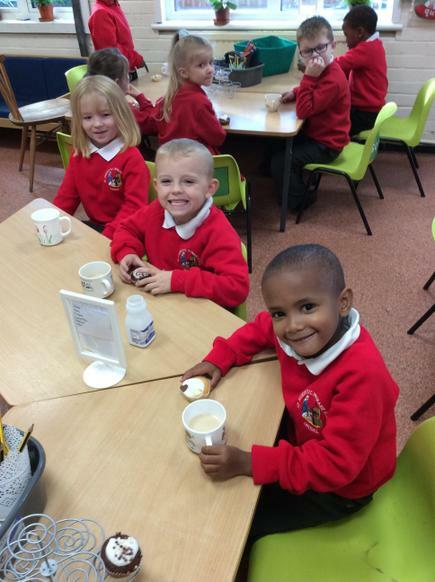 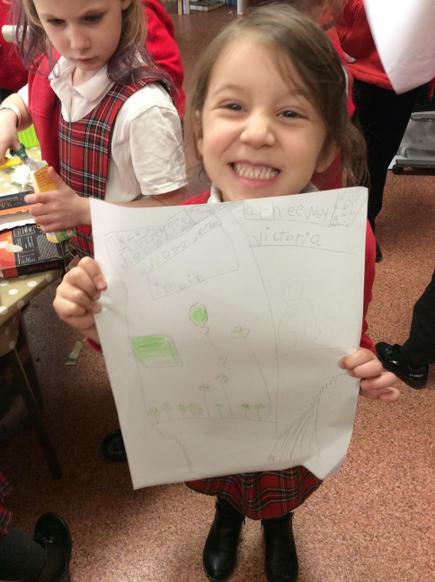 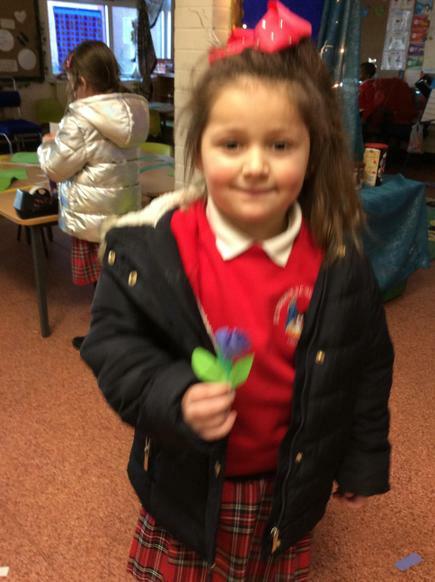 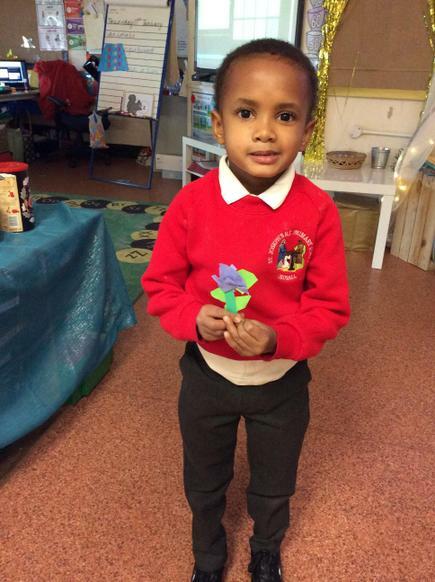 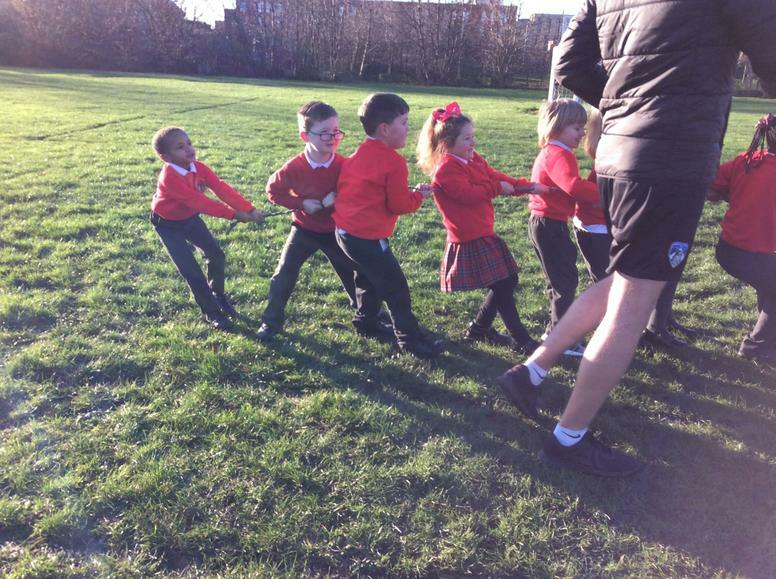 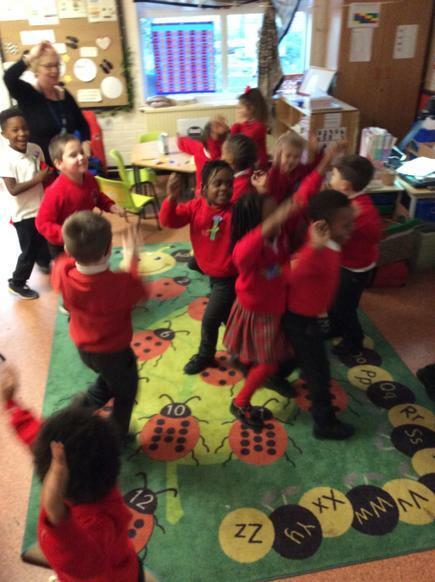 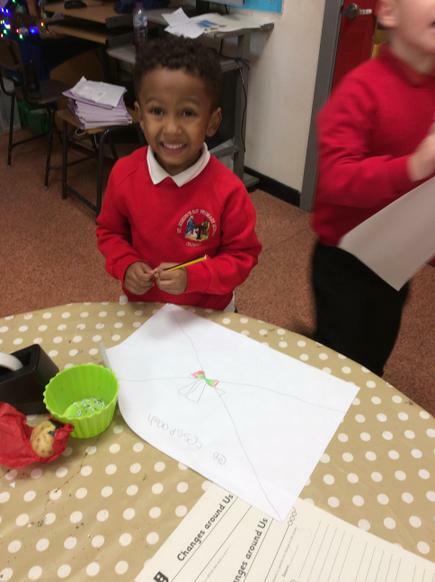 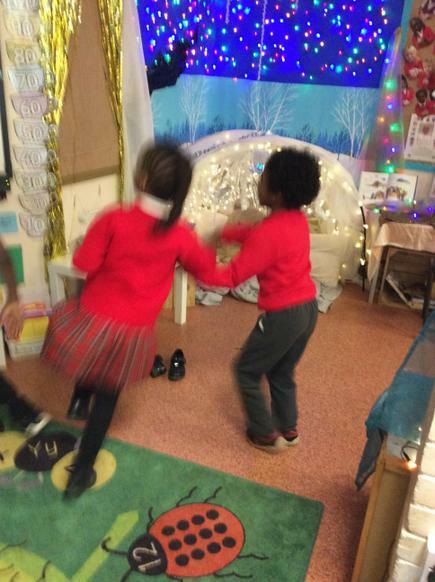 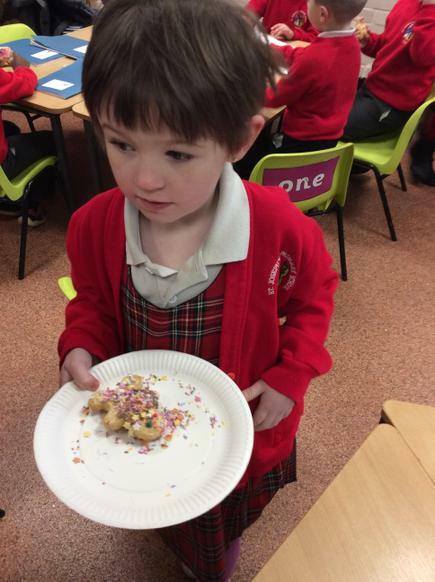 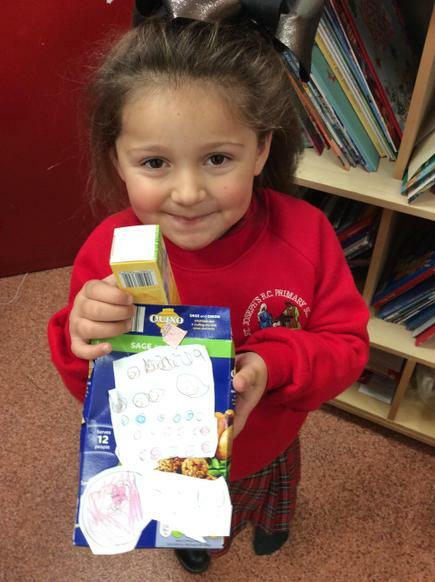 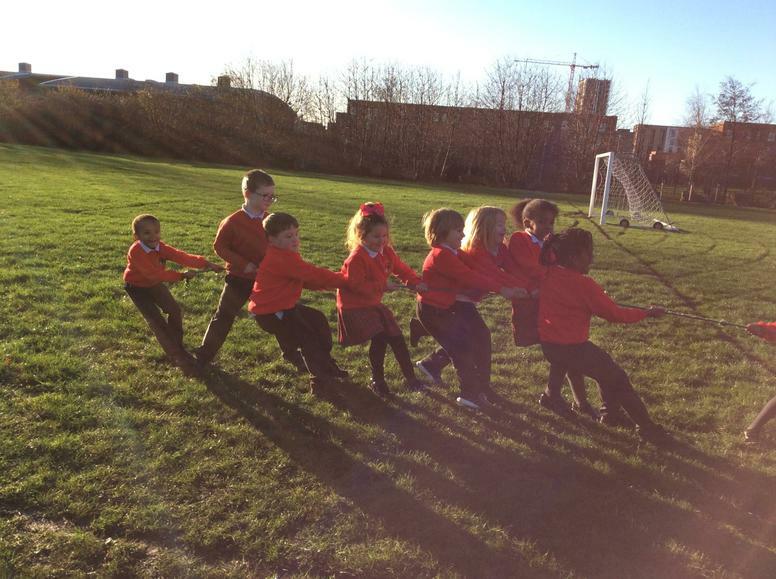 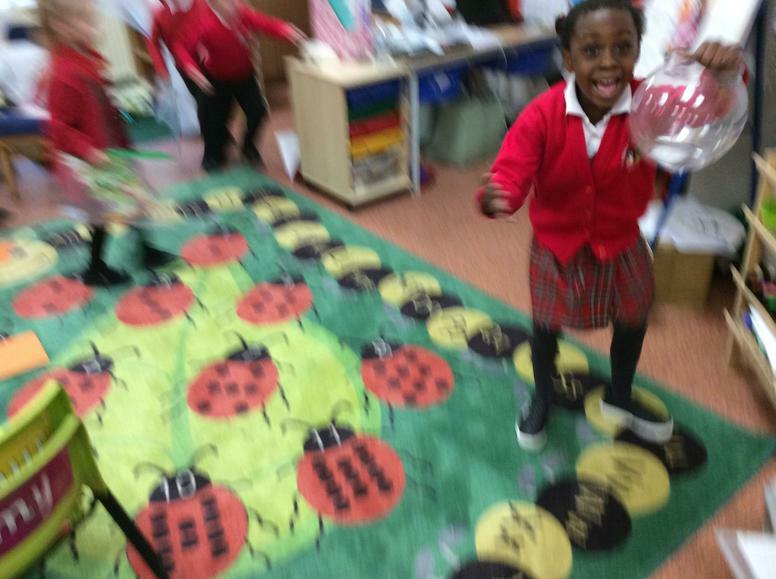 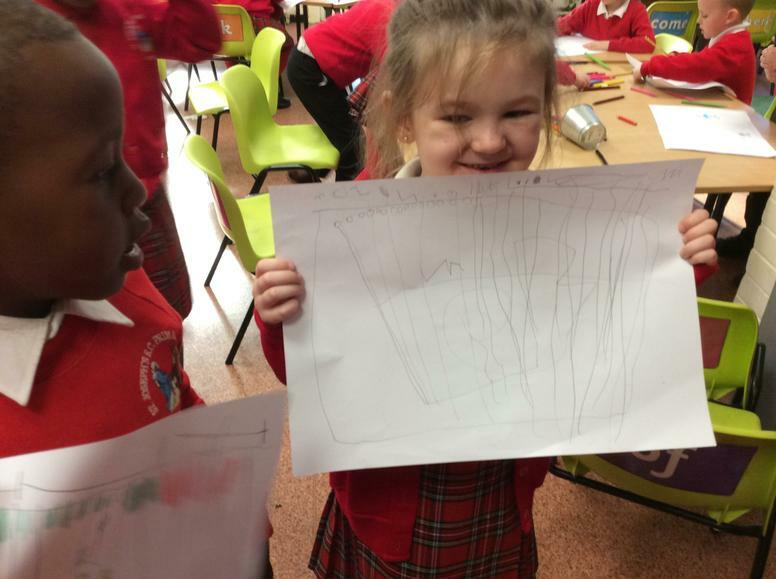 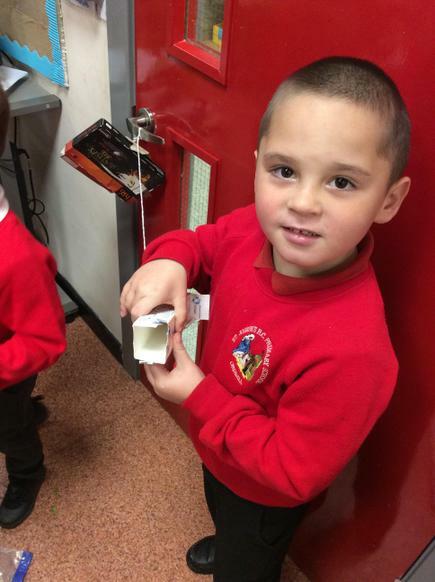 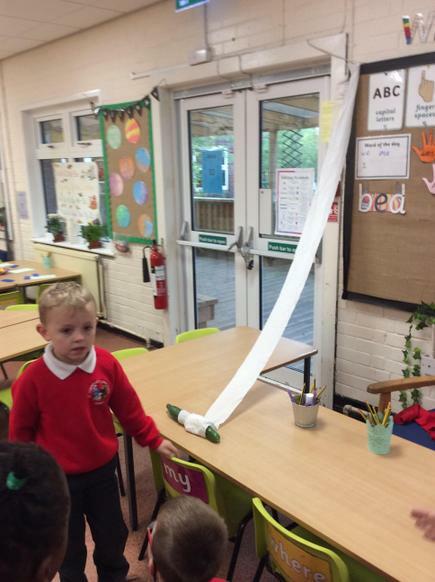 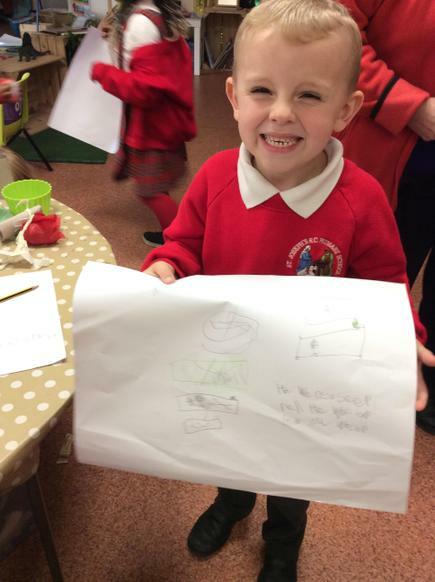 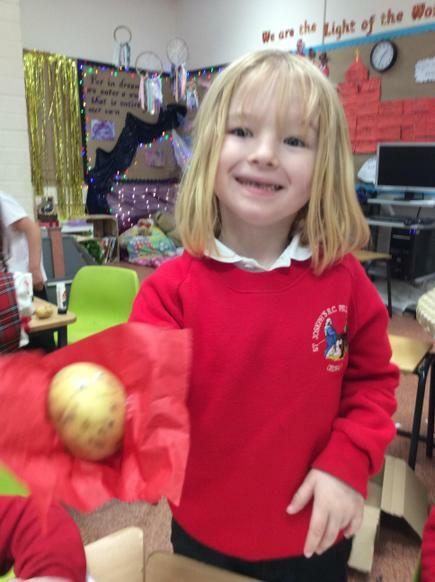 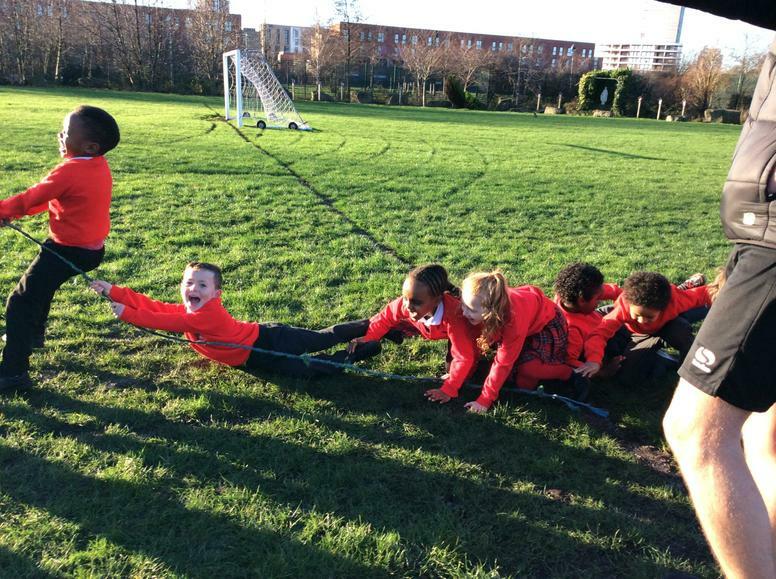 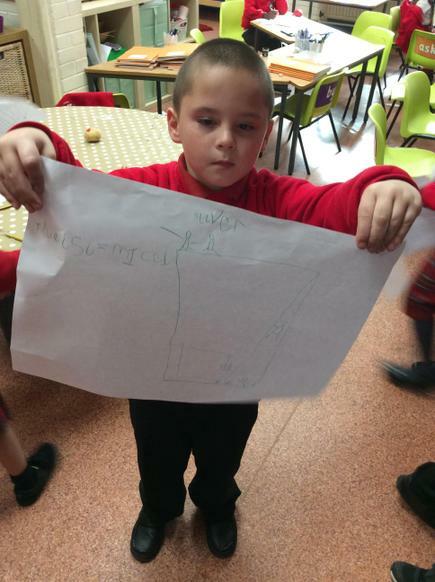 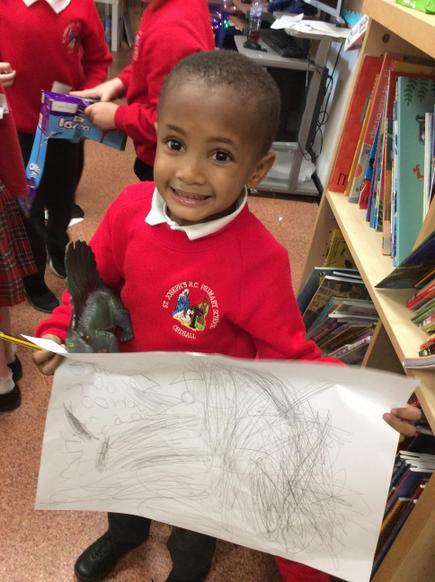 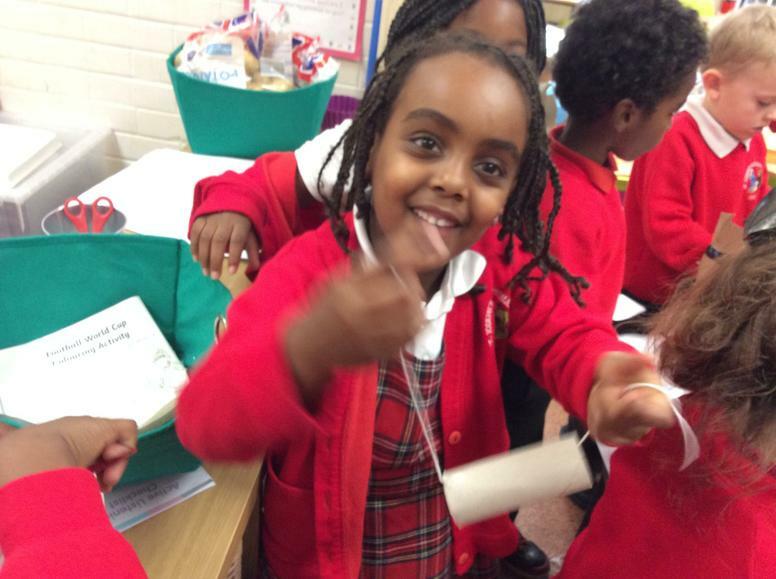 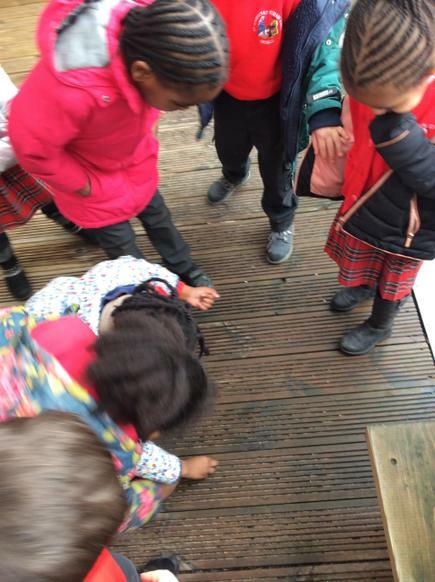 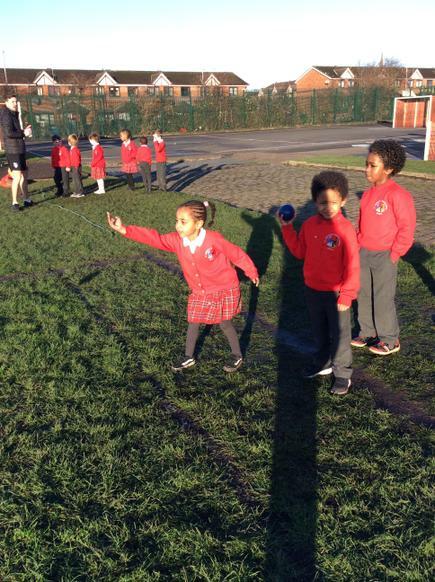 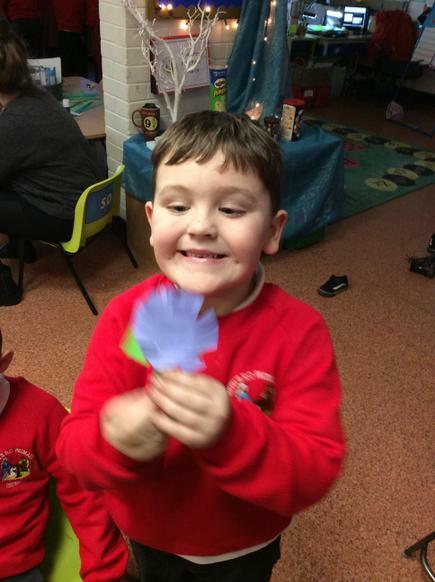 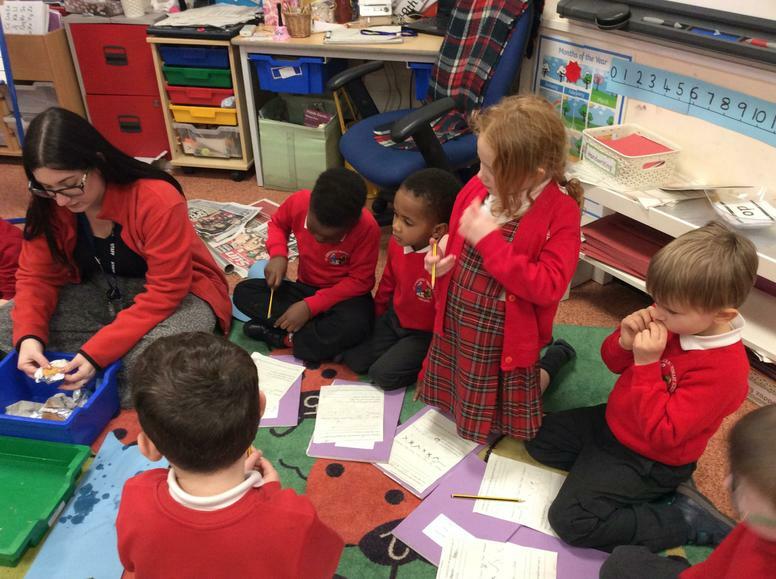 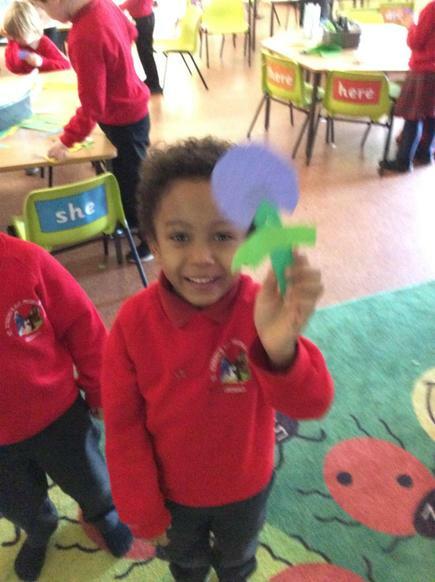 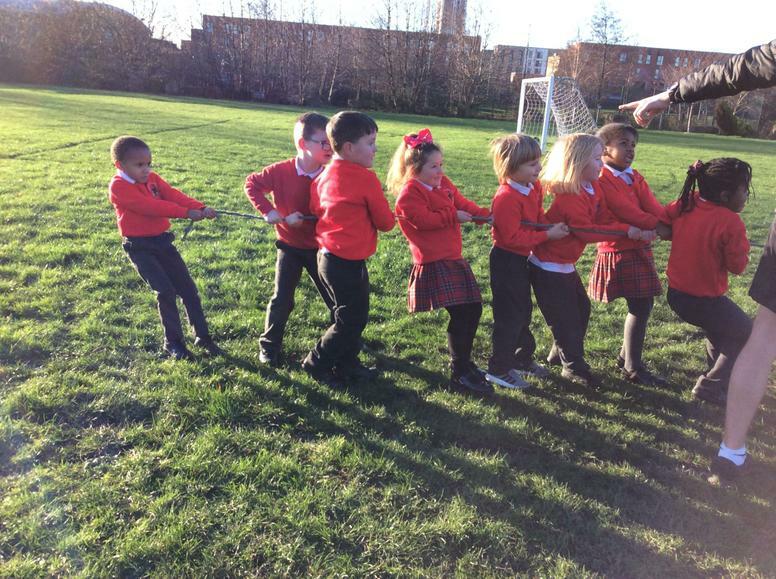 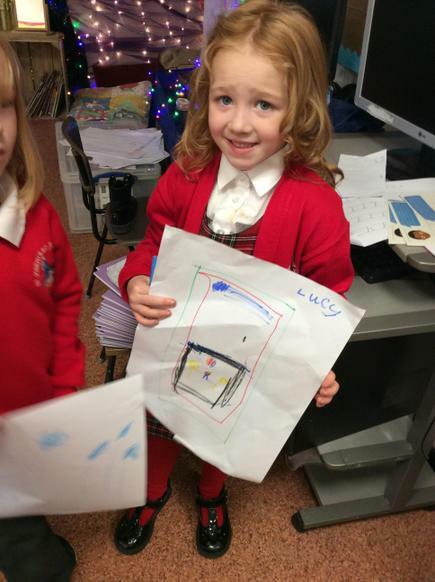 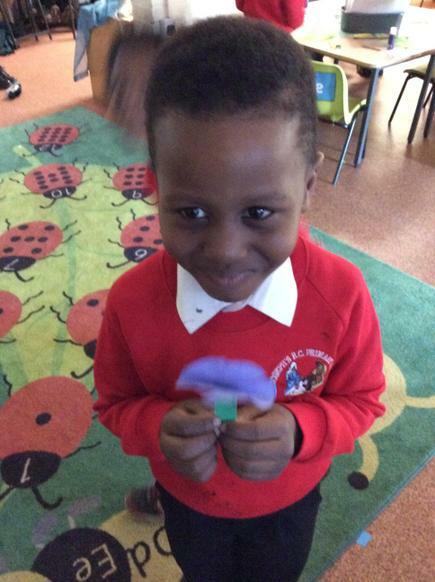 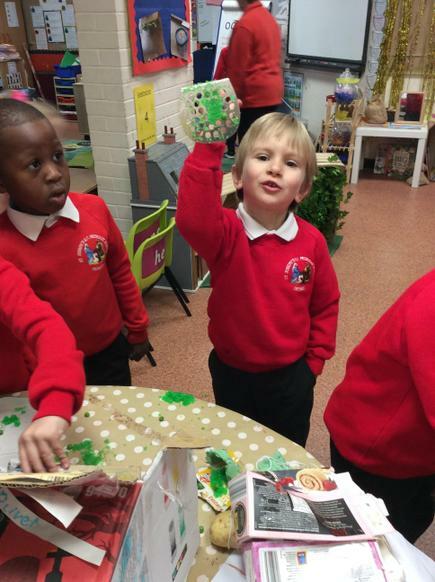 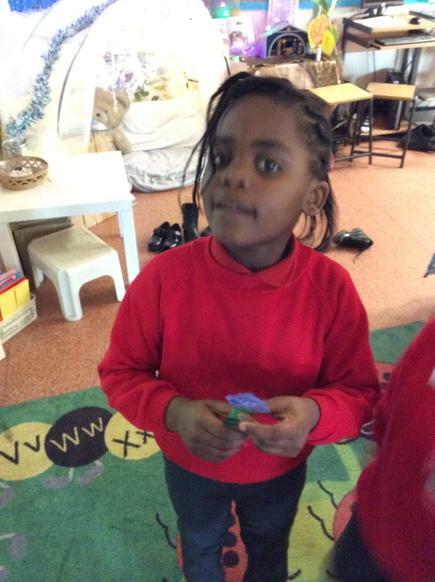 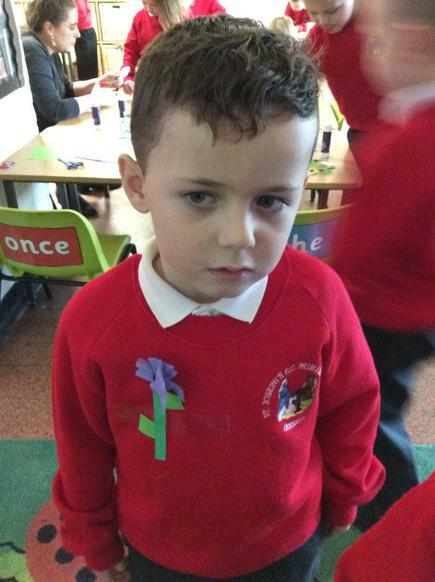 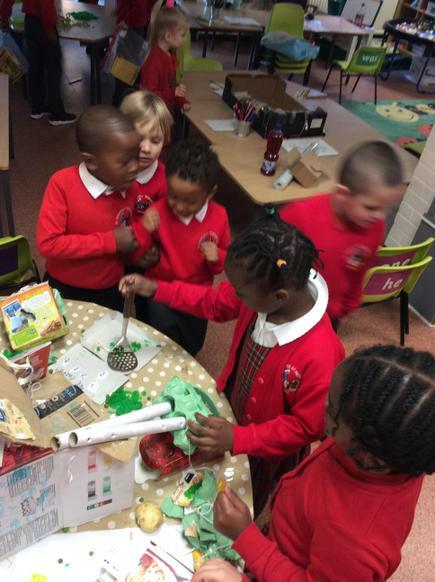 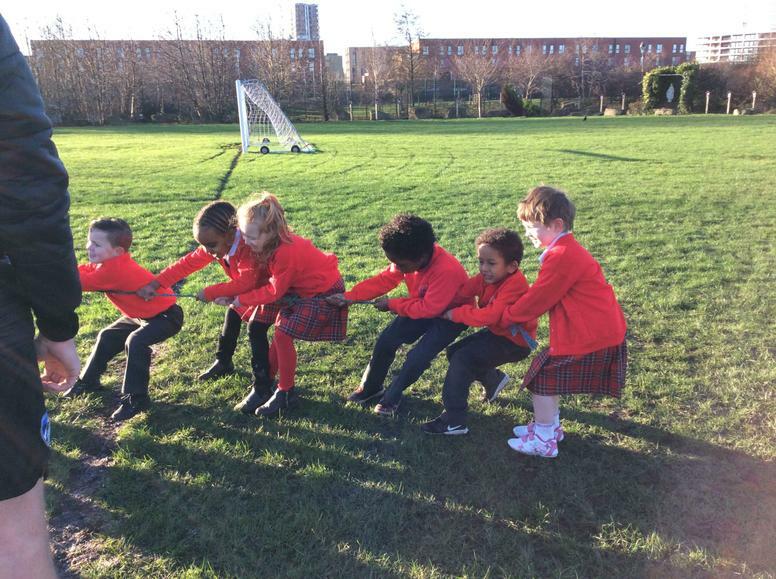 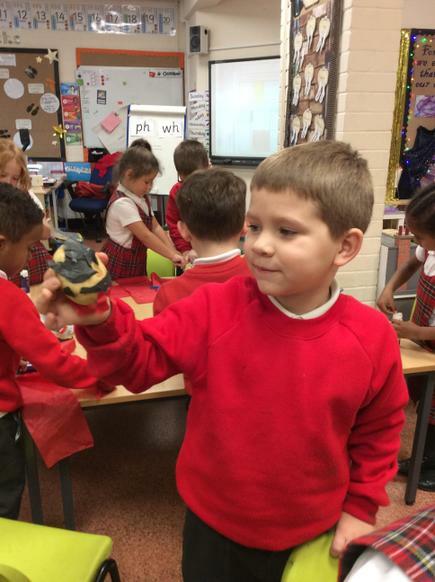 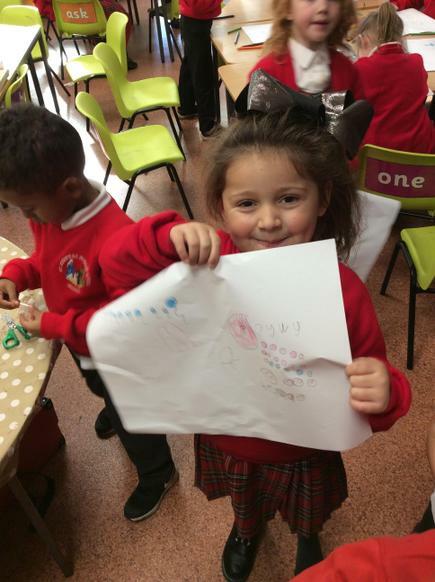 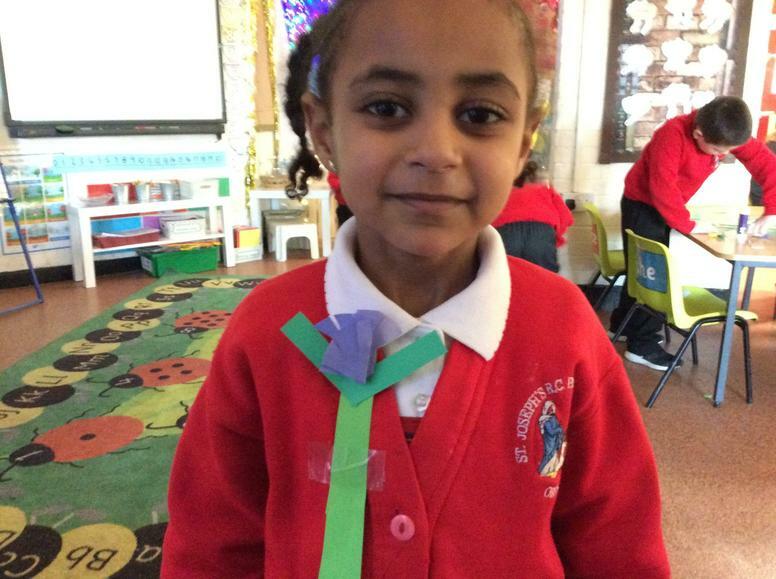 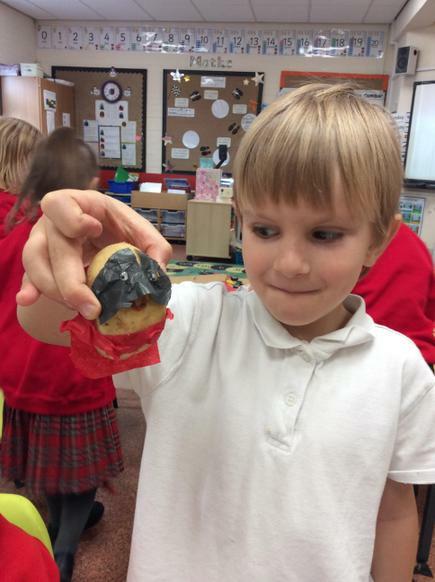 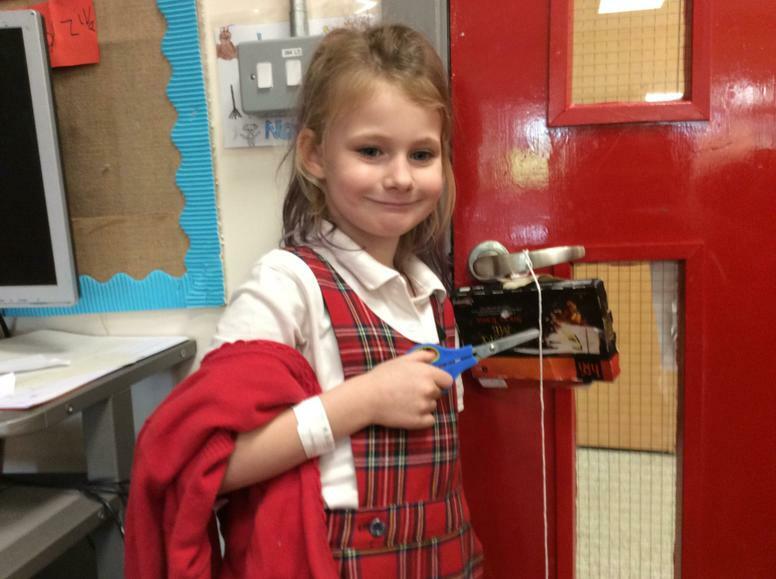 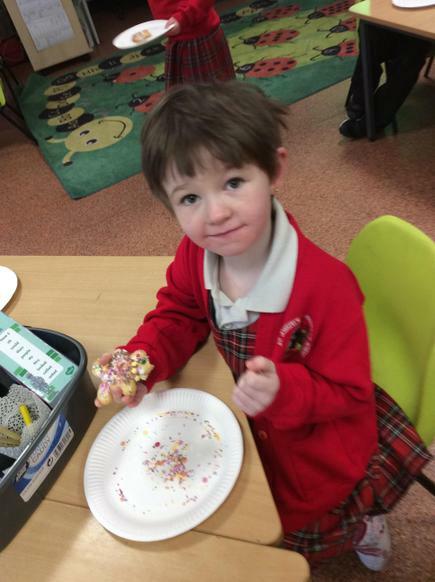 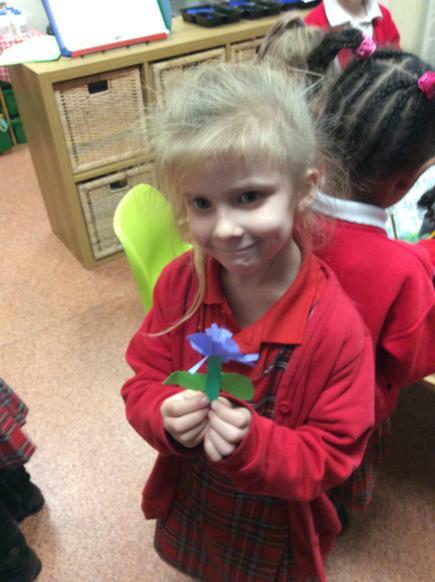 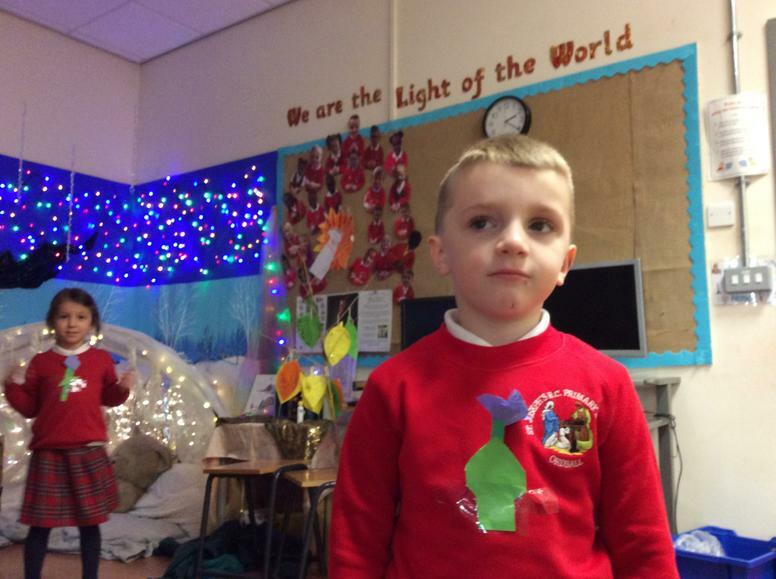 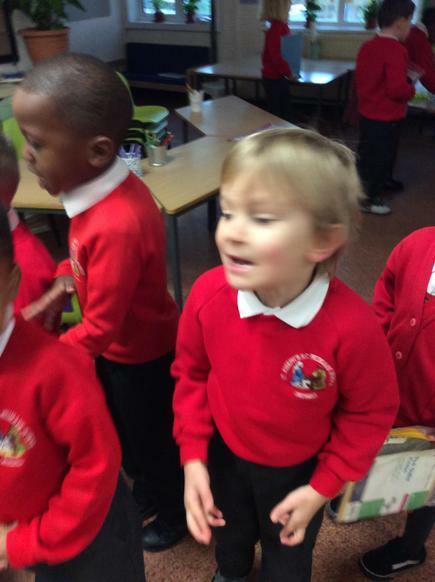 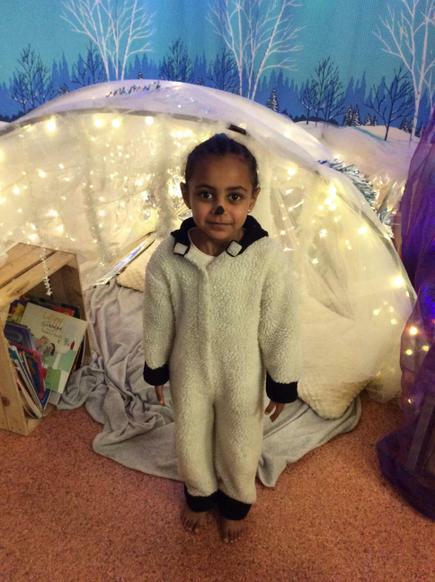 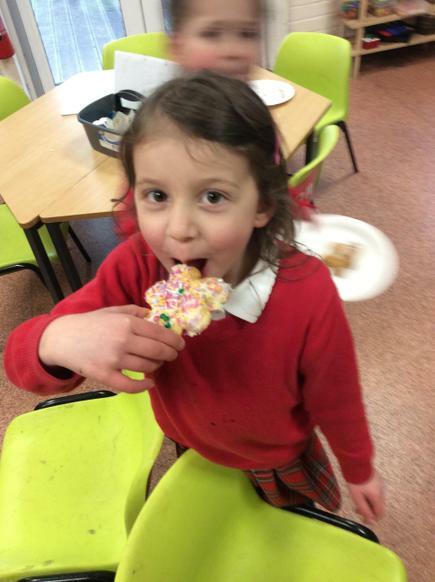 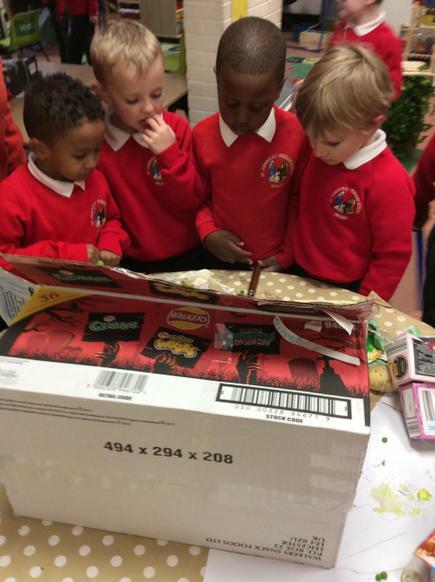 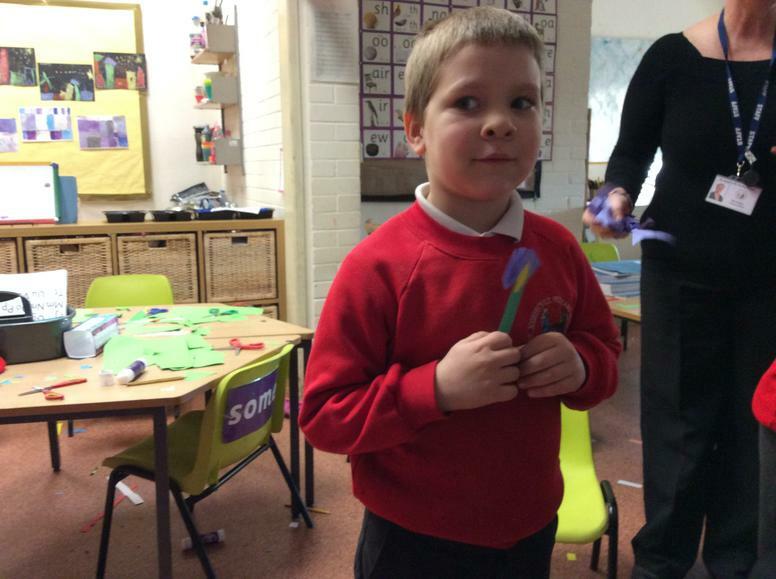 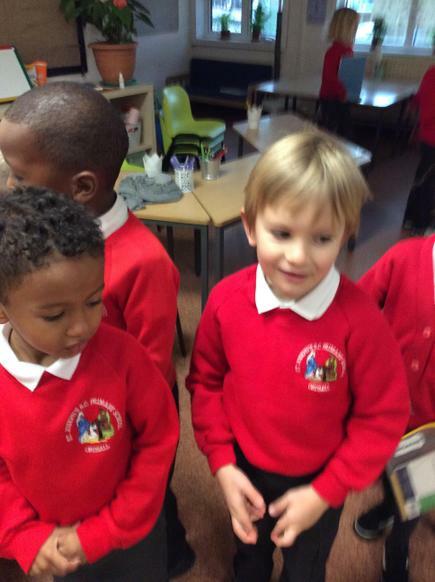 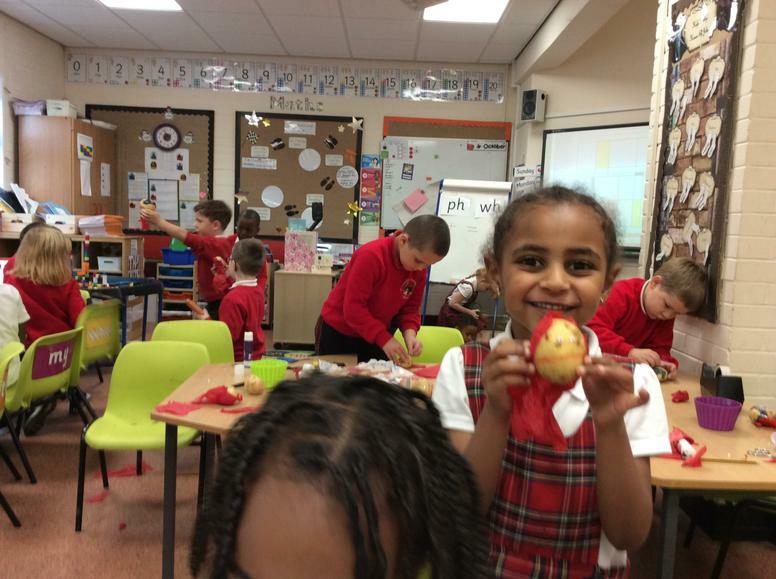 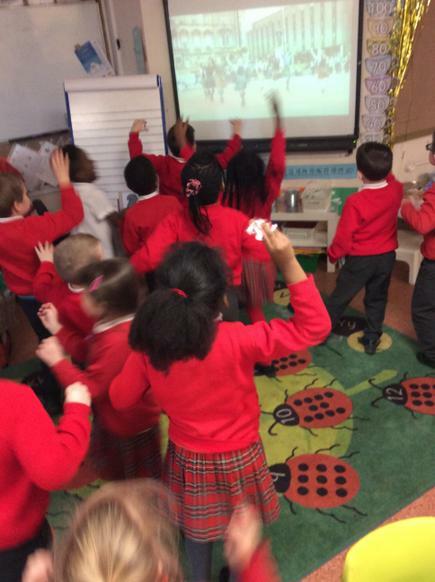 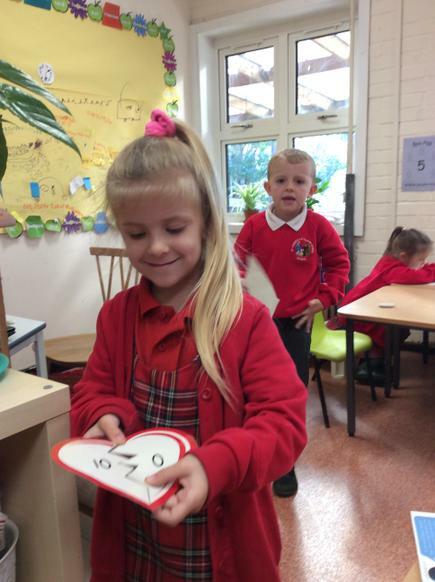 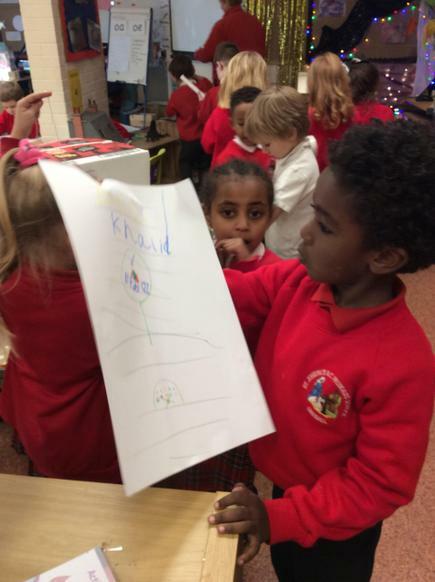 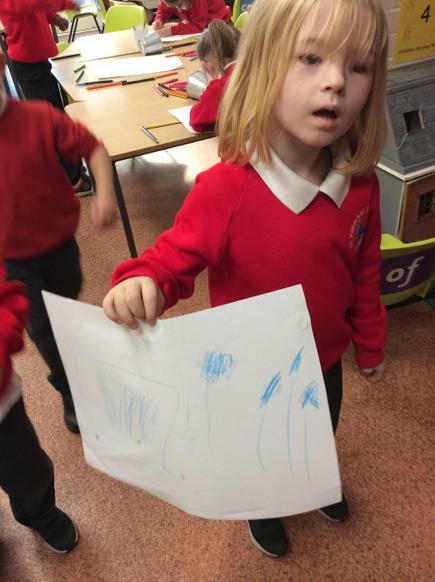 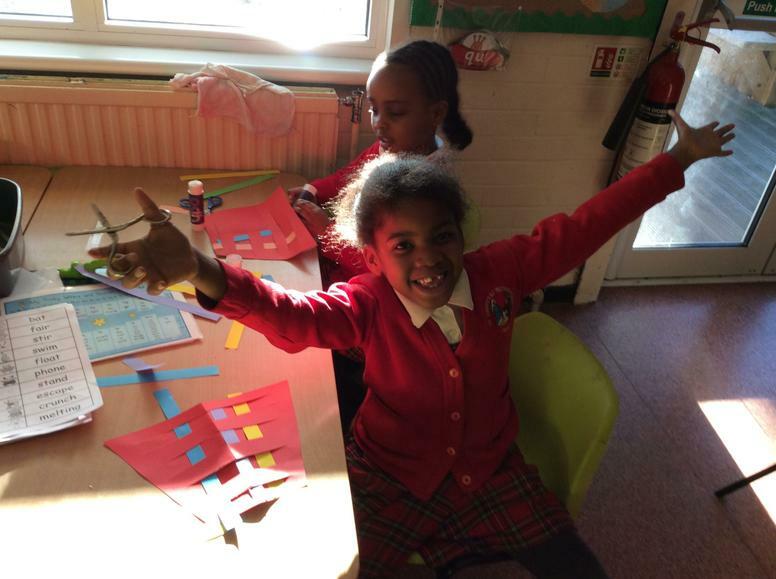 What a week in year 1! 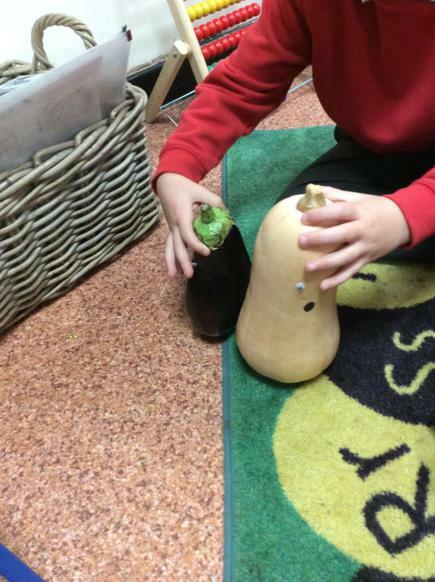 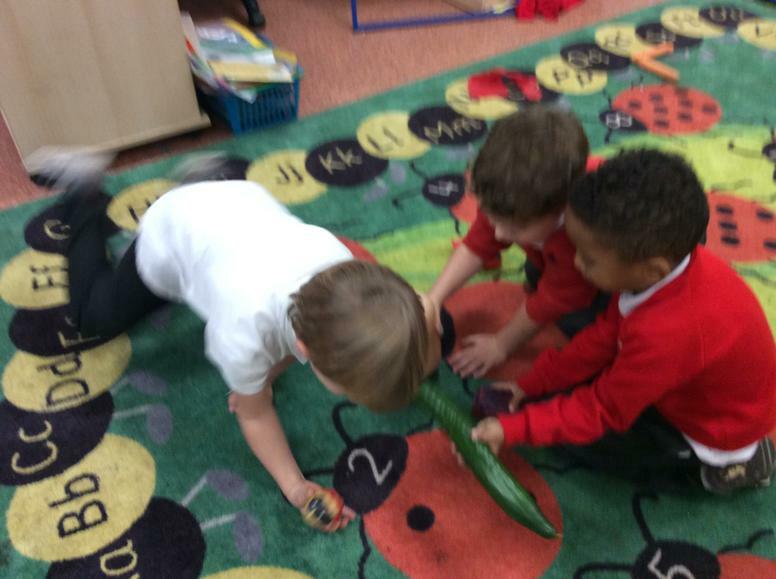 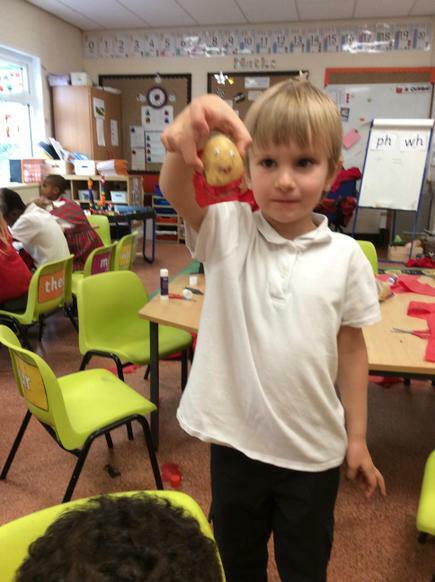 After reading the story ‘Supertato’ we came into class to find the evil peas had caused trouble with our vegetable friends! 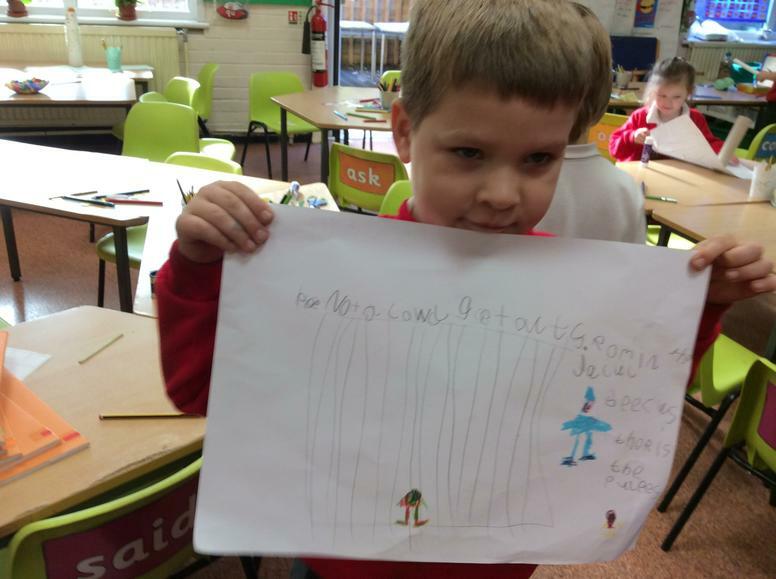 We rescued our friends and keep them safe while we wrote letters to Supertato asking for his help. 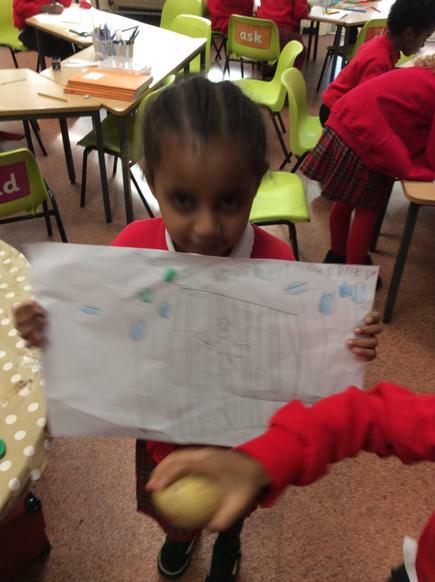 The next day our vegetable friends had completely vanished and Supertato had left us a note asking us to make some traps for the peas. 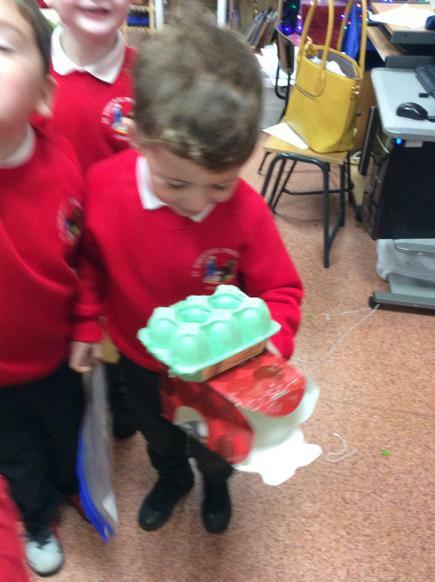 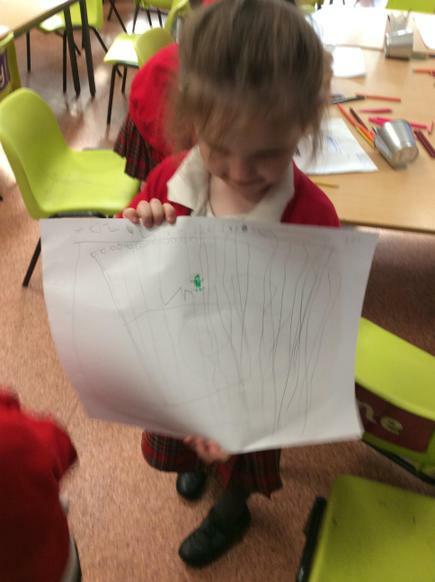 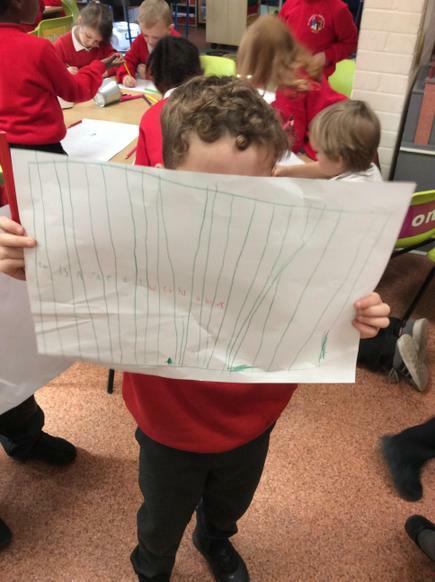 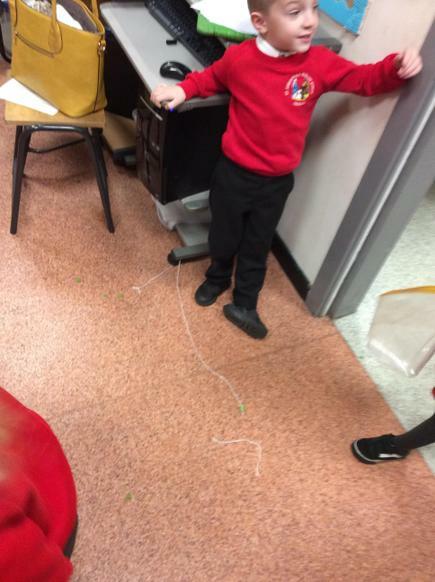 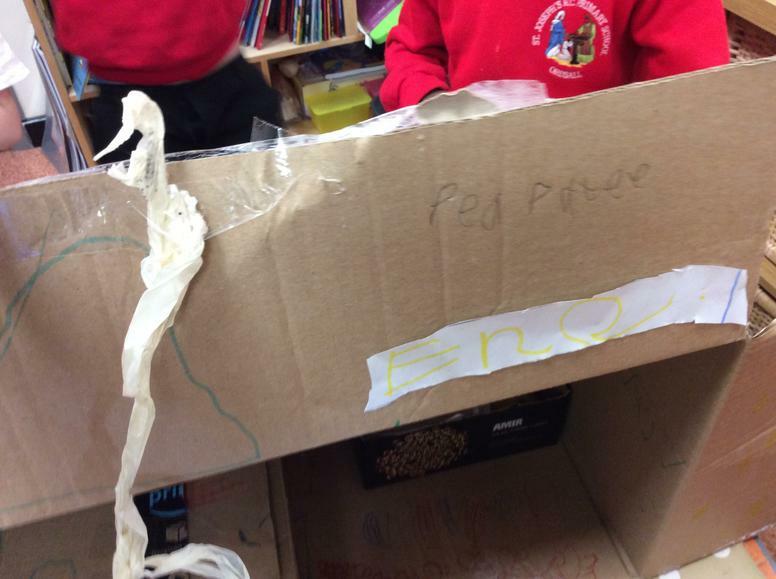 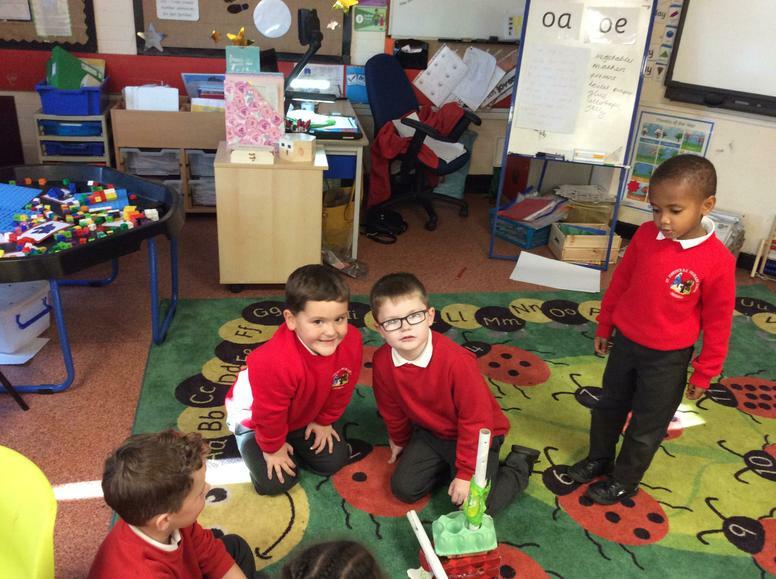 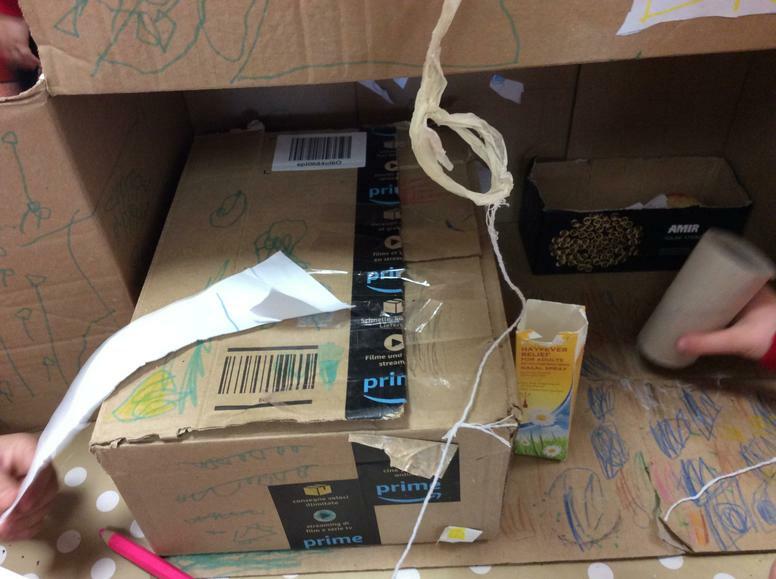 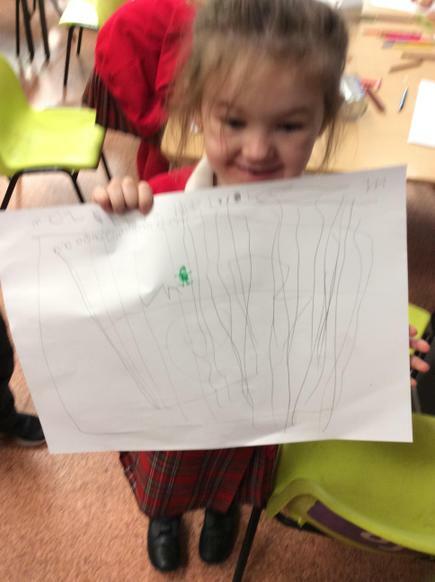 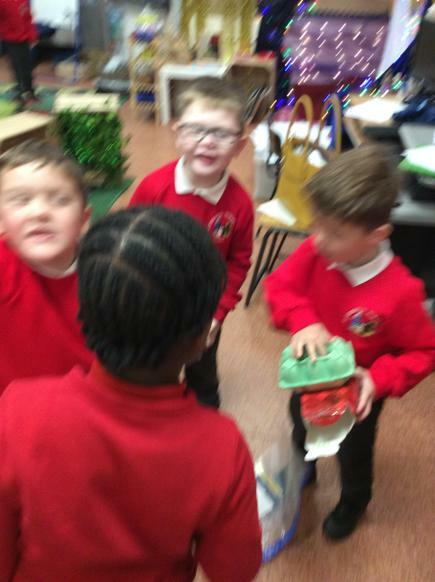 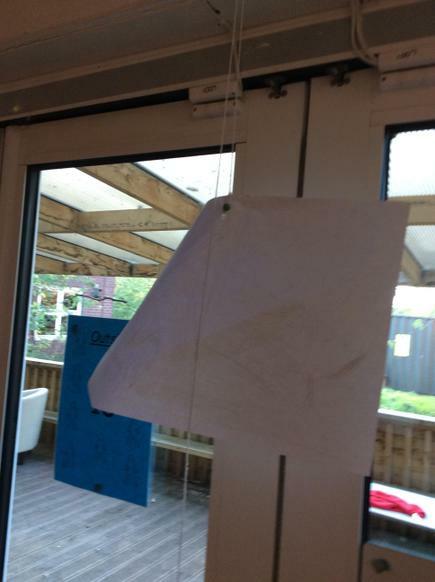 We got straight to work, designing and working with our friends to think of the best ways to capture those evil peas and when we came back to class our traps had worked! 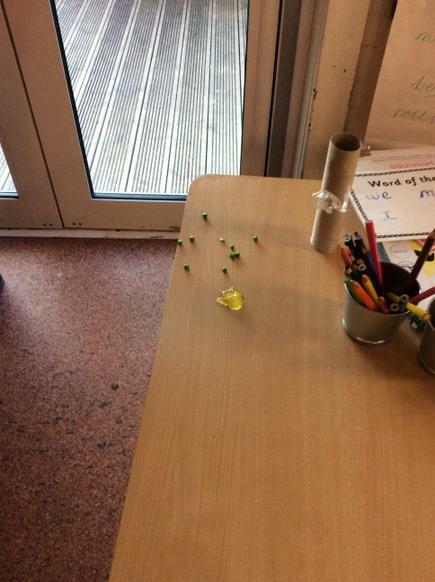 There were peas in all our traps! 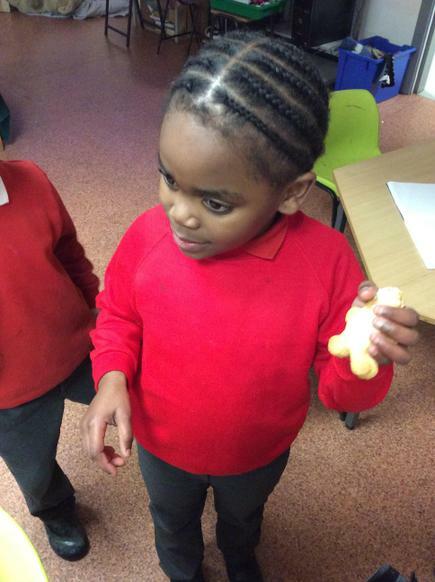 We collected them safely and put them back in the freezer where they promised to be good from now on. 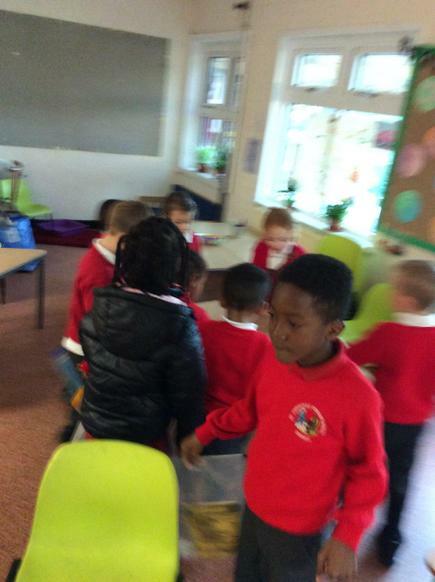 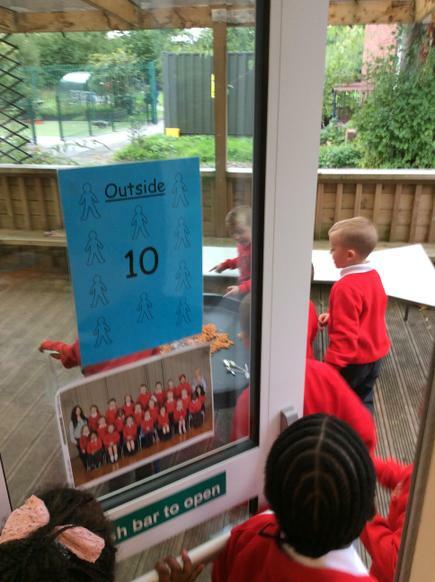 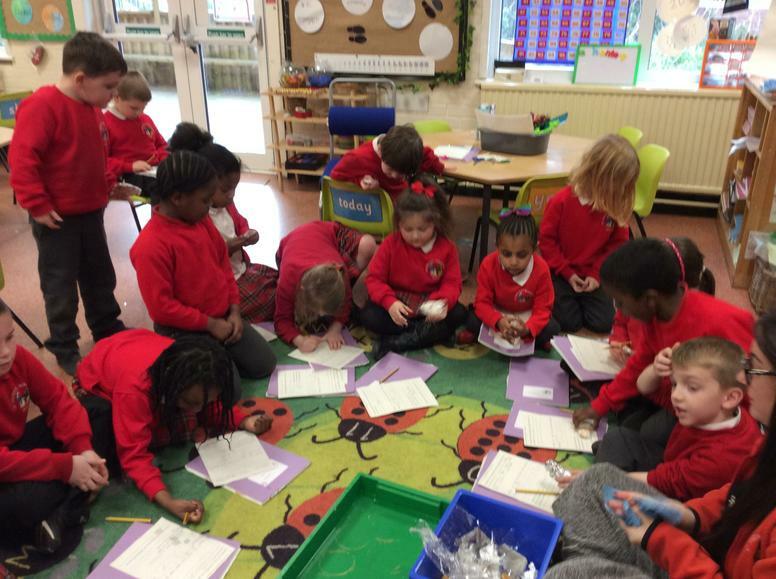 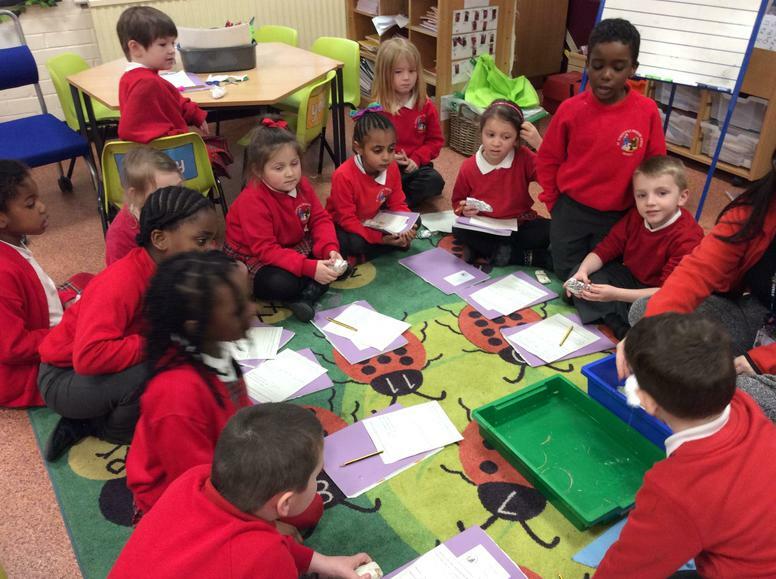 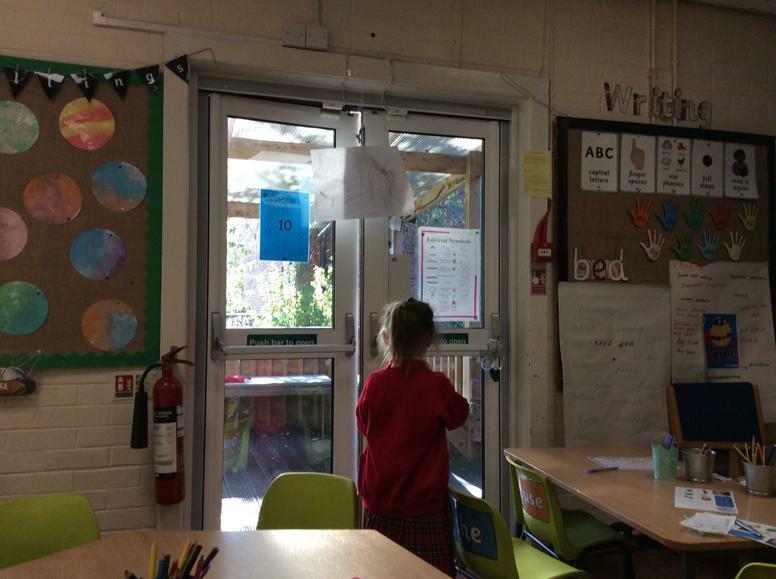 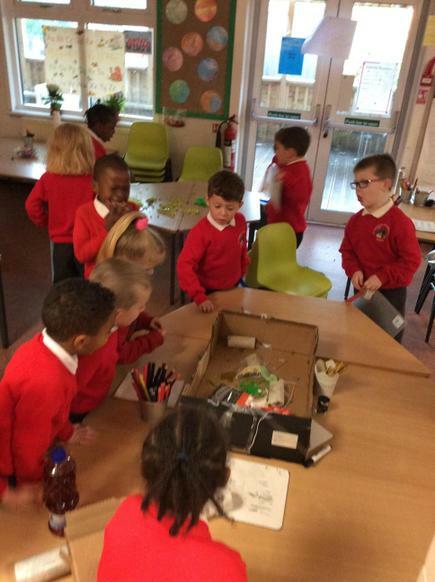 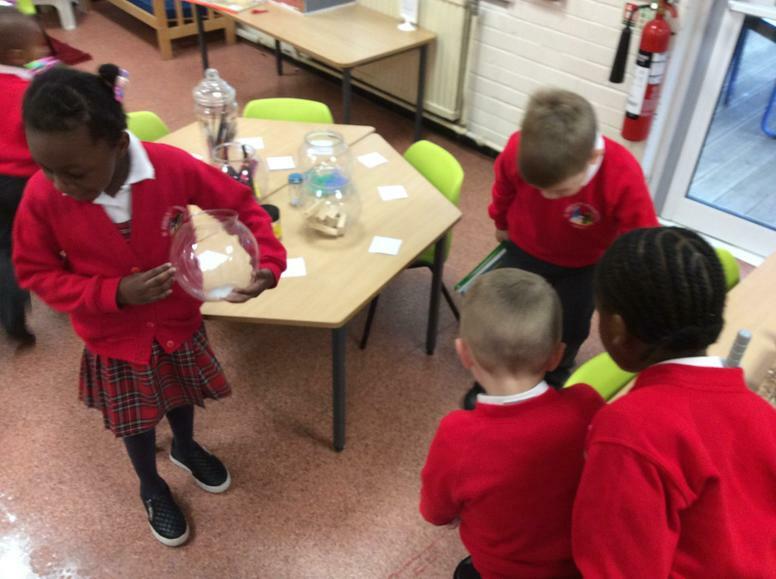 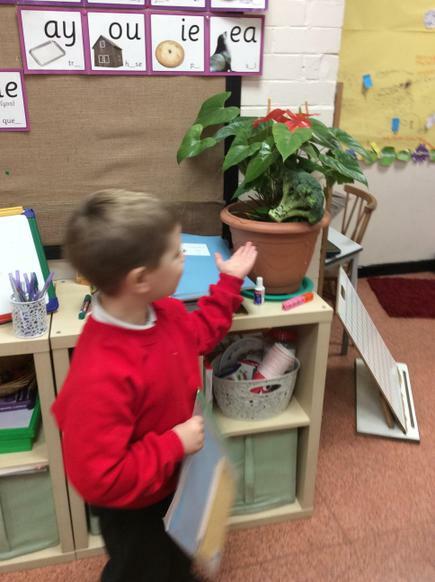 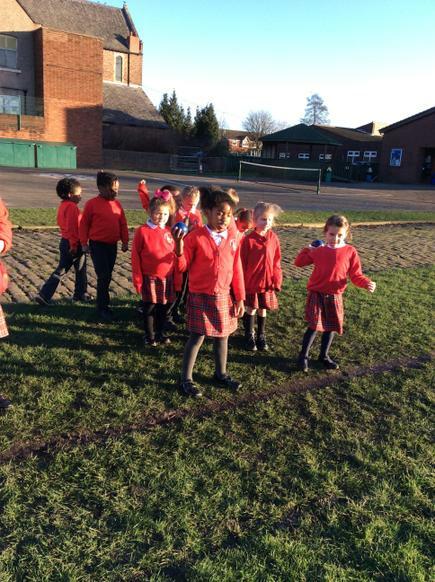 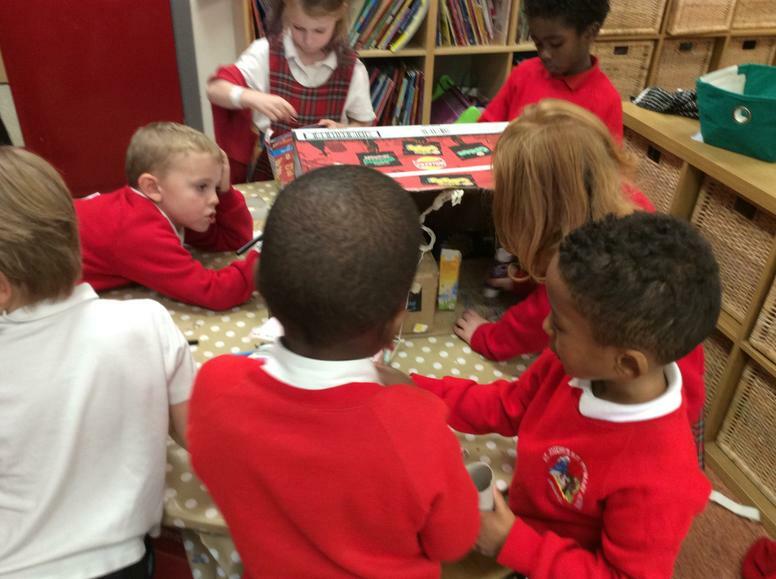 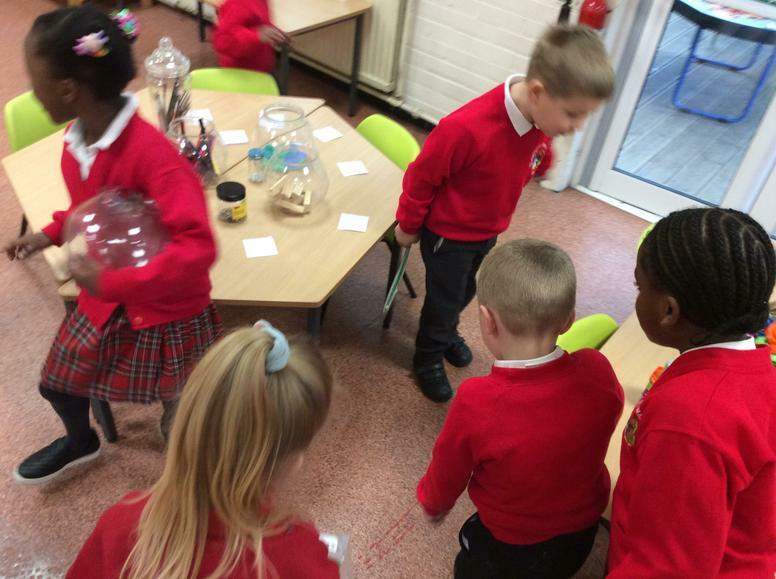 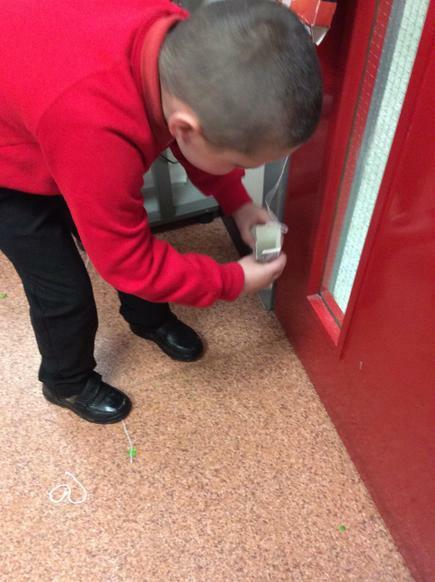 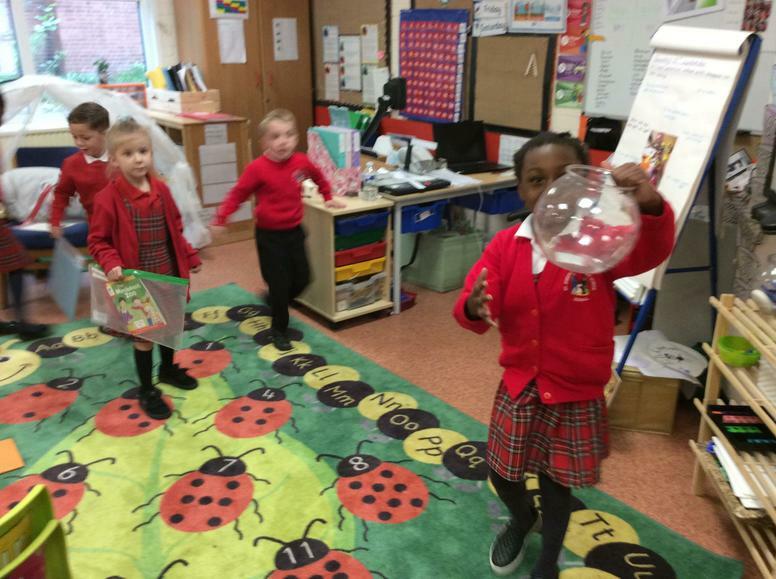 In science we have been looking at the different seasons, weather, clothes and any other changes we can find. 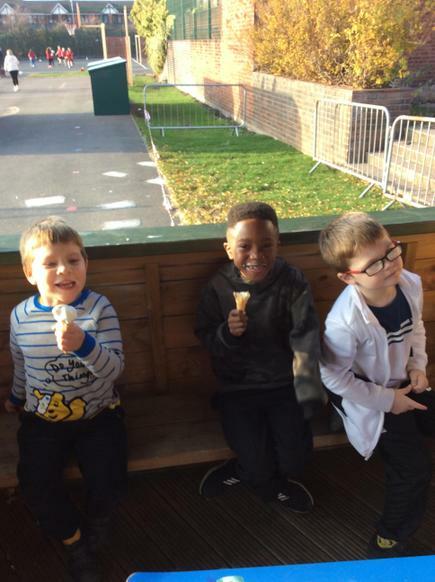 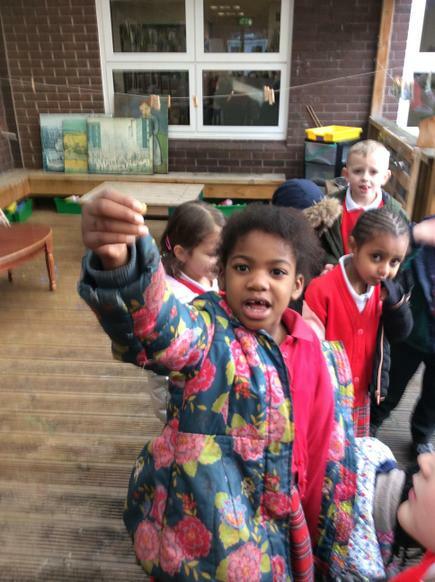 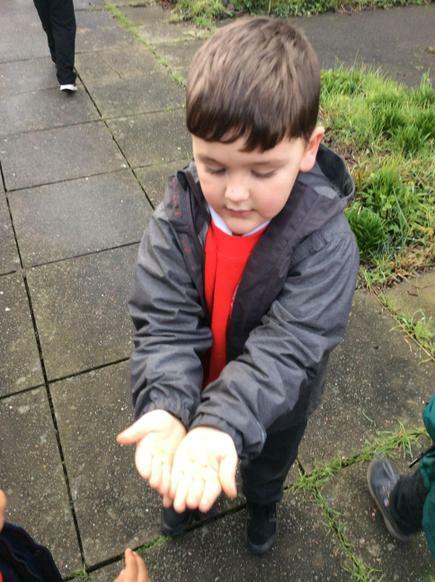 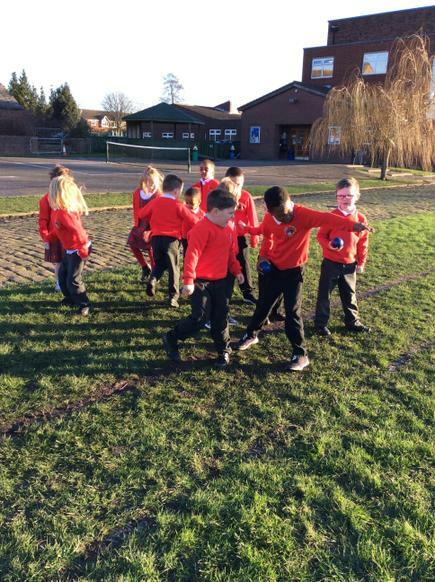 We put on our coats and went on an autumn walk and spotted lots of fallen, crunchy leaves of different colours, conkers, pine cones and we were fascinated watching our breath on the cold morning. 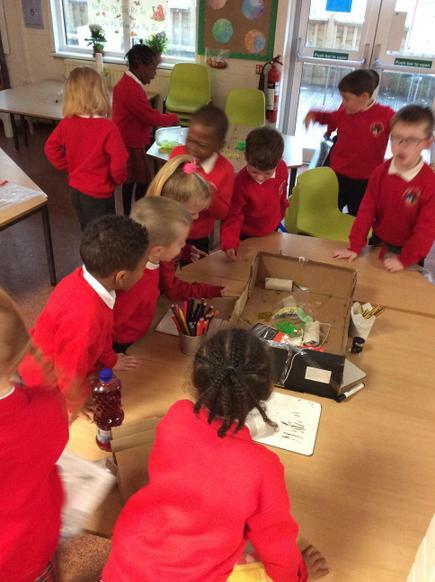 In History we are looking at toys from the past. 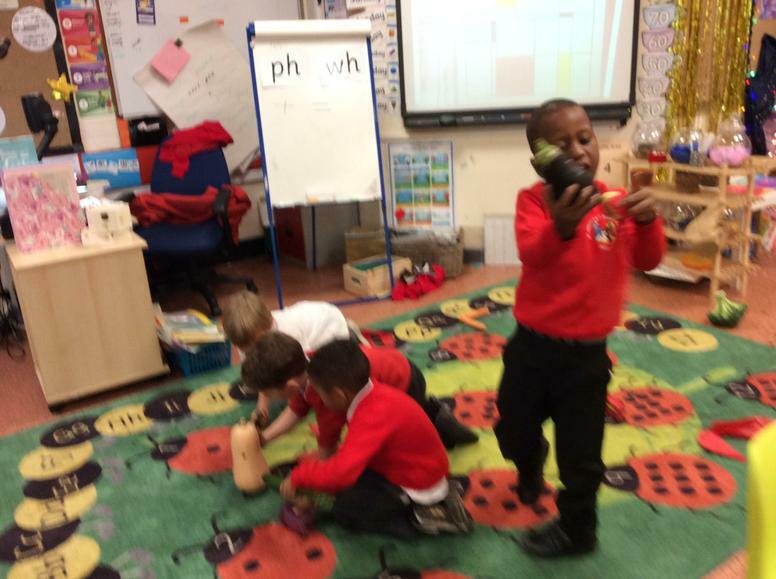 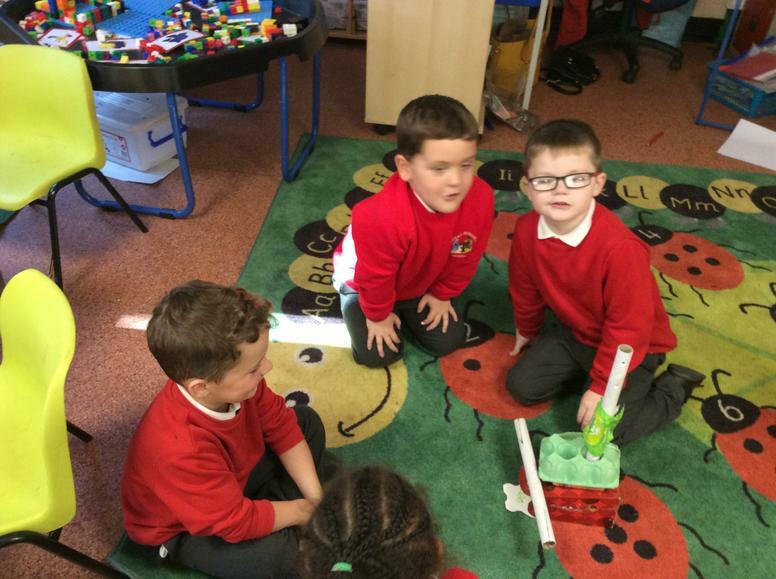 We have talked about the differences between toys now and then and the different materials the toys are made from. 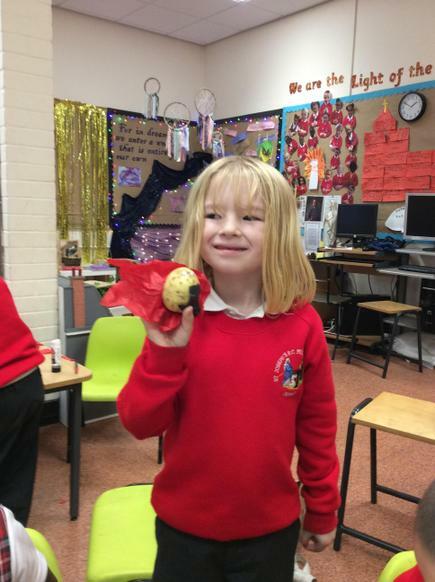 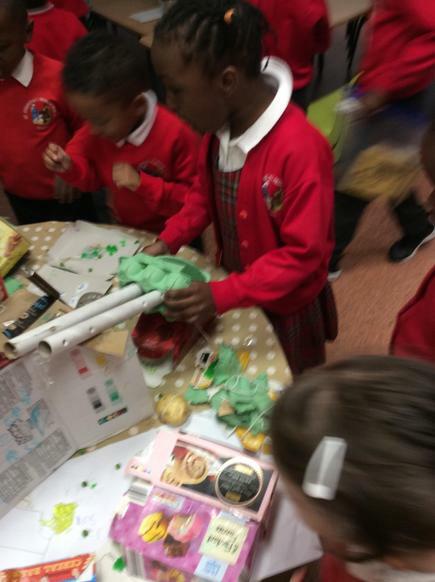 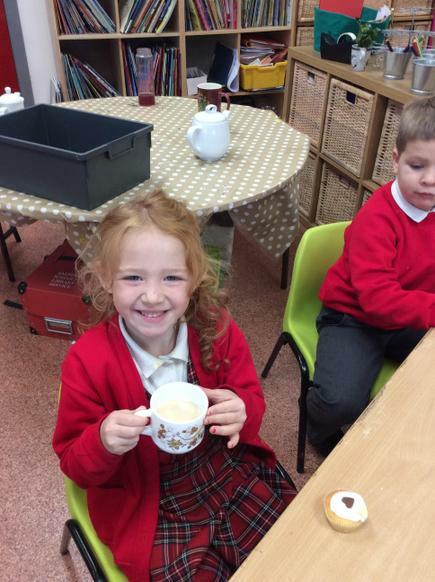 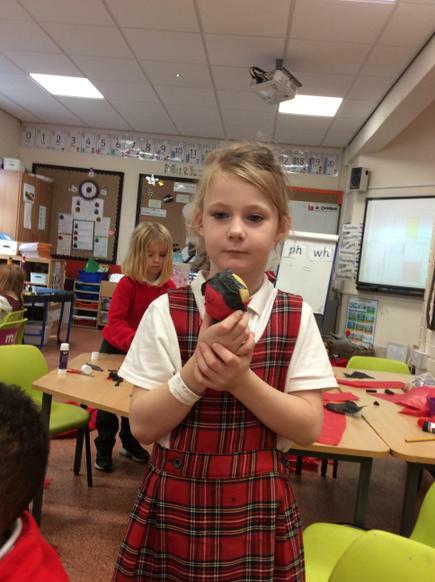 This week the children have played with Victorian toys and had a go at making their own toys, they made cup and ball games and peg dolls. 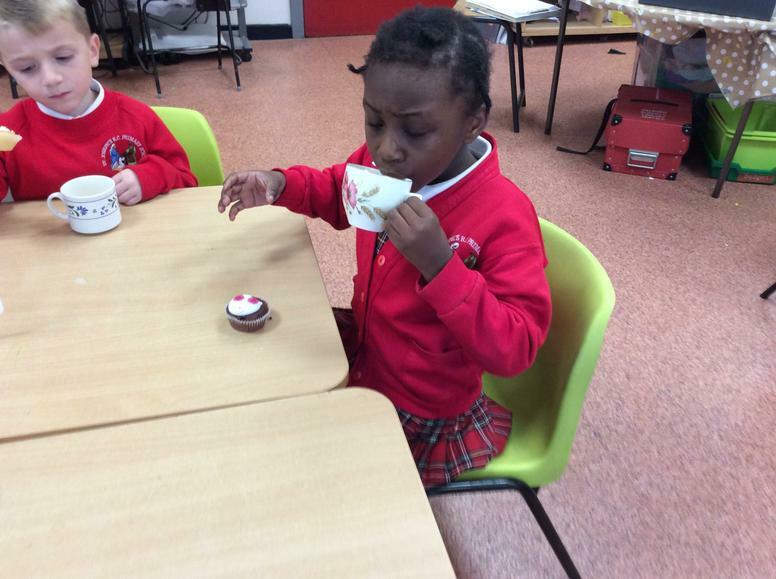 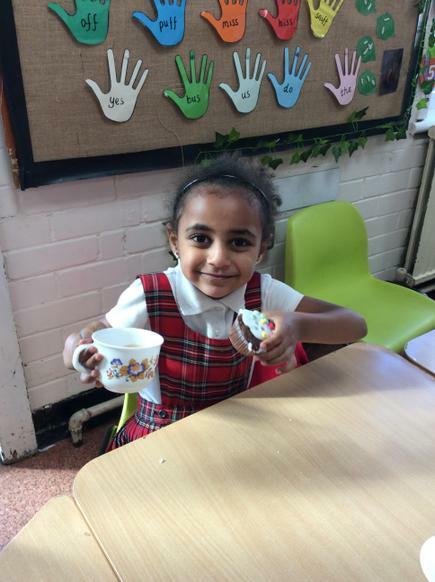 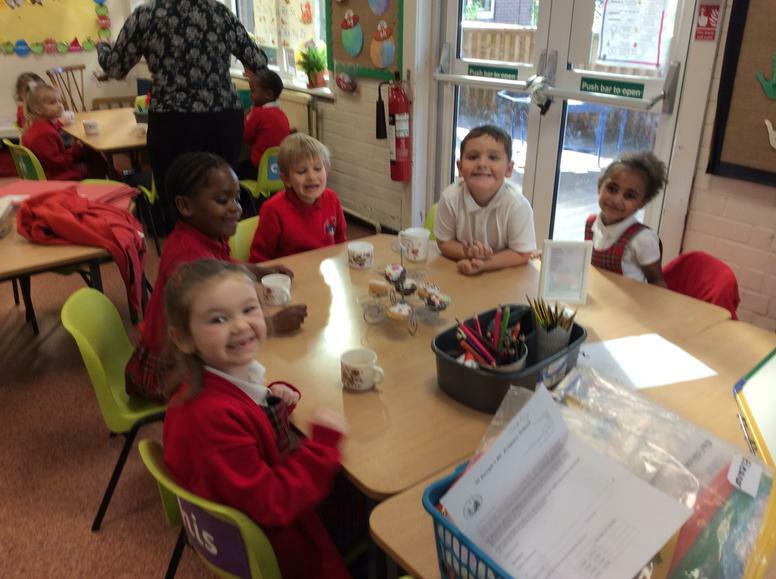 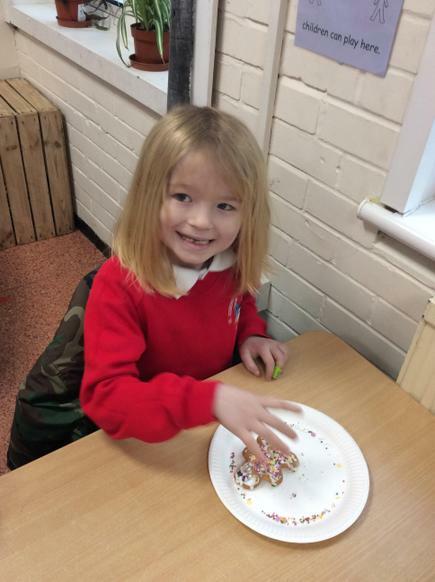 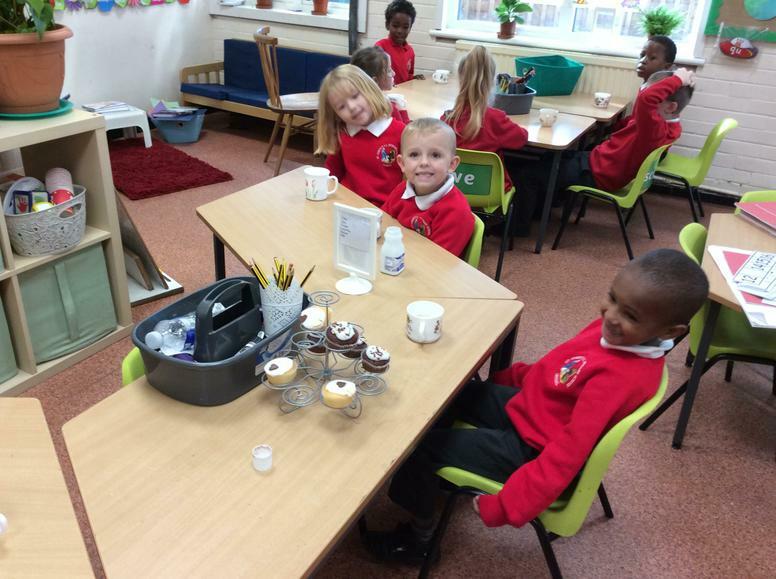 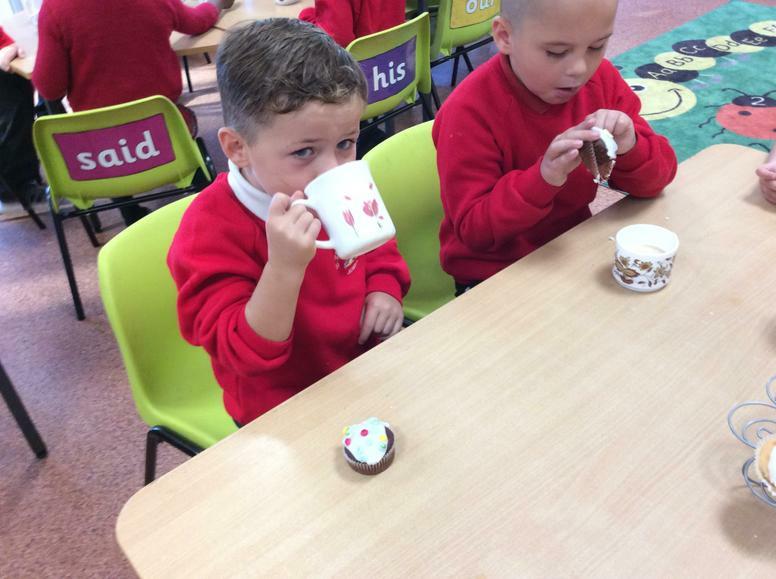 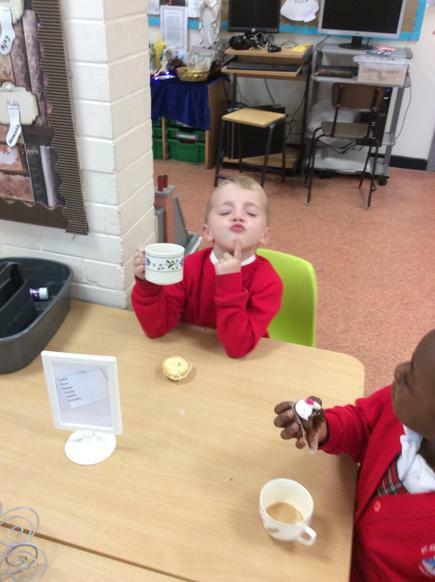 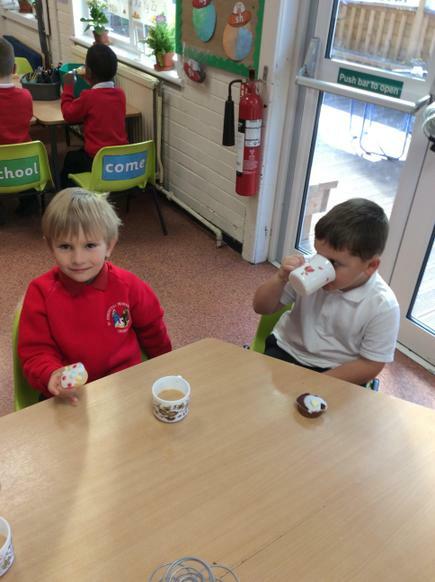 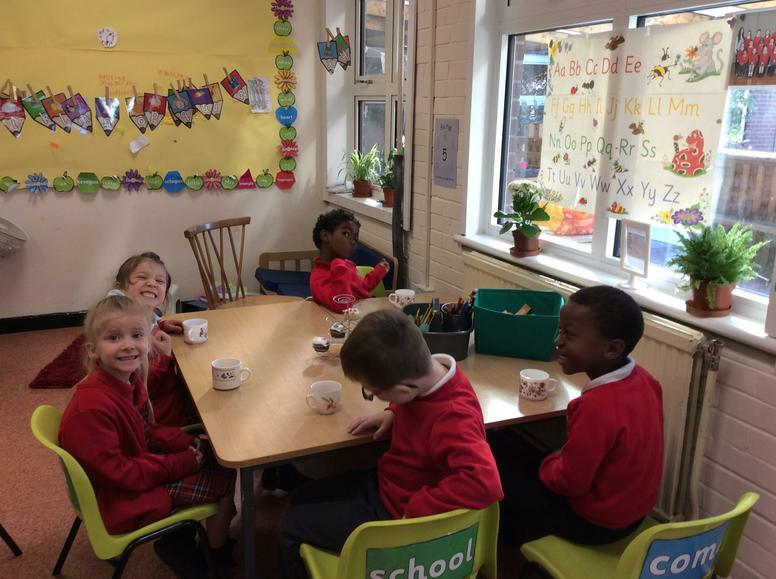 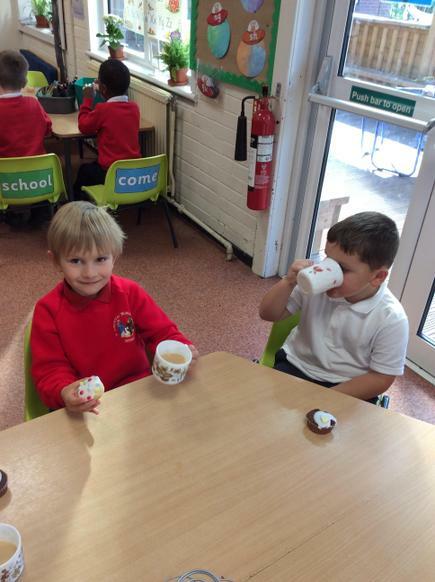 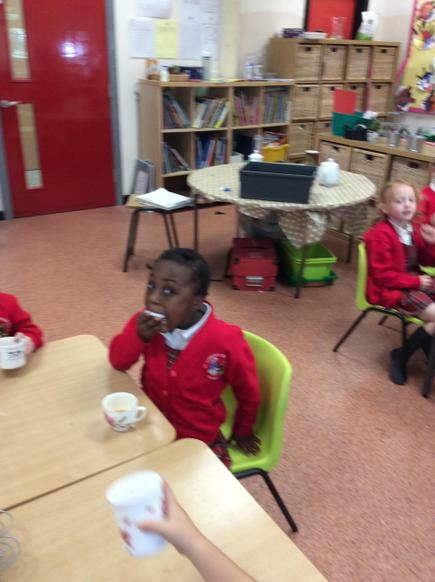 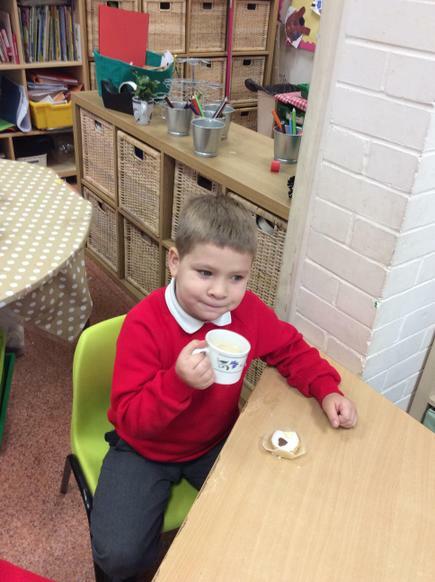 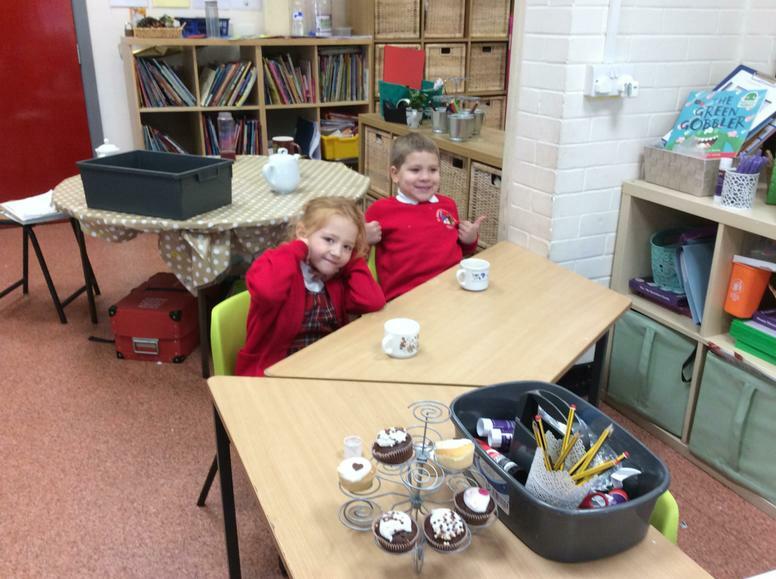 We had a lovely time for the Macmillan coffee morning, as well as going into the hall and donating with our grown ups we had our own tea, cake and a chat in class. 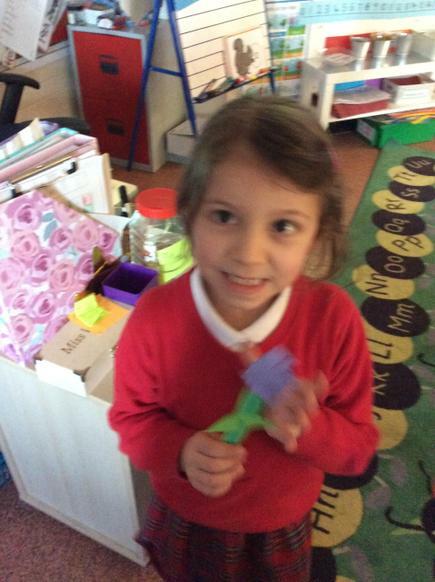 We have had such an exciting week this week! 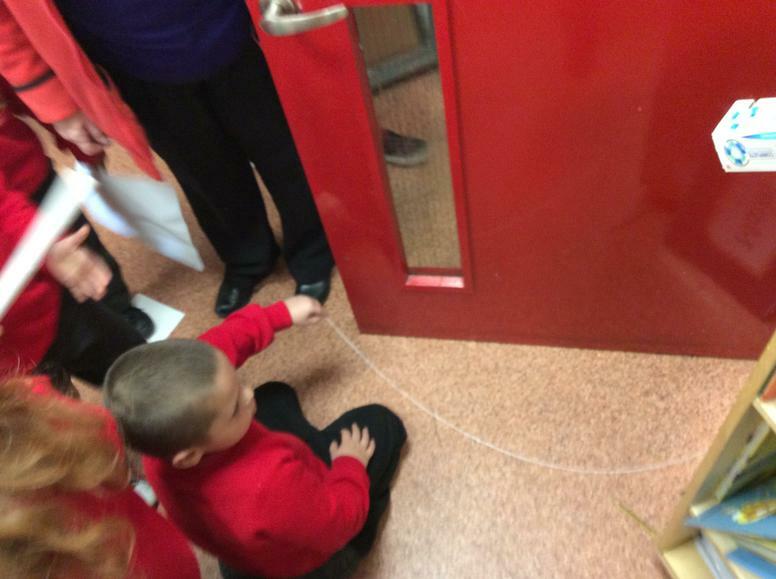 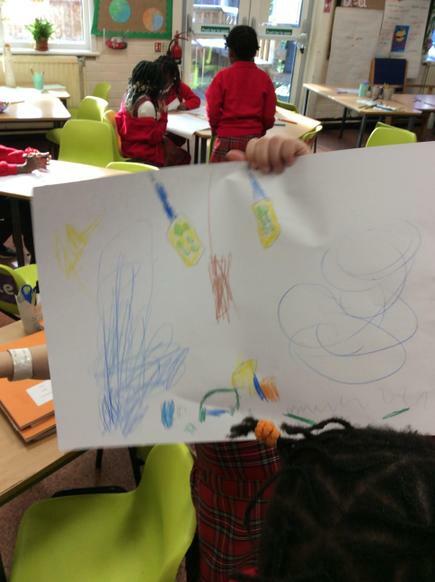 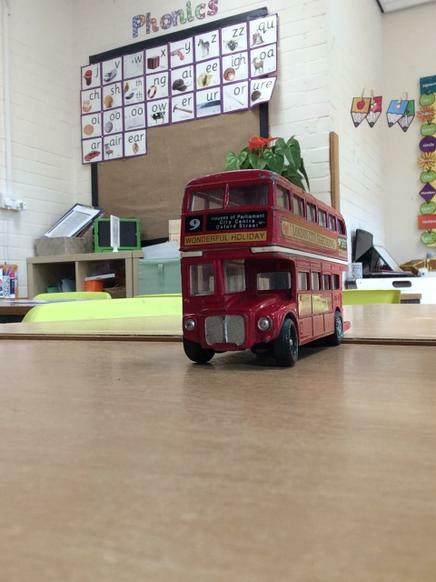 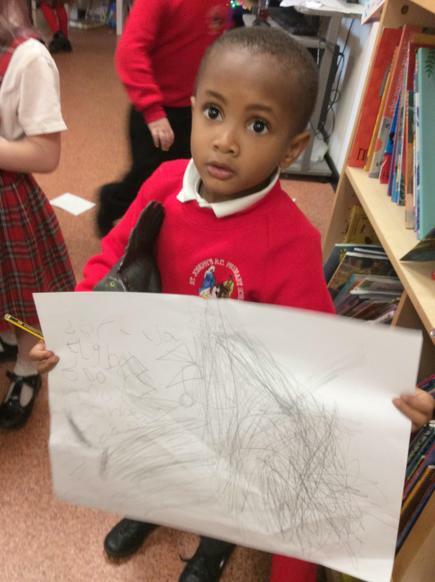 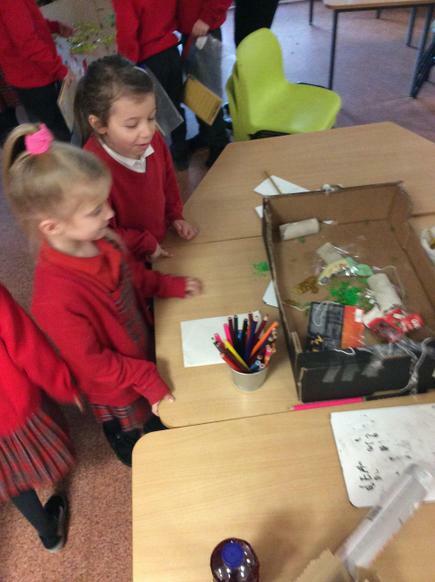 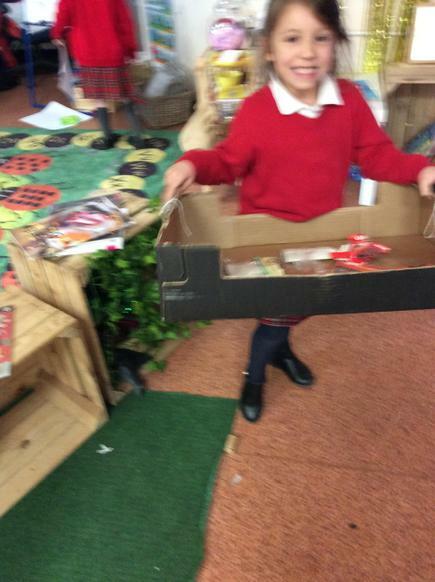 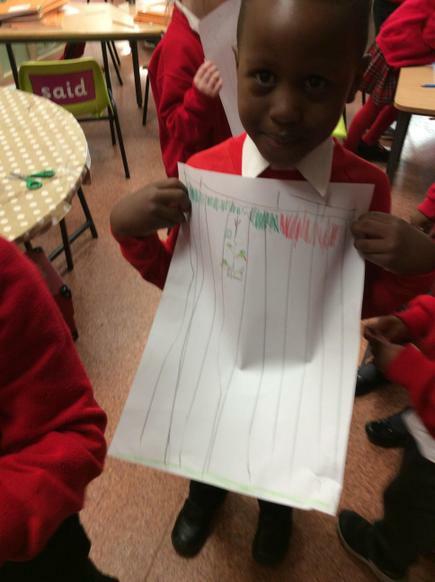 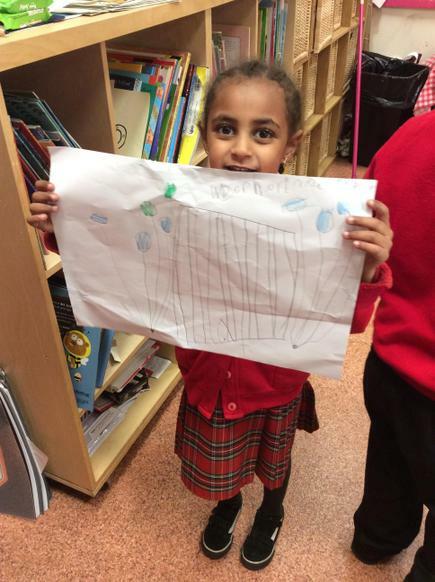 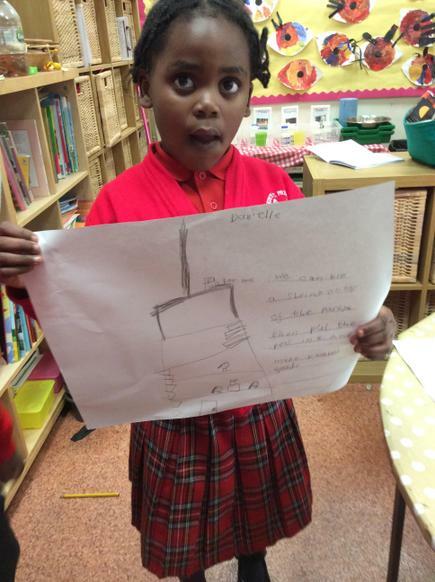 We have been predicting the story of the naughty bus and then we were visited by a real naughty bus. 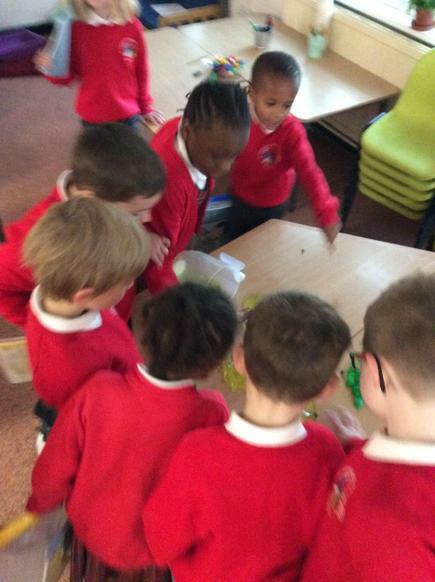 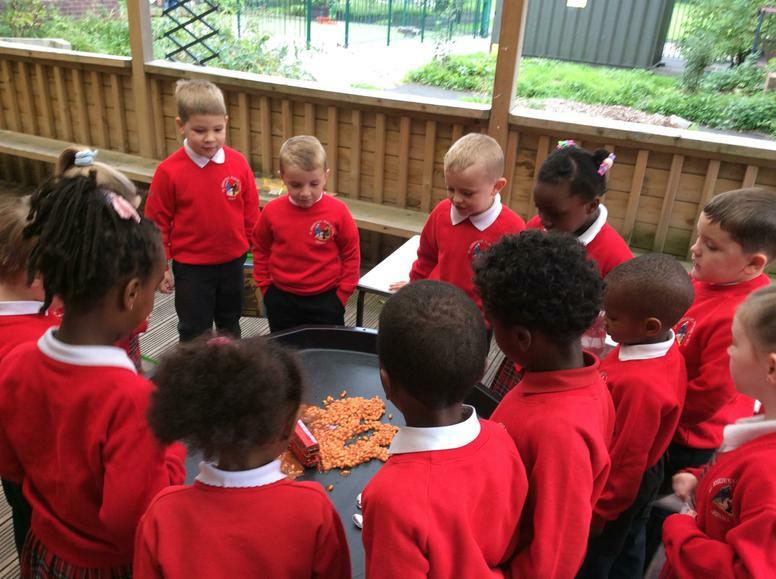 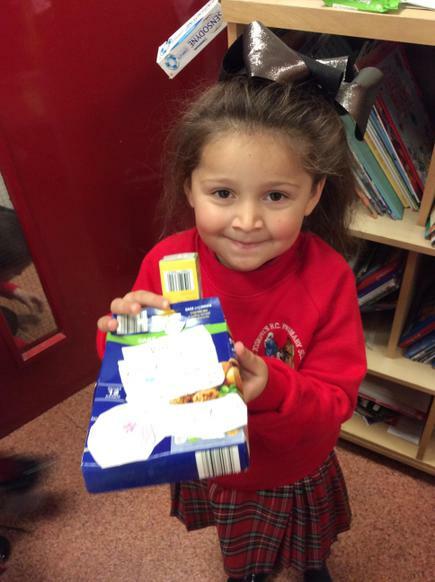 We followed the clues in class and found the bus in a pile of beans! 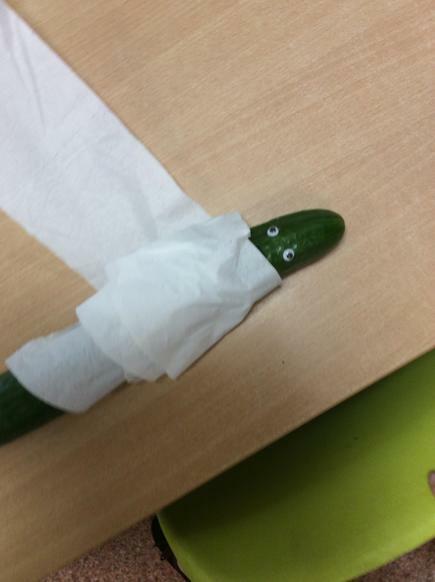 He was a naughty AND dirty bus now so we gave him a bath. 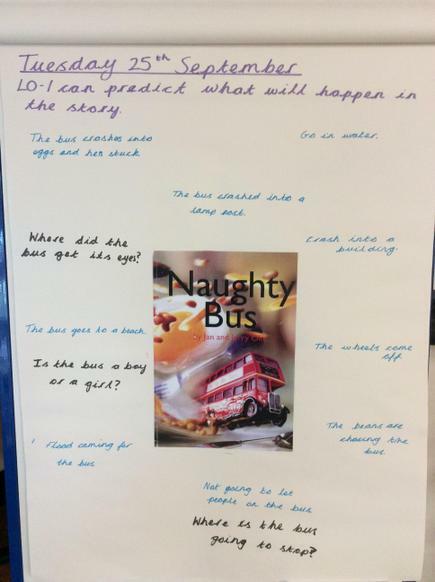 We then made up our own adventures for the naughty night bus. 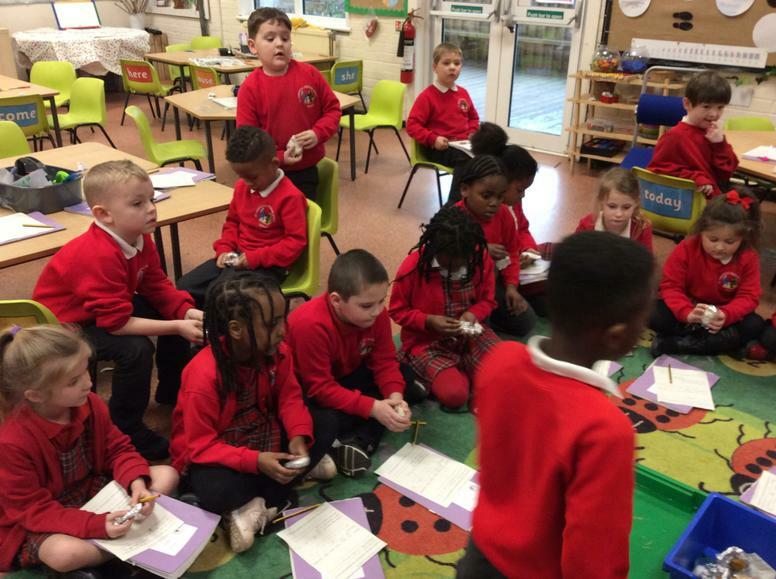 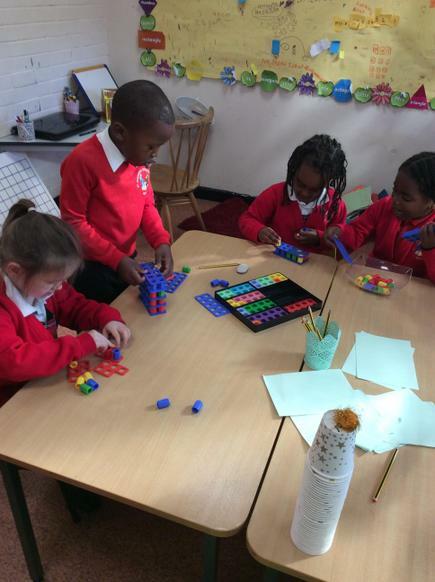 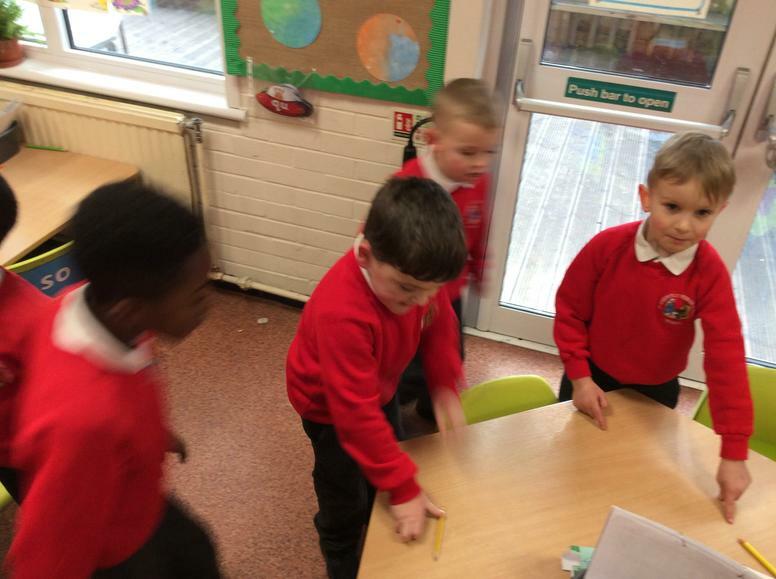 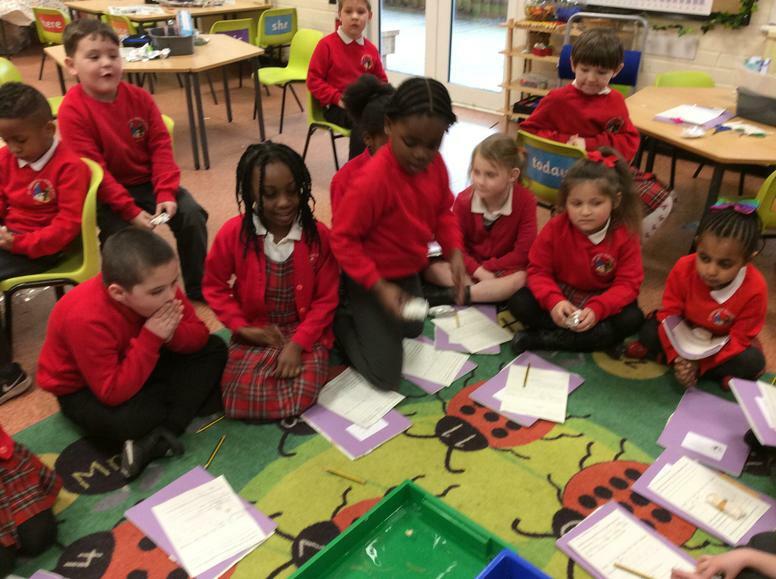 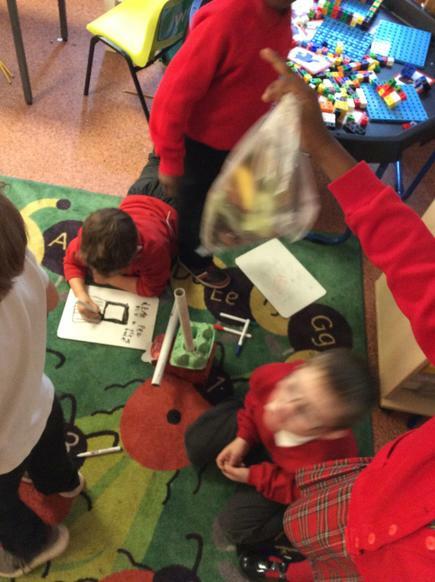 The children have worked hard comparing numbers this week, they used cubes and Numicon to make, order and compare the greatest and smallest numbers. 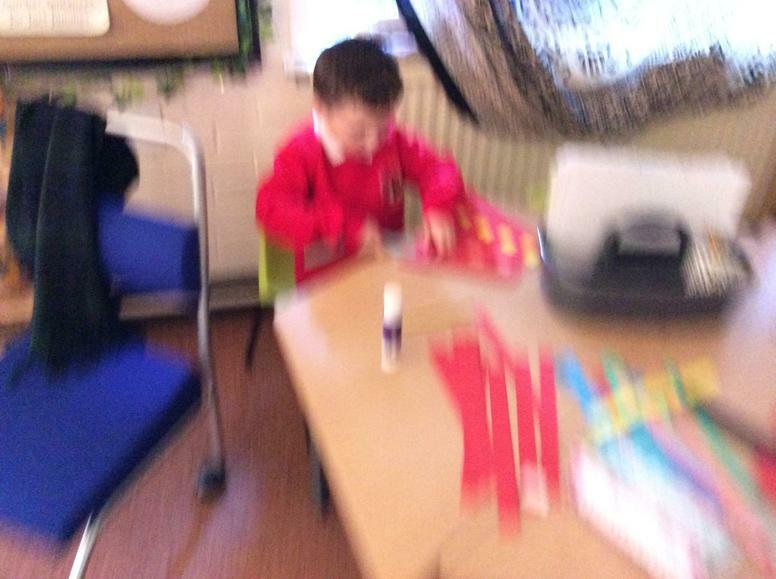 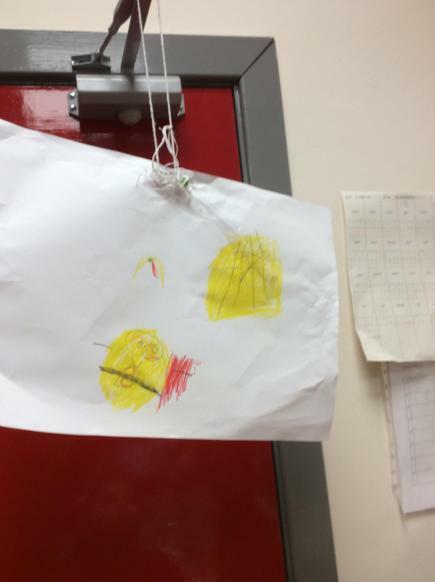 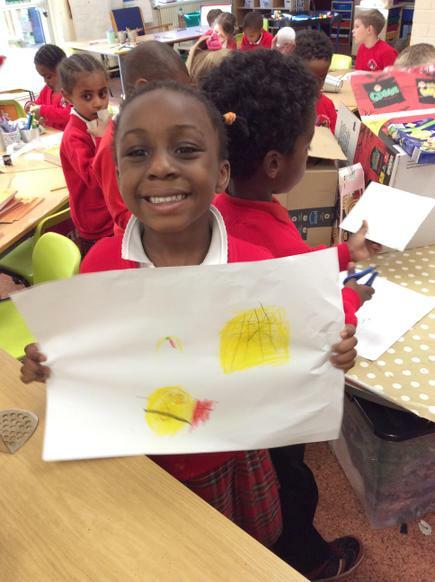 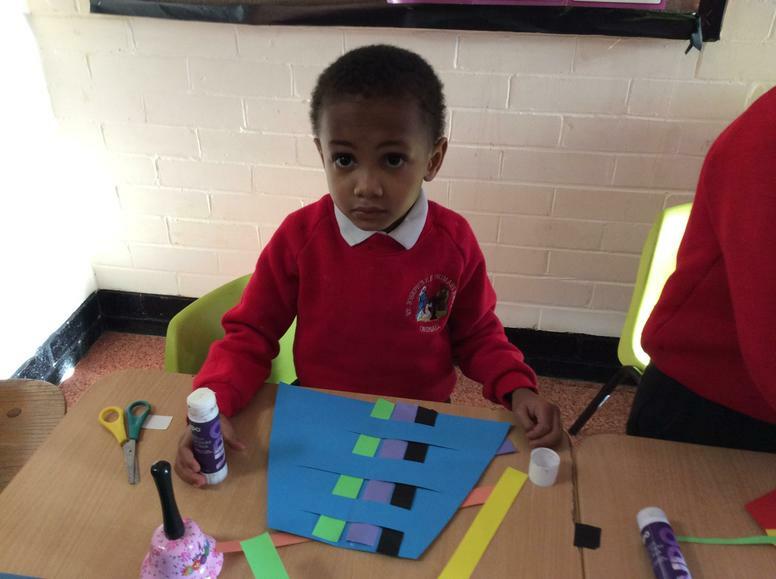 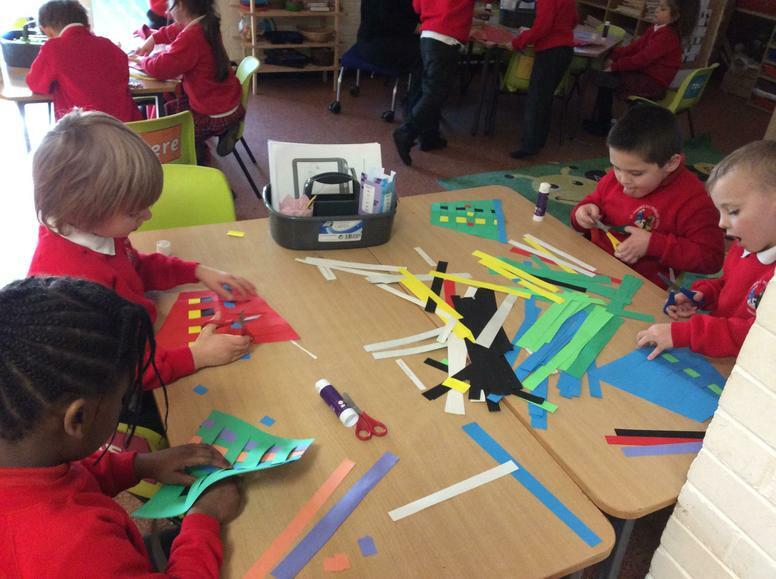 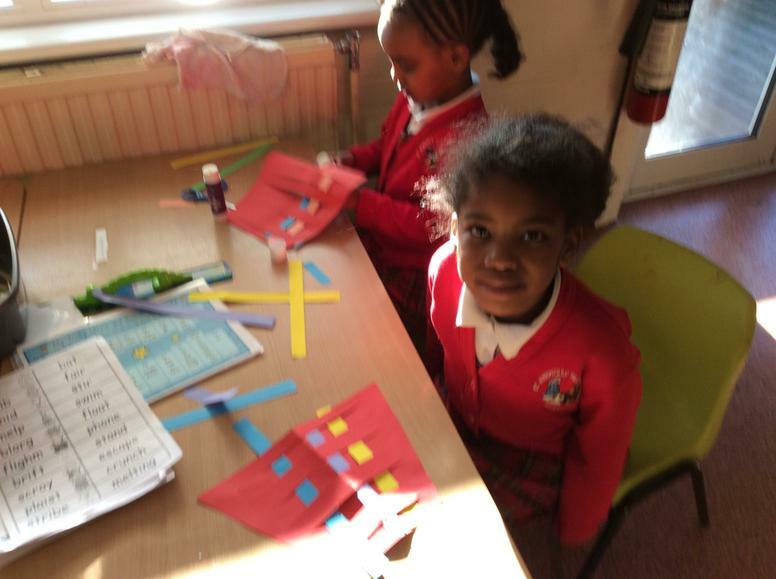 They have also enjoyed experimenting with primary colours and mixing different eye colours. 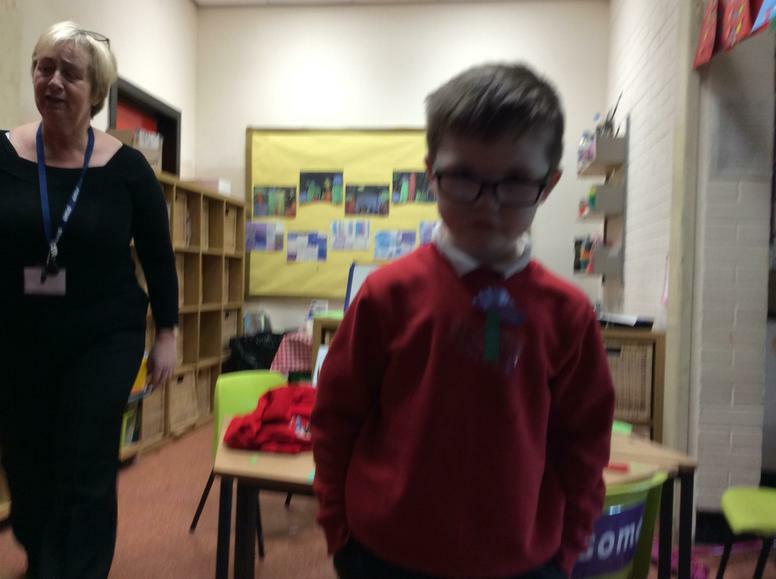 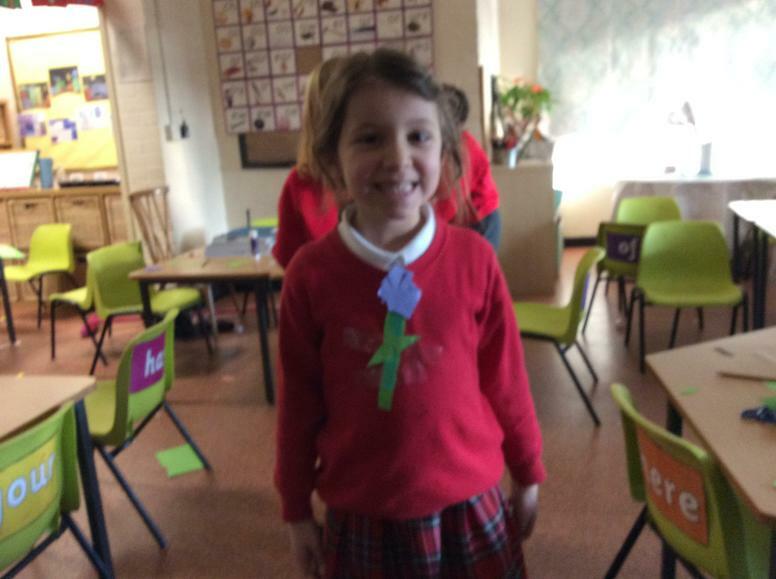 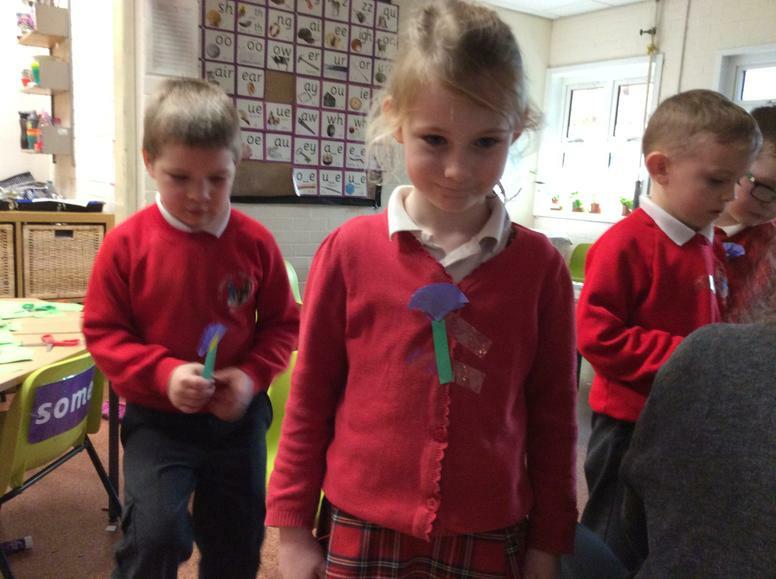 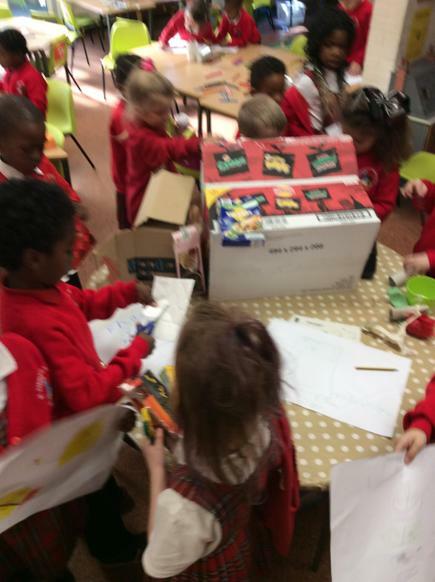 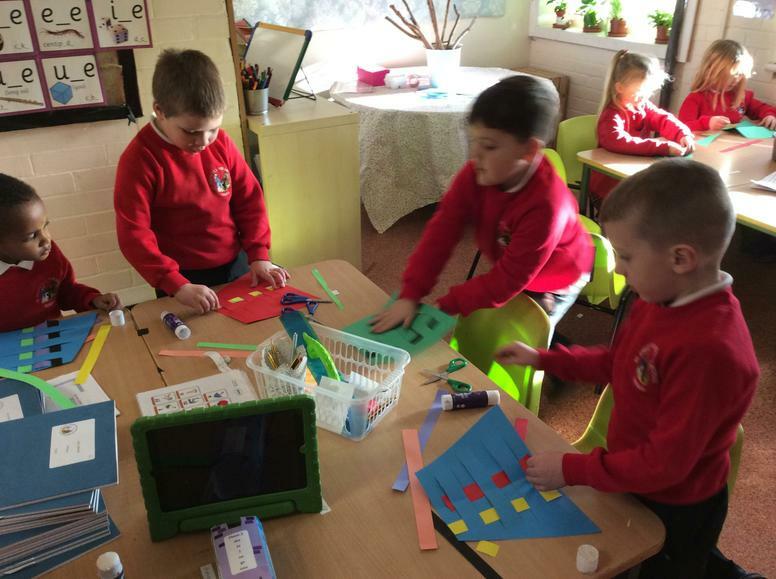 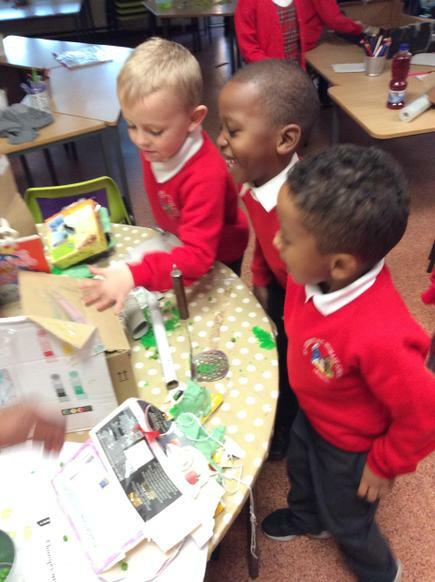 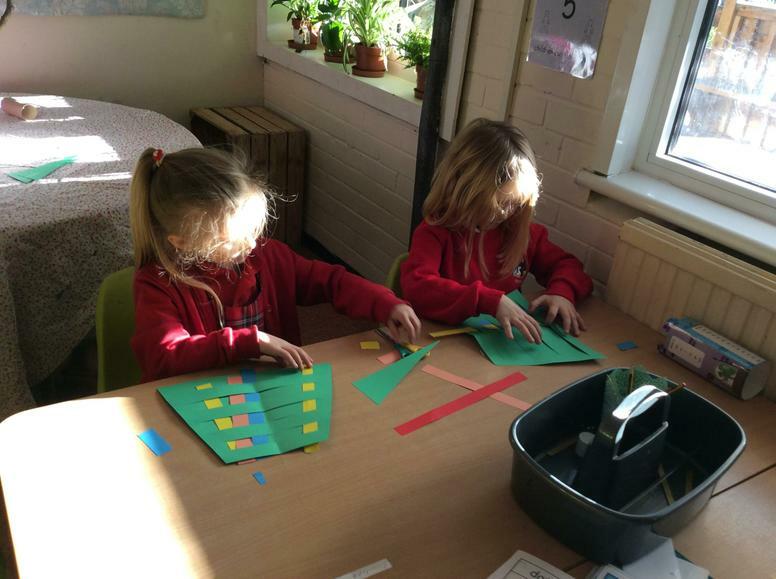 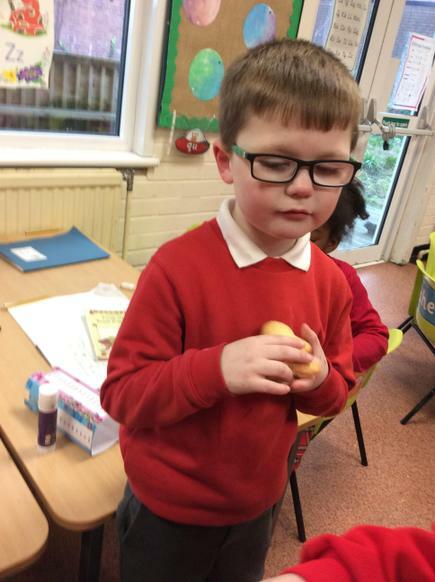 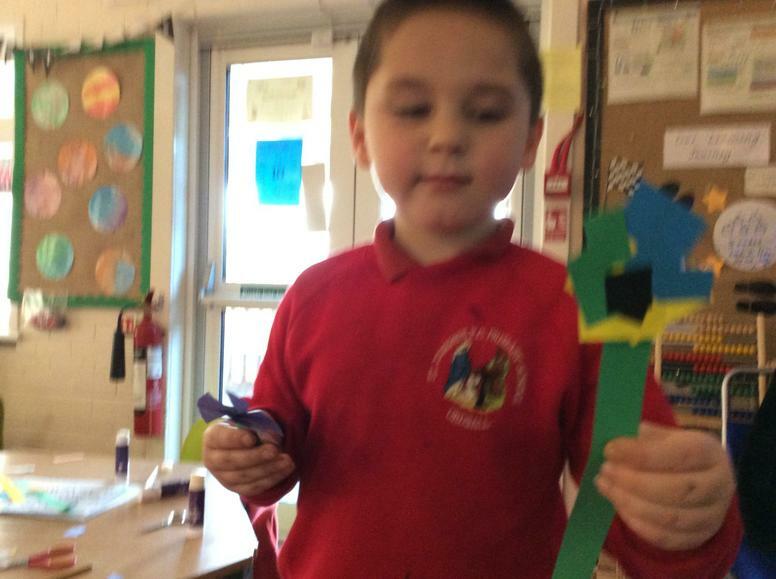 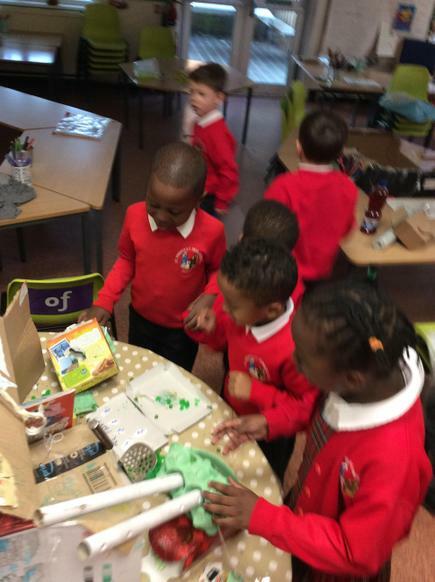 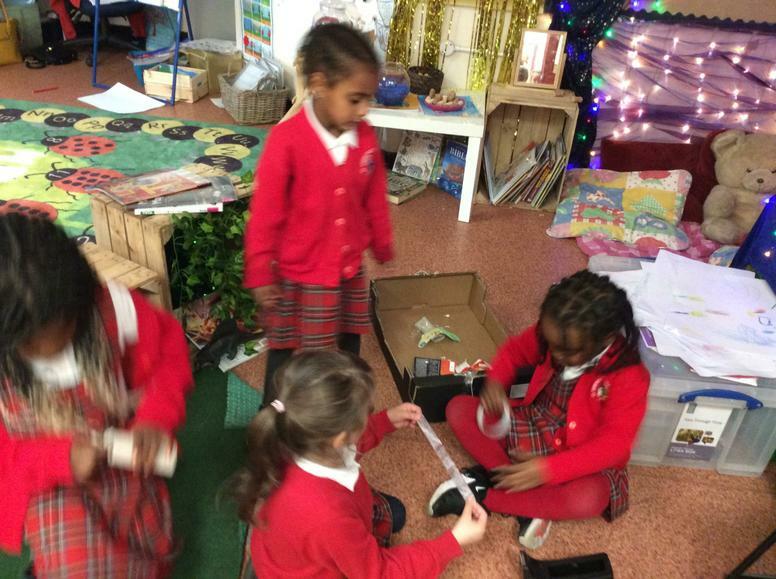 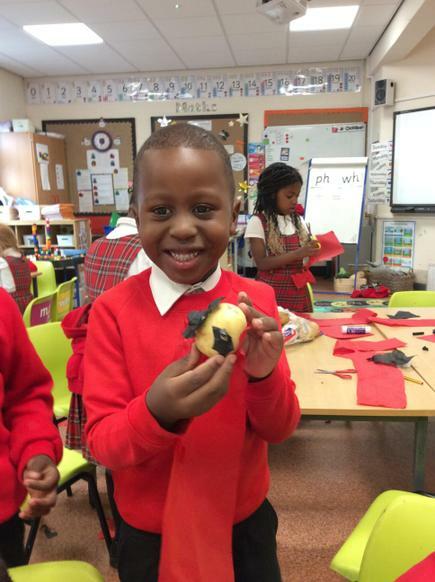 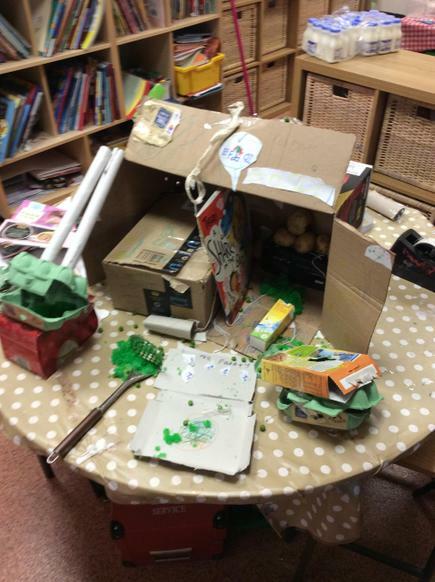 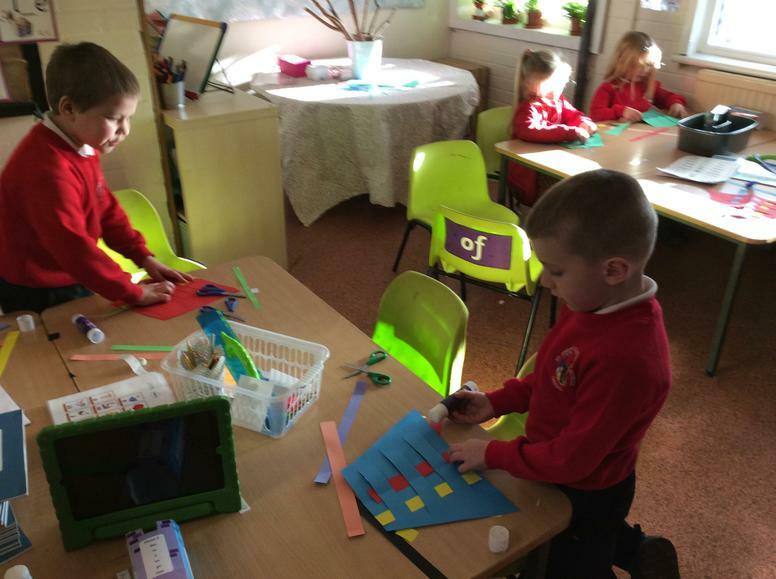 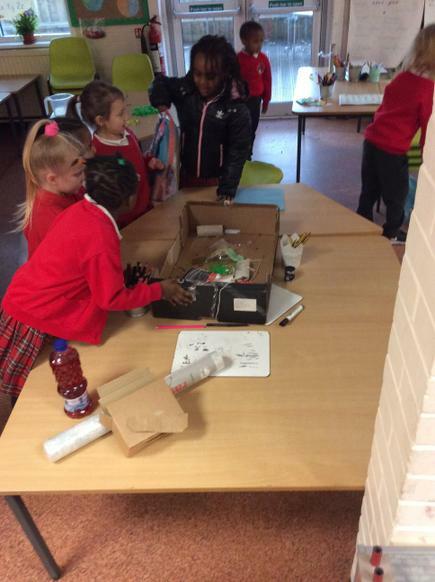 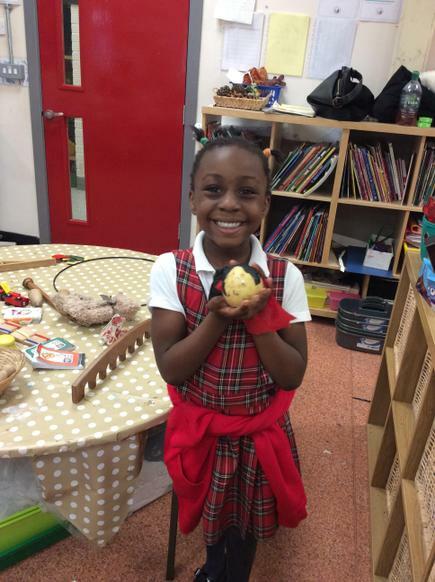 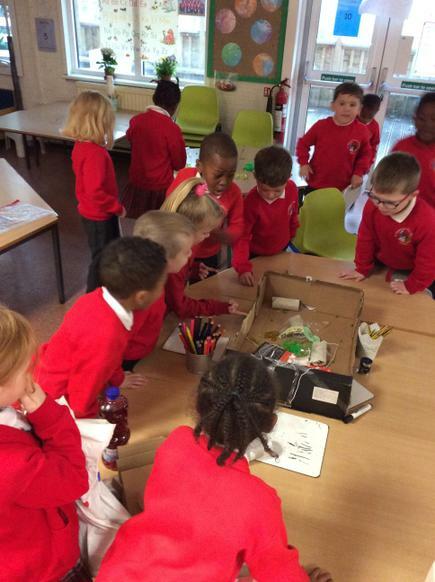 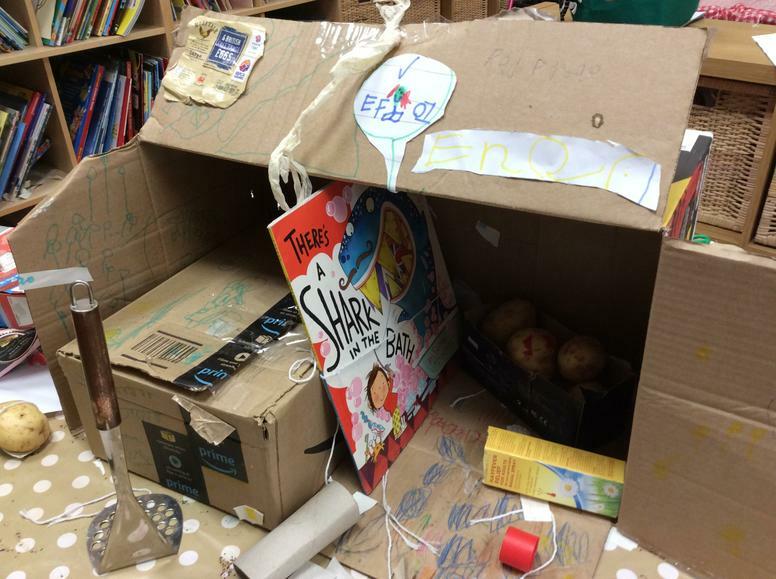 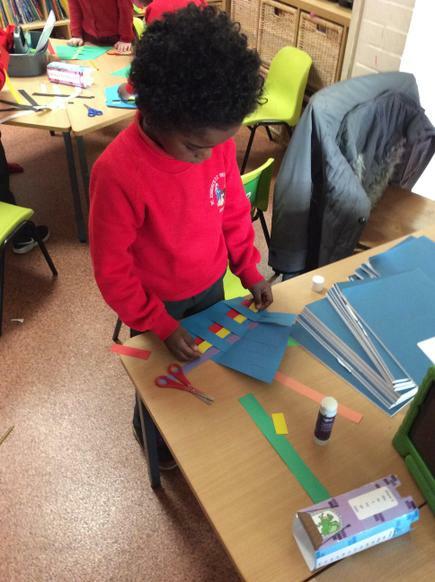 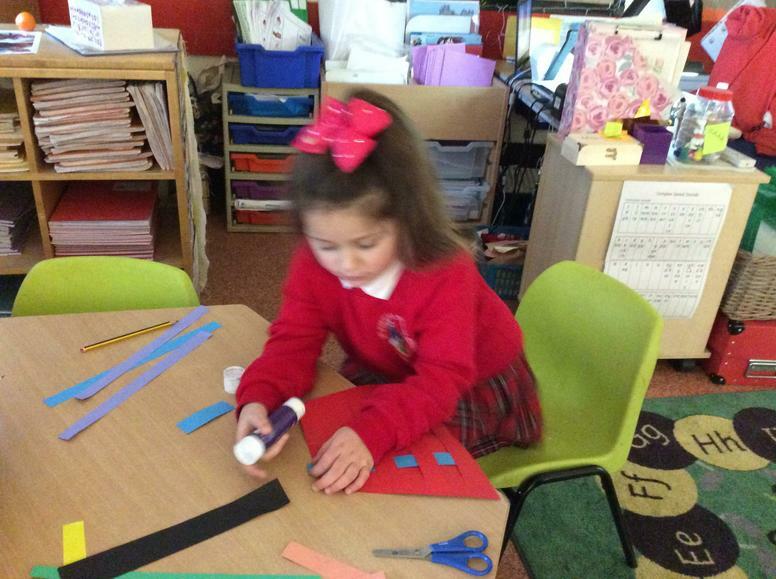 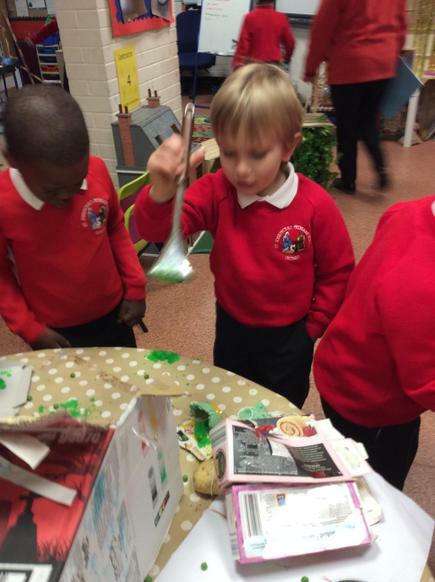 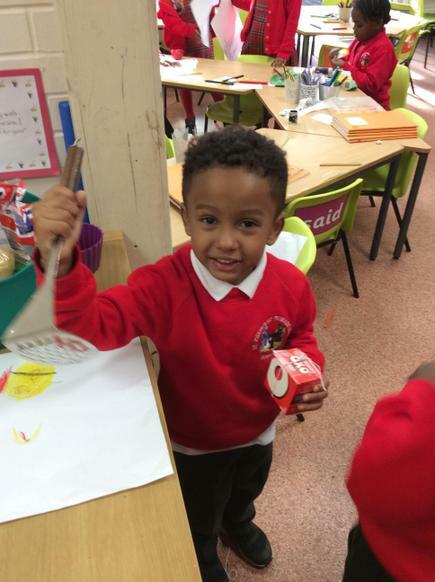 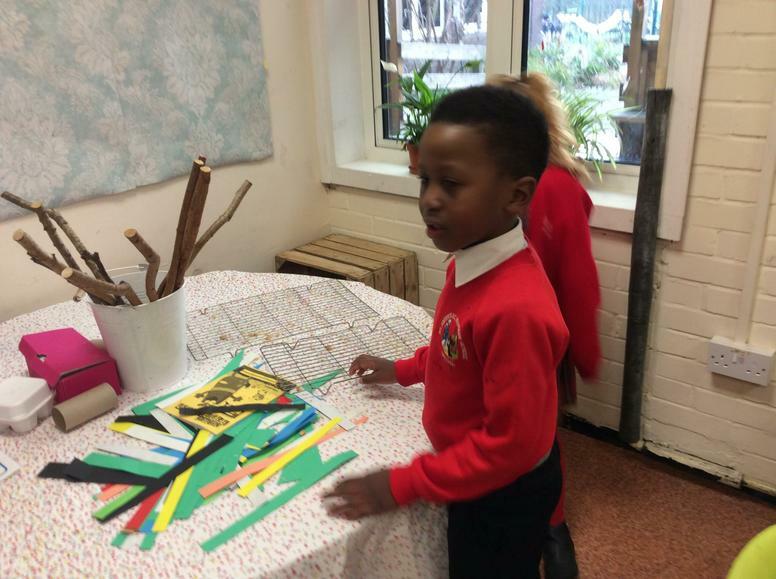 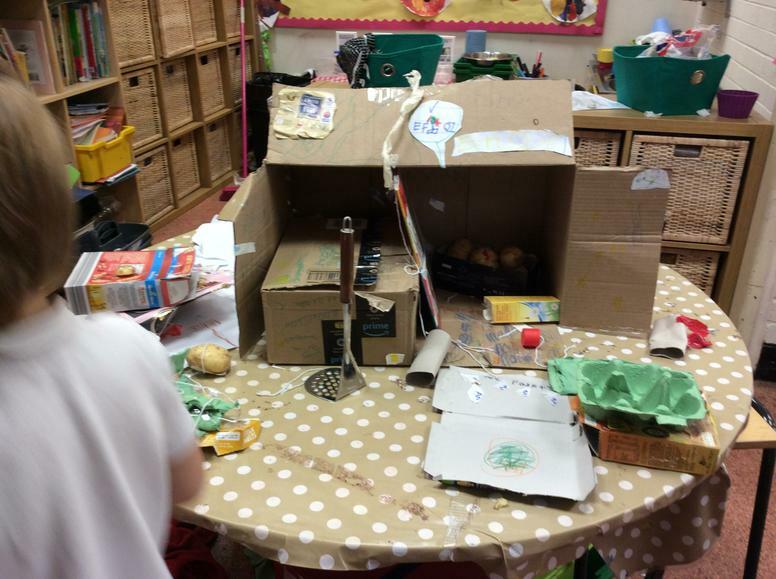 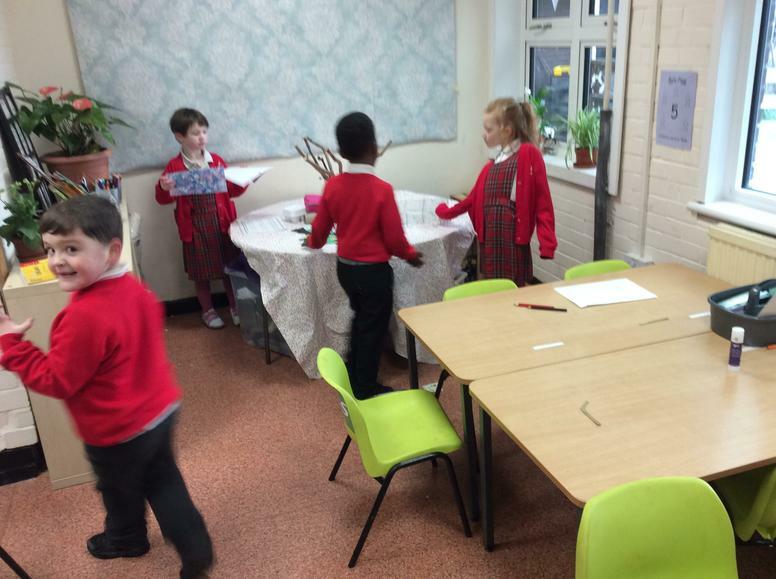 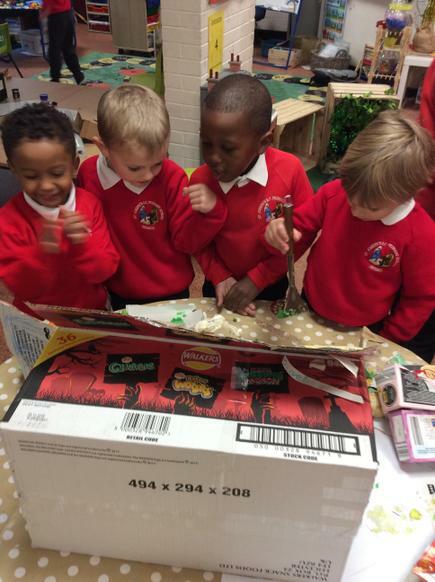 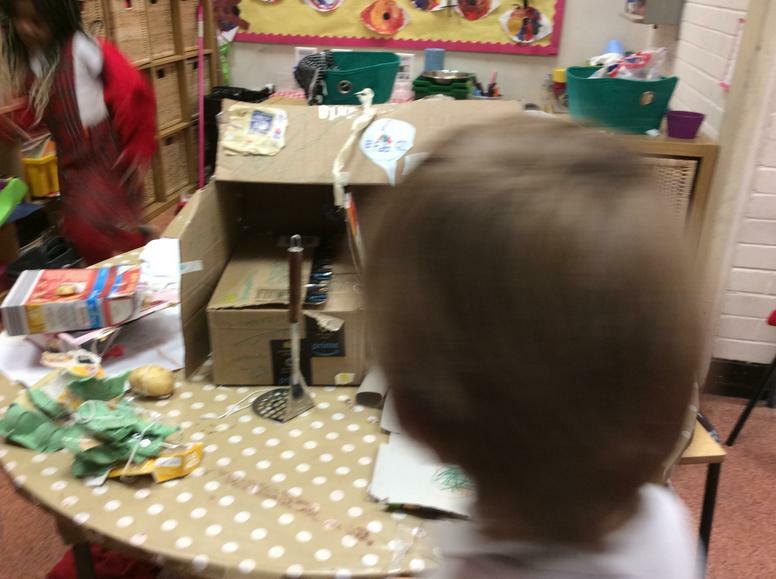 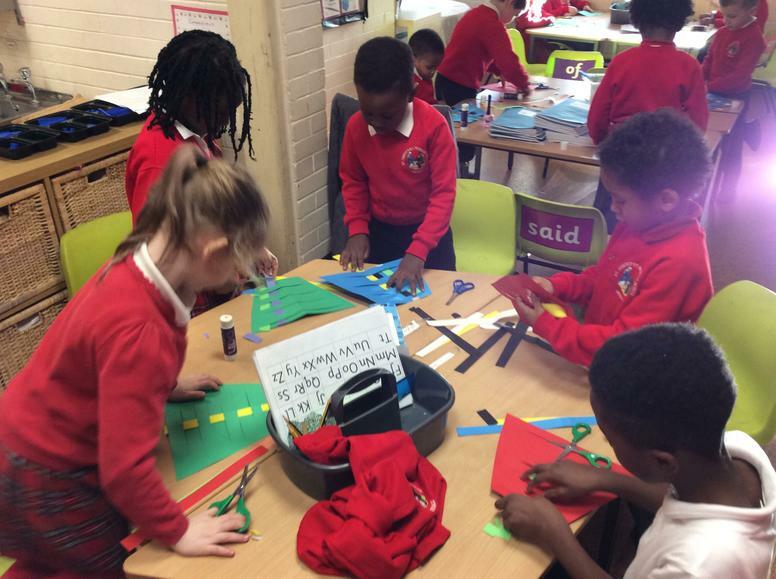 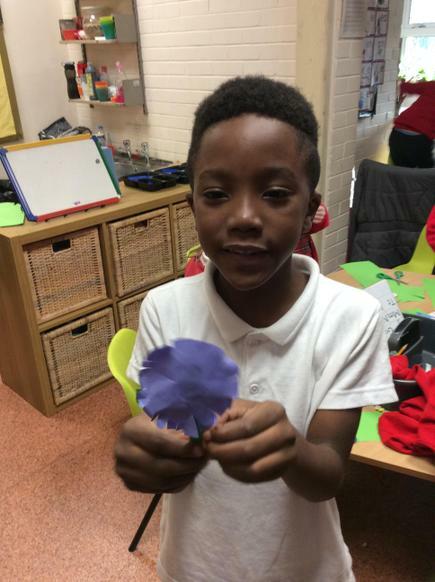 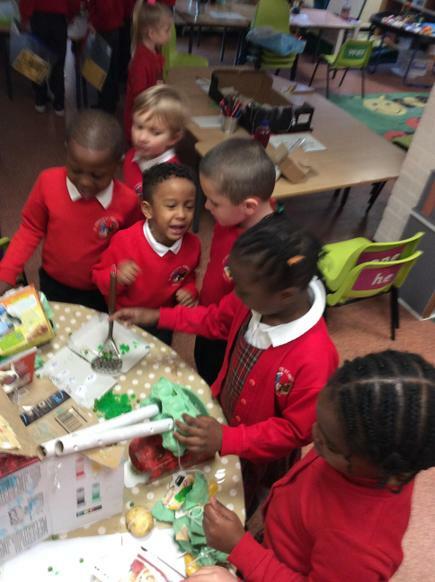 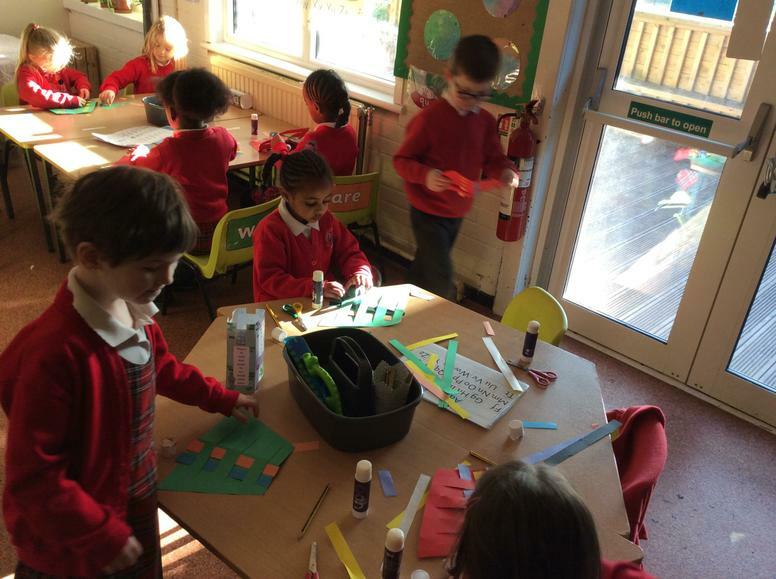 The children have settled into their new class and have enjoyed playing in the school role play, cutting and sticking in the making area and playing outside.